We have finally made it to the west coast , the pinnacle of our US. Its been a long and sometimes rough journey but we felt blessed to have made it to this point. Driving back into the US was bittersweet…we had missed the efficiency and ease there was to travelling in here. Lots of big towns where we could buy lots of much cheaper food and gas. On our first night we slept at the Bellingham Walmart in Washington state and was surprised by the amount of interesting characters that joined us there. For the first time we weren’t the only vehicle there that wasn’t a fully contained RV, in fact there were a bunch of people sleeping in their cars, some even had their pets with them in cages. We drove down the I-5 toward Seattle next. We have learned through numerous experiences that that driving into a city of such size never ended well. Firstly there is never anywhere we can sleep because the campsites are always overpriced. Secondly, driving in a city never involves careless sightseeing…while I am trying to navigate us around the tollgates and toward some scenic point, poor Marius is trying to dodge city slickers who know exactly where they are going and how they want to get there. If we are lucky we get to the scenic point on our second try but then finding parking which is cheap, available and able to accommodate the cruiser is almost an impossible task. Thirdly, by the time we have sorted all this out, we are more than slightly frustrated with the situation and each other that we might as well skip the scenic point all together. Nowadays we feel content driving through a big city and taking photos of what we can as we drive. The first opportunity we got we stopped and got our second US takeout pizza to celebrate Marius’s birthday as well as my dissertation that I finally finished…this time the supersize Papa John with the works, not bad at all..but still prefer the Pizza hut buffet. From Seattle we headed west toward Olympic National Park. This park is known for its wilderness beaches, the largest old-grown forests in the Pacific Northwest and rugged mountains. 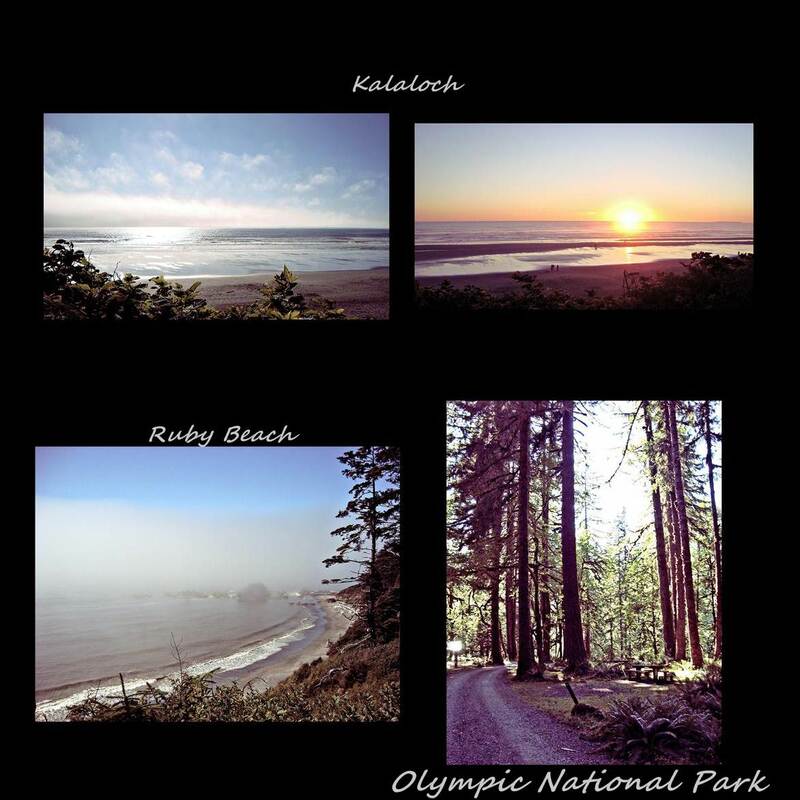 So to do this park justice we drove up a mountain to Hurricane ridge, stuck our feet in the Pacific ocean at Kalaloch campground and looked up at some mighty big trees at Graves creek campground at Quinault Rain Forest. It was a beautiful area which we will mostly remember for the great sunset over the ocean at Kalaloch. After a long wait we could finally meet up with our new friends we had made in Canada at their homes in Castle Rock. Thanks to Gary, Diane, Bob and Jeanne we were able to experience the wild animals and beautiful surroundings of the Denali National Park in Alaska and then went on to generously invite us to their homes as well. We took way too much advantage of their generosity and stayed with them for more than a few days. They took us to see Mt. St. Helens National Volcanic Monument where in 1980 this volcano blew out of its one side resulting in massive destruction of forests, rivers and land. There were also a few deaths that resulted from its eruption not due to fact that the geologists did not know that there was a rumbling below this giant. For days the volcano had smoked and seismologists had been monitoring the situation. Unexpectedly, the volcano blew much earlier than anticipated and furthermore blew out to the side instead of to the top as volcanoes normally do. Over 230 square miles of coniferous forest in the area was blown to pieces leaving only the bottom part of the tree trunks sticking out like toothpicks..in seconds whole entire mountains went from forest to barren, burnt landscape. The eruption also sent massive amounts of debris along rivers resulting in a silt/mud slide which can still be seen for miles. We went for one of the scenic hikes from the Johnson Ridge observatory with Bob and Jeanne and we amazed ourselves by walking a whopping 18km/11.2miles! 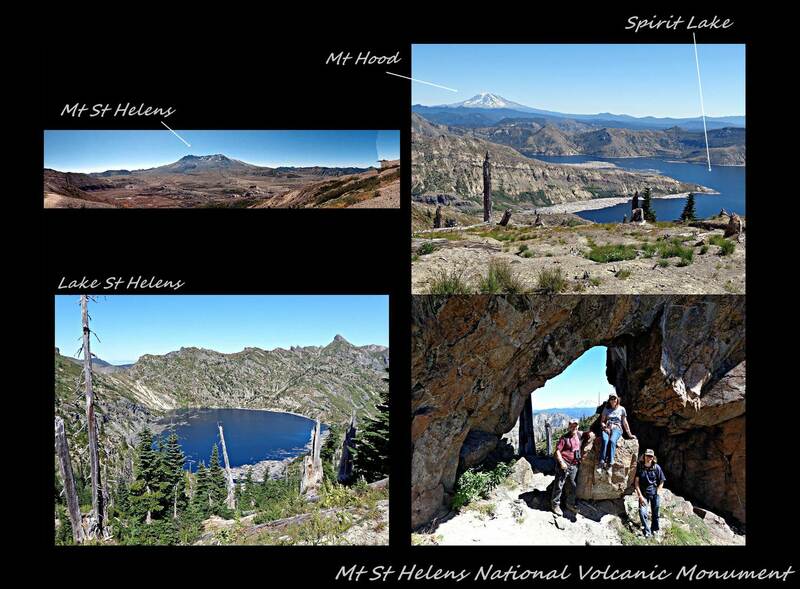 The views of Spirit Lake, Mt St Helens, and Lake St Helens was amazing once we finally reached the rock arch which was our goal and it made all the effort of getting there so worthwhile. I’d just like to take my hat off to Bob and Jeanne who, at a slightly riper age then both of us, made us look seriously unfit. I hope we age as well as you guys! As if walking further than we had ever done in one day (ok only me!!) 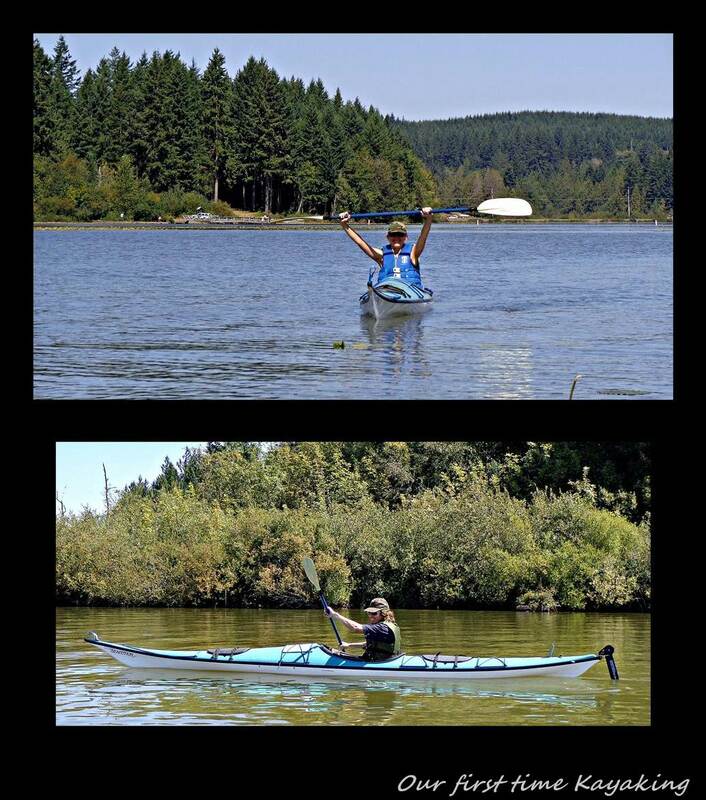 wasn’t impressive enough, the next day we went kayaking for the first time with Bob and Jeanne which were great teachers. Neither of us fell over once! After staying with Bob and Jeanne for a few days we moved in with Gary and Diane and were at this stage already completely spoiled with all the hot showers and wonderful meals. 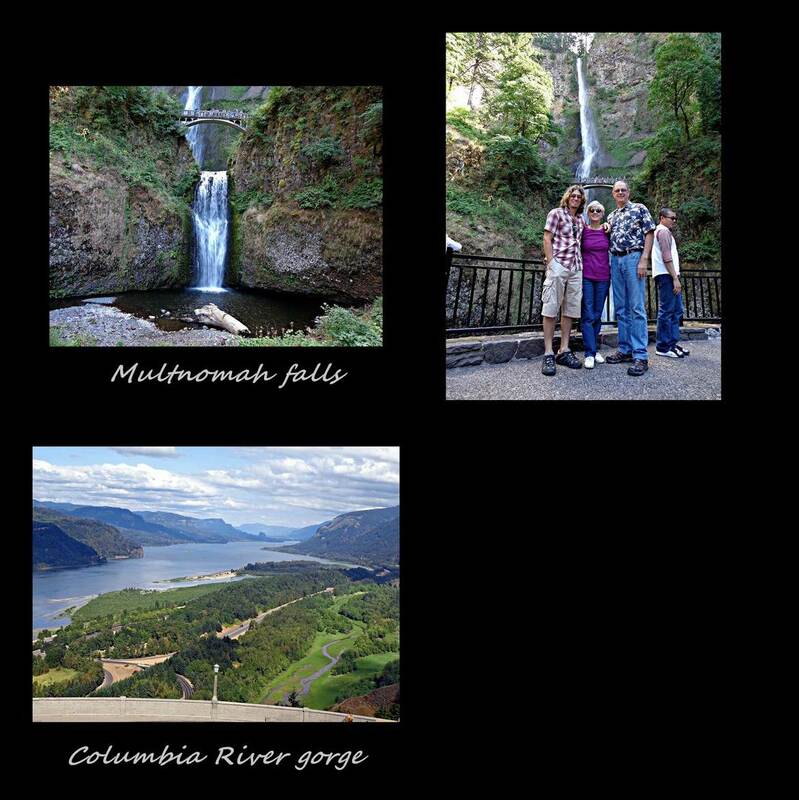 They took us to the Columbia river gorge, Oregon where we spent the day exploring the area. From Vista House at Crown point we could see the entire gorge stretching right up to Beacon rock. From there we travelled down the gorge passing countless small waterfalls as we drove. We stopped and walked up (not all the way) to Multnomah falls where Diane told to me many couples get married. The view was amazing and I could see why they would choose this venue. The last stop of the day was the Bonnetville fish hatchery. Here trout, salmon and sturgeon are held in over 58 rearing ponds and held here until they are “fingerlings” or “smolts”. These are then released into the Tanner Creek which merges into the Columbia river and eventually into the Pacific ocean. After two to four years the adult fish return to this hatchery to spawn. To get into the hatchery area however these fish have to swim upstream via a fish ladder. They have underground viewing areas where you can actually see how strong the current is against which these fish have to swim against. They also have an area where you can view giant sturgeon which is over 10 feet/3m long , weighing over 450lbs/205kg and over 70 years old. Gary told us that until recently there was sturgeon in these tanks that were 20 feet long and then some trigger happy fools came and shot them one night! We had a great day and ended it with takeout at Chipotle, a really good burrito restaurant. We stayed with Gary and Diane for a few more days enjoying the great meals , soft bed and good company before we said our sad goodbyes and headed south. 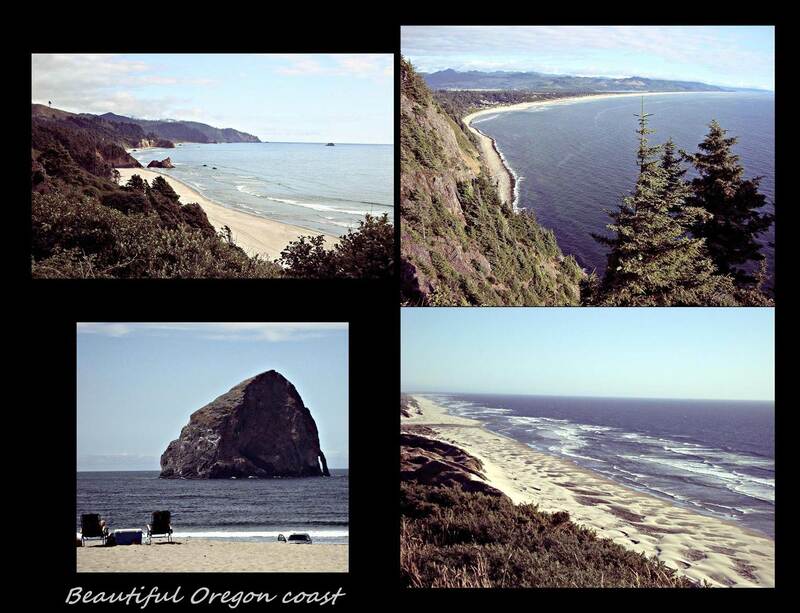 The Oregon coast is some of the most beautiful shoreline you will ever see if you’re lucky enough to get there. 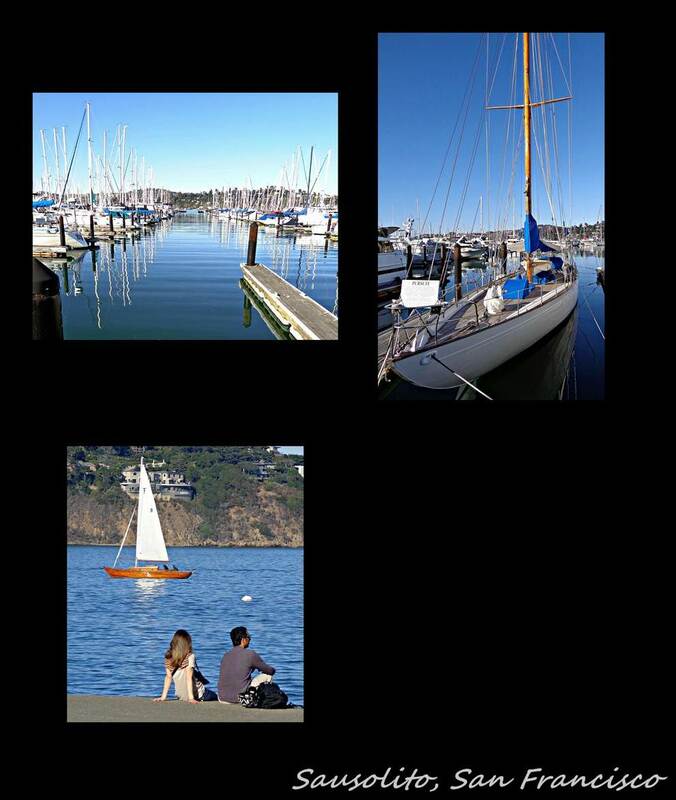 The pacific ocean stretches out from a rocky shoreline to where your eyes won’t focus anymore. Lush coniferous forest line the coast with numerous campsites and picnic sites where you can stop and take in the amazing views. 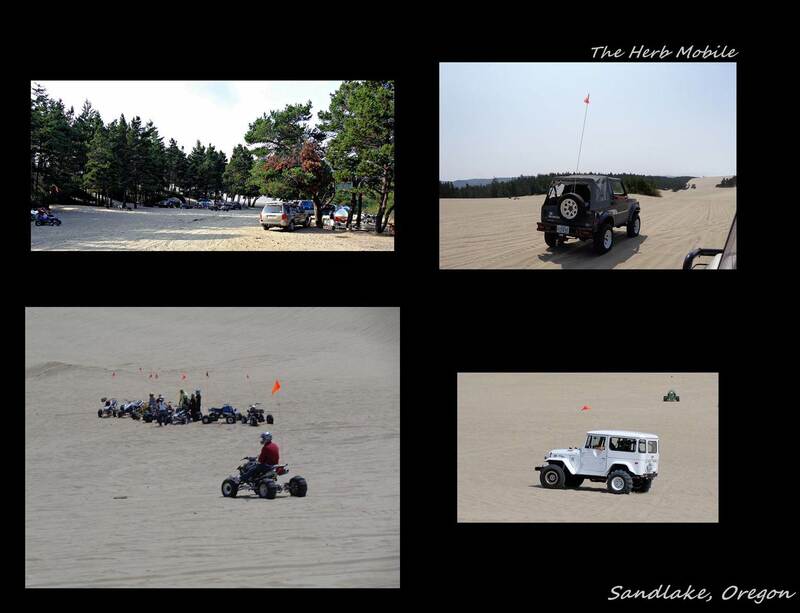 We stopped overnight at a place neither of us knew existed … an off-road vehicle sand dune area where any type of vehicle capable of driving on sand dunes are allowed to drive in any direction imaginable…aka Sandlake. People are allowed to camp on the sand (given you have a off-road vehicle permit which you can buy from any store in the area) and bring every off-road vehicle you can possibly fathom…quad bikes, all terrain vehicles (ATVs), dirt bikes, dune buggies and a cruiser or two! 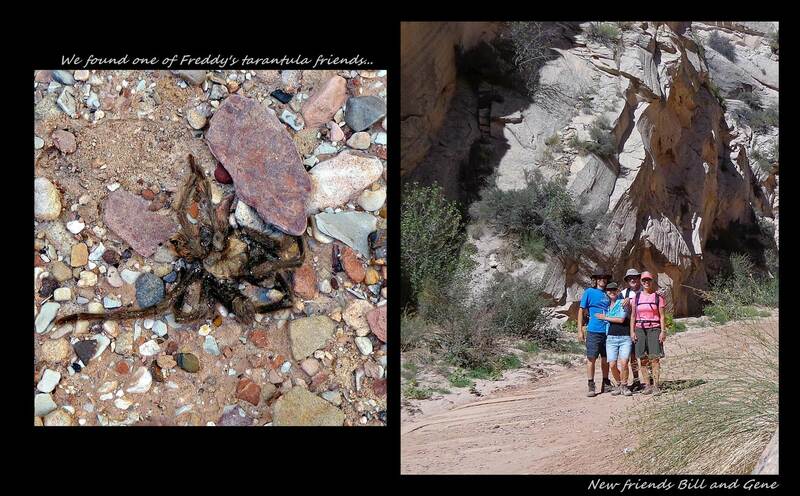 We were lucky to meet new friends Brady and Cheri her who were camping with their son, parents and two friends. 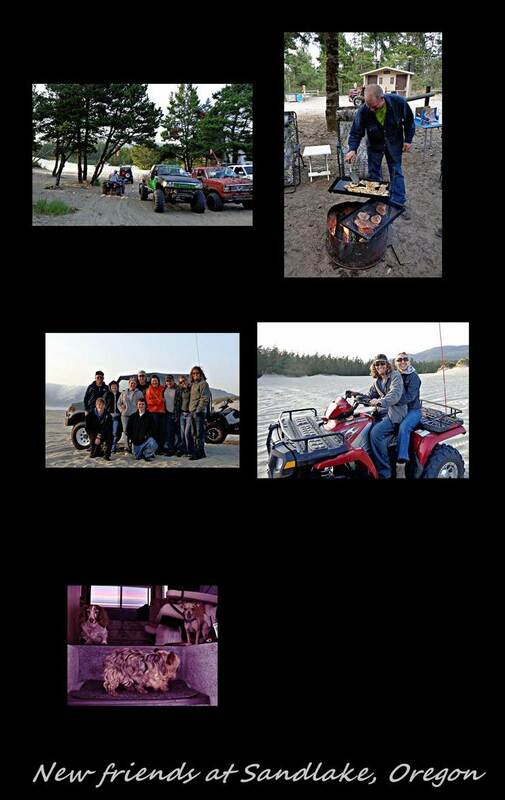 They took us out on their ATVs and introduced us to two all American foods….Smores and Mcmuffins…Brady’s style. Although the concept of a smore is not that unfamiliar, the ingredients to making an all American smore is very important. So, any old marshmallow would do the job, but the biscuit and the chocolate used are very specific…to make the perfect smore, you need a Garam cracker and a plain milk chocolate Hershey bar! The method require you to carefully grill of the marshmallow over an open fire whilst at the same time slightly heating the Garam cracker with a piece of Hersey bar on top. Once your marshmallow is about to droop off your poker, place it carefully on top of your Garam cracker/Hershey bar tower and squish together with another Garam cracker on the top. ..wholla, heaven in cookie-form! As if this wasn’t good enough they showed us the proper way of making a Mcmuffin…something McDonalds sell but do not do any justice…An English muffin is something that resembles a cross between a scone and a vetkoek..small like a scone and soft like a vetkoek. On the muffin you put a fried egg, piece of cheese and a piece of fried Canadian bacon (similar to a piece of smoked ham)…I can see why you would eat this everyday if it wouldn’t cause havoc on your health. We took the Cruiser out on the dunes and he did great. After seeing about a dozen guys getting stuck in the campsite with their large RVs behind them, it was fun to see how easy the cruiser could make it look…and how much a simple thing like deflating your tires could make such a big difference! 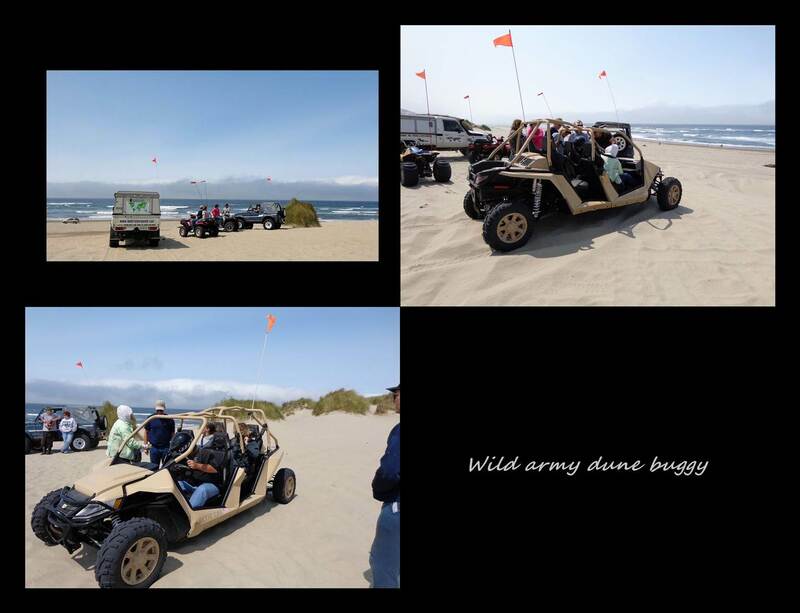 Anyway, while driving on the dunes, we met up with two of Brady and Cheri’s friends who was there testing a dune buggy. But this was not just any dune buggy, it was a prototype for the US Army which this guy designed and built and was now testing out its performance. We each had a turn to go for a ride in this “death buggy” as I would call it and not surprisingly had two very different experiences. Let’s just say, Marius thought it was the coolest experience ever and I was praying that we make it back to the Cruiser alive. A few minutes covered in sand we made it back without a hitch and I was glad to get out of it. Pretty sure the US soldiers will be able to get away from any desert monster they encounter…If your ever in the Sandlake area, be sure to stop at the local Tillamook smoker and get some super delicious, cheap jerky…. Your tastebuds will thank you later. 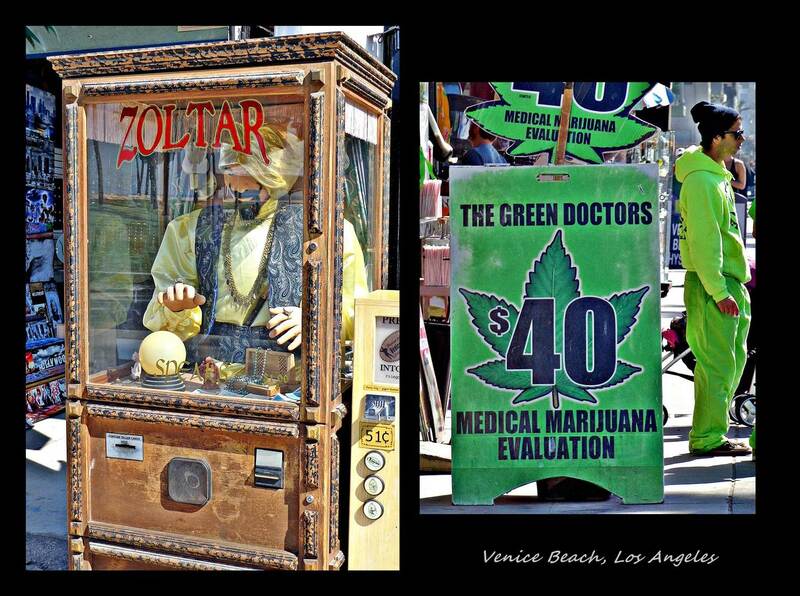 We finally entered the state we had been looking forward to … the sunshine state of California. 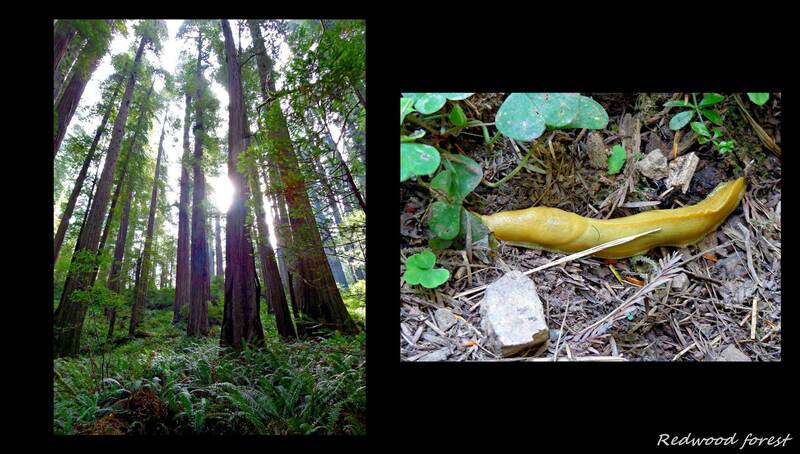 As soon as you cross the border from Oregon, you are pretty much in the Redwood national park. 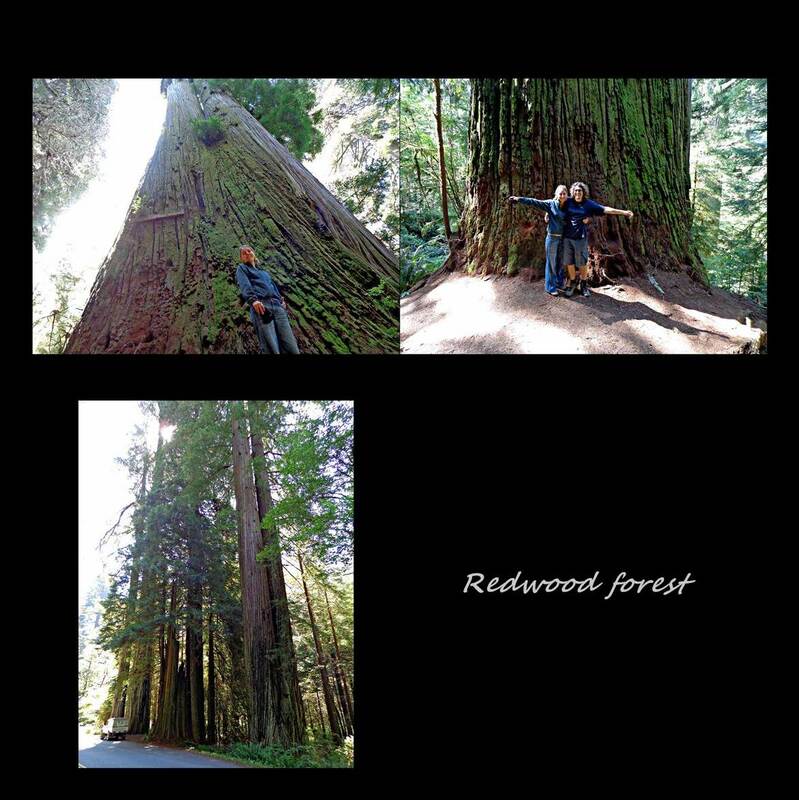 Although very small on a map, this park is home to some of the tallest trees in the world! 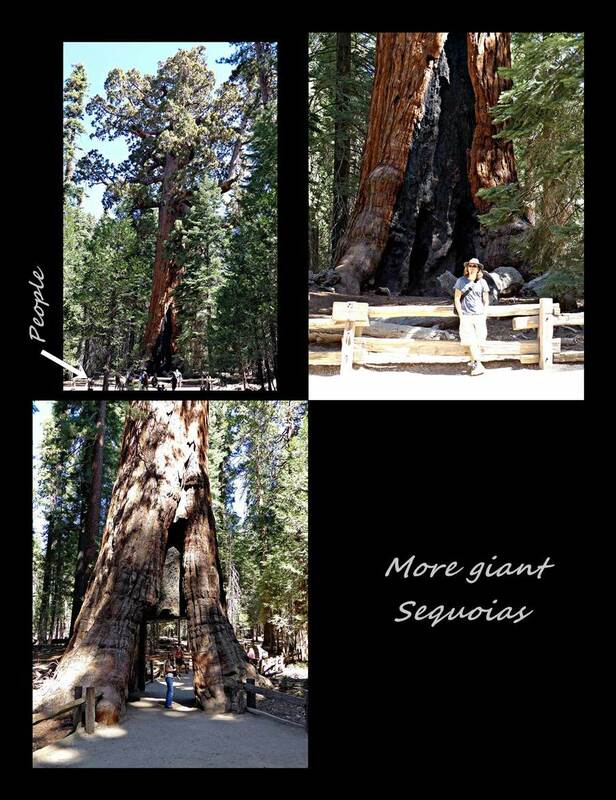 These giants grow to be about 360 feet tall and can live for 2000 years. Their average lifespan is usually about 500 to 700 years. 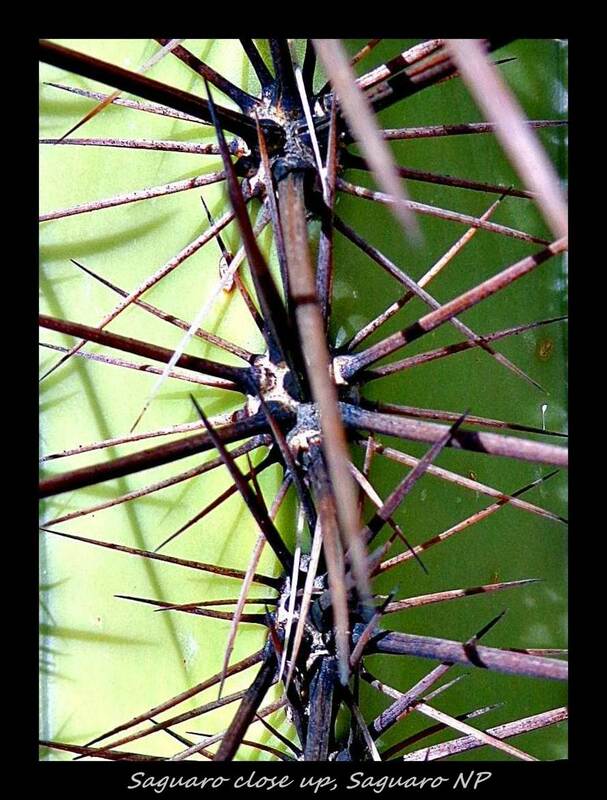 Their base has a diameter of up to 6,5 m and they grow from a seed no larger than that of a tomato. Throughout the park, various roads allow access to the trees. On the day we got there, we were lucky to experience the most traffic ever on one of the scenic routes due to an accident that caused the closure of a main road around the park. Through clouds of dust and some ducking and diving behind these big trees we enjoyed our first experience of feeling like dwarfs. The way to really get the full experience here however is to take one of the many hikes through the forests. We hiked to a rather unimpressive fern waterfalls but was amazed at the sizes of the tree trunks surrounding us. Heading south along the pacific coast, we took a detour through the Kings range national park which is also known as the “lost coast”. 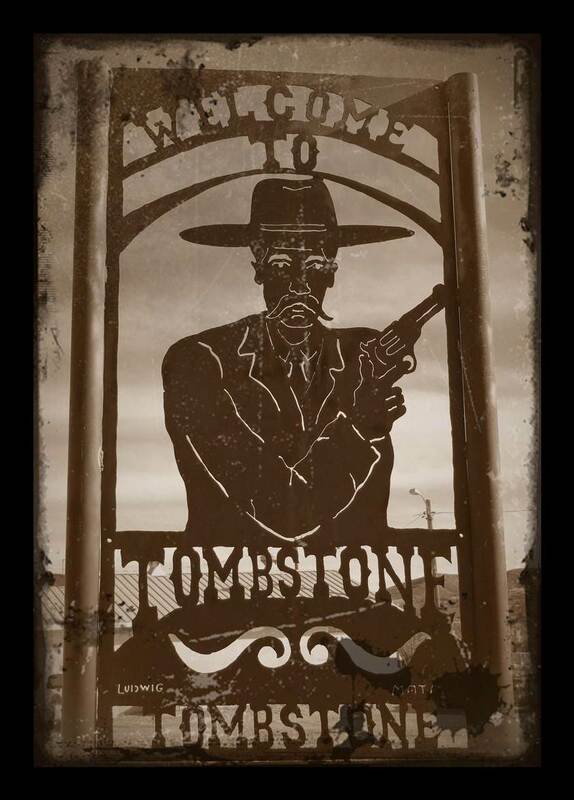 Although we didn’t know about this name prior to departing, we could see from the complete lack of people as well as how the towns seemed to have been left in the somewhere in the 60s that this place was lost to the nearby modern California. The little town of Petrolia might as well have been in the middle of Kenya was it not for the odd old American muscle car. We were aiming to stay at another one of those small camping signs we had noticed on our Michelin map. The map had never let us down but this time we were sure that there couldn’t be a campsite at the end of the deserted gravel road we were driving on. To our surprise, when we finally arrived at the end of the road the campsite was right there where it should be and off coarse it was almost full. 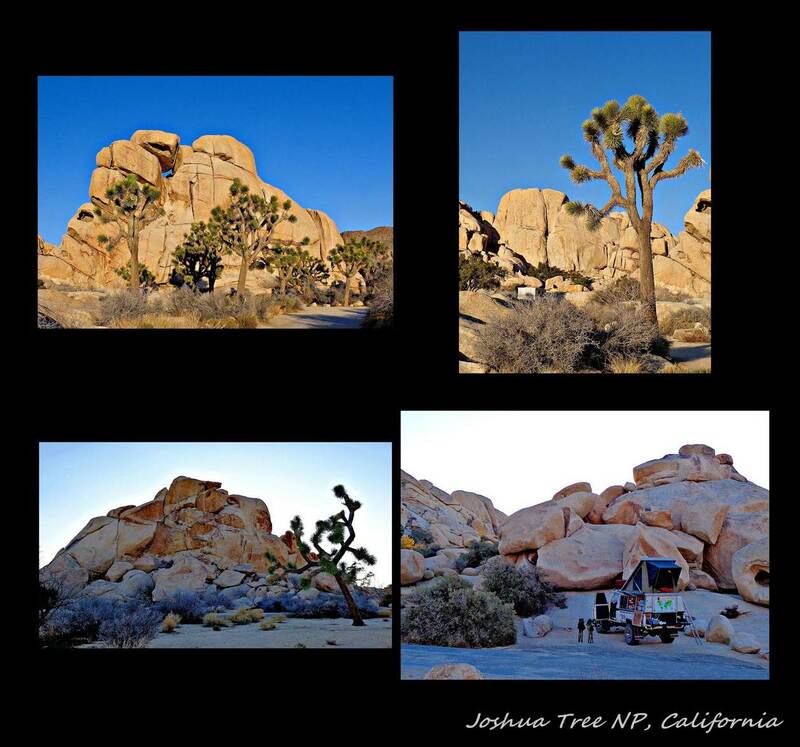 When will we finally realize that even in the most remote (according to us) place in North America, we are sure to find someone (probably with his big RV)! After spending the night, we continued south and found ourselves in the midst of the marijuana growing (and smoking) region of the country. A windy unpaved single vehicle road in the shadows of large trees became a slight shade of blue as one after the other old dilapidated ford bronco passed us in a puff of smoke. We prayed that the people in them weren’t as blind as the corners on this road! We took a backroad thinking that we might spend the night at Sinkyone state park but found they charged an arm and a leg for nothing more than a piece of ground to stand on. 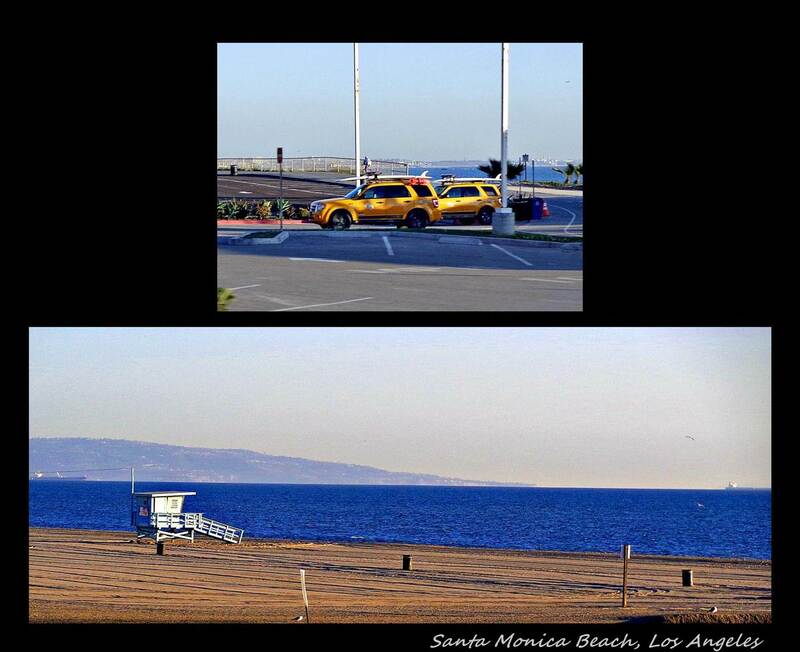 We soon found that this would actually be the trend for coast of California…few free camping spots and nothing under $28 if you were considering an RV park. 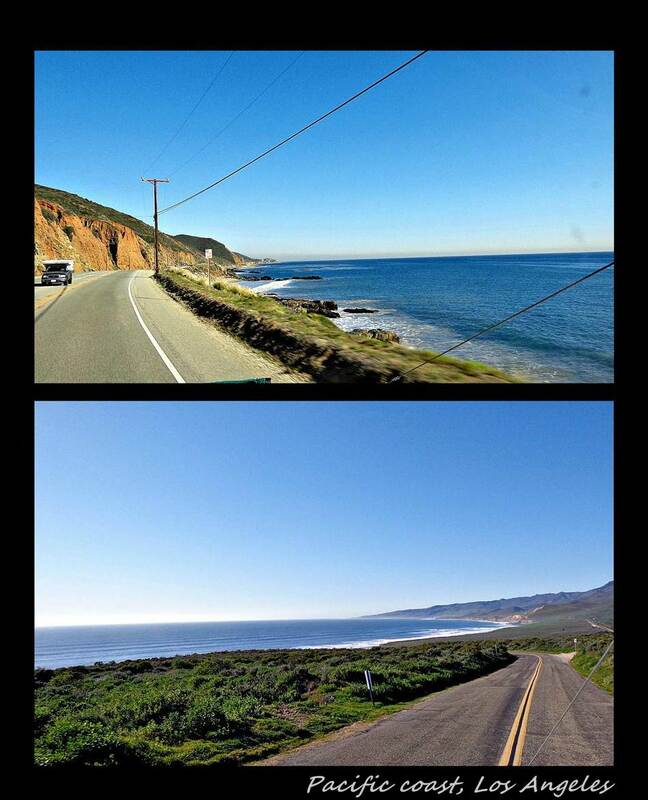 When we finally reached the infamous Hwy 1, we were expecting some breathtaking pacific ocean scenery. The fog along the shoreline had other ideas however. It felt similar to driving through Banff and Jasper national parks…we knew the 3600m high rocky mountains were right next but we might as well have been driving in the Free state. 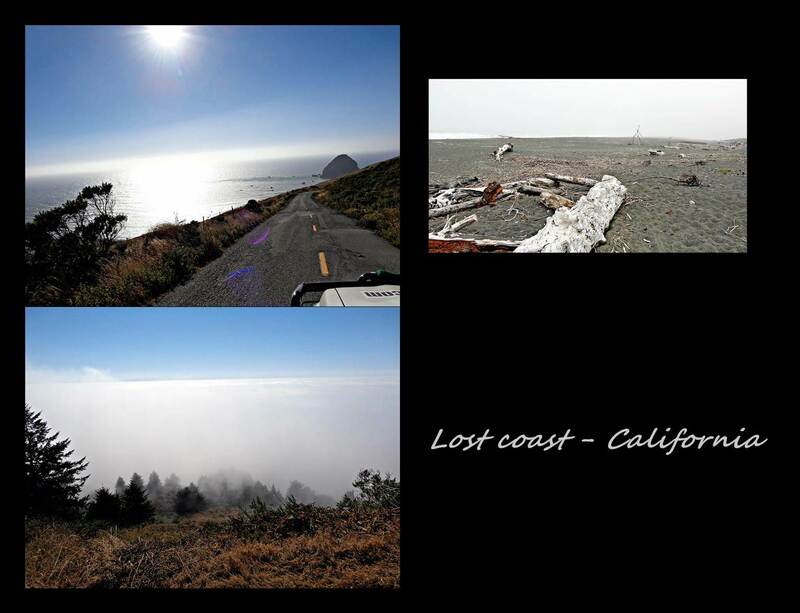 We could see the ocean with some rocky outcrops lining the shore, but it was nothing like what we saw in the photos. After a few days of seeing nothing more than morbid ocean weather we turn east and drove inland. Funny how only two kilometers in the sunshine state came into focus and it felt like we were actually in California. 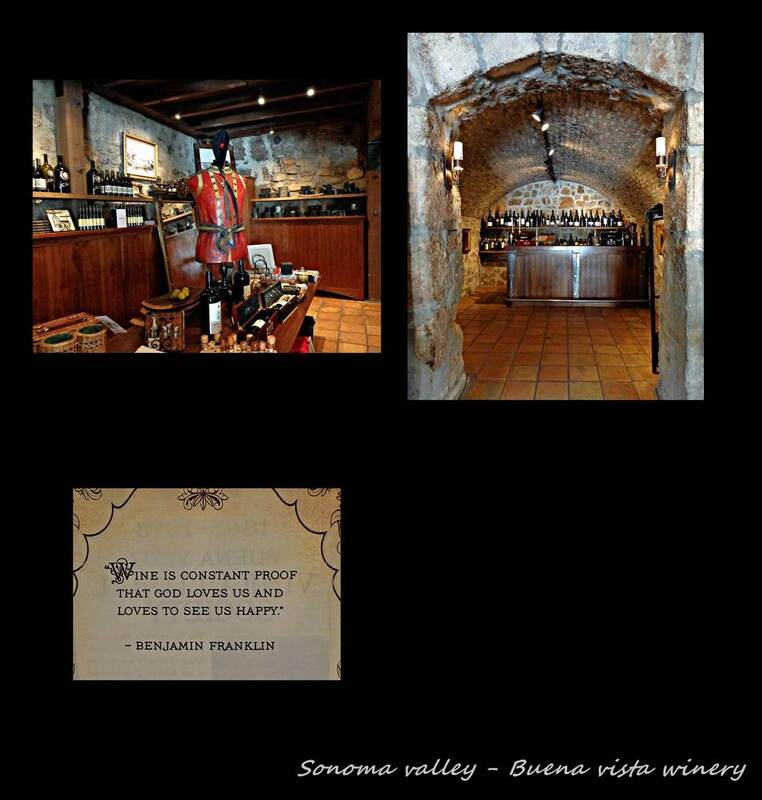 Next up was the Napa and Sonoma valleys….wine, vineyards and large Italian looking mansions. 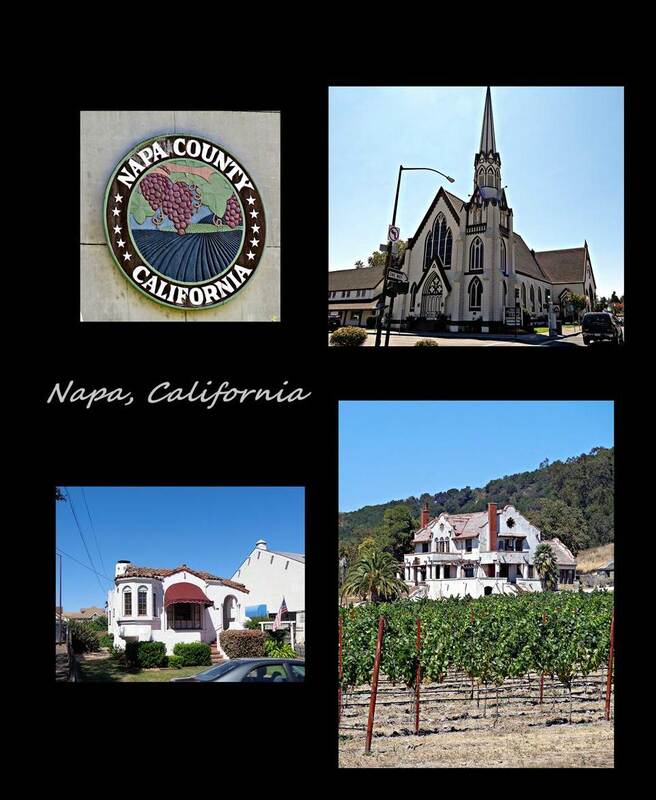 In truth, only about 5% of California’s wine comes from this region but it is known for the best wines in the US. We didn’t visit all the vineyards as there are probably around 300 in Napa valley alone.. and unlike the wonderful vineyards in the Stellenbosch area, few of the tastings really fit into our budget. 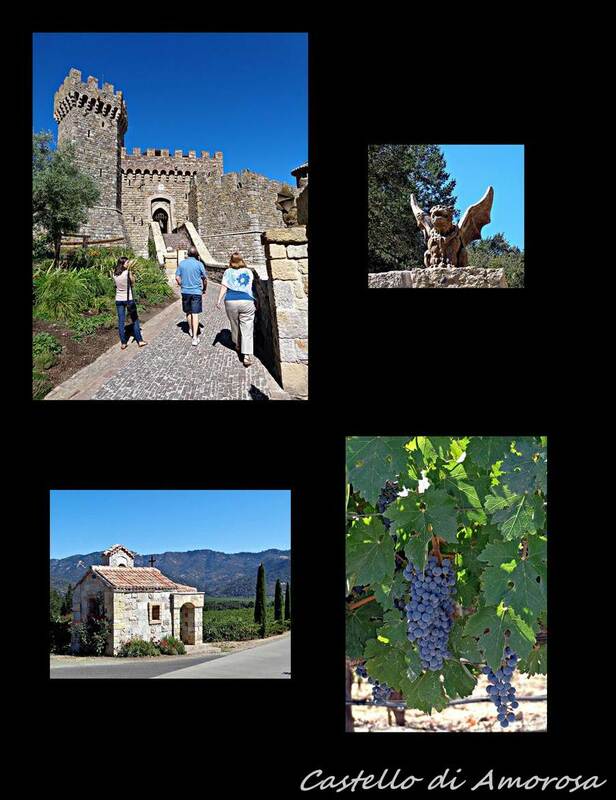 Our first stop was a Tuscan castle winery called Castello di Amorosa. 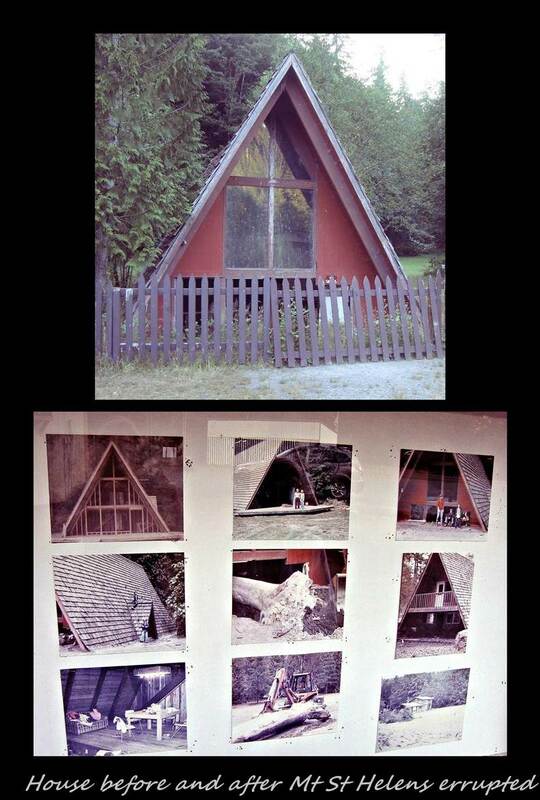 At only 20 years old, this 107 room, 8 level castle complete with drawbridge, dungeon and torture chamber had us fooled. This may be the reason why the owner charges so much to enter his mid-evil mansion…he’s still trying to pay off its construction costs! Unlikely though, as this winery produces a tiny 15 000 cases of wines including Merlot and Cabernet Sauvignon which are exclusively sold at the castle. 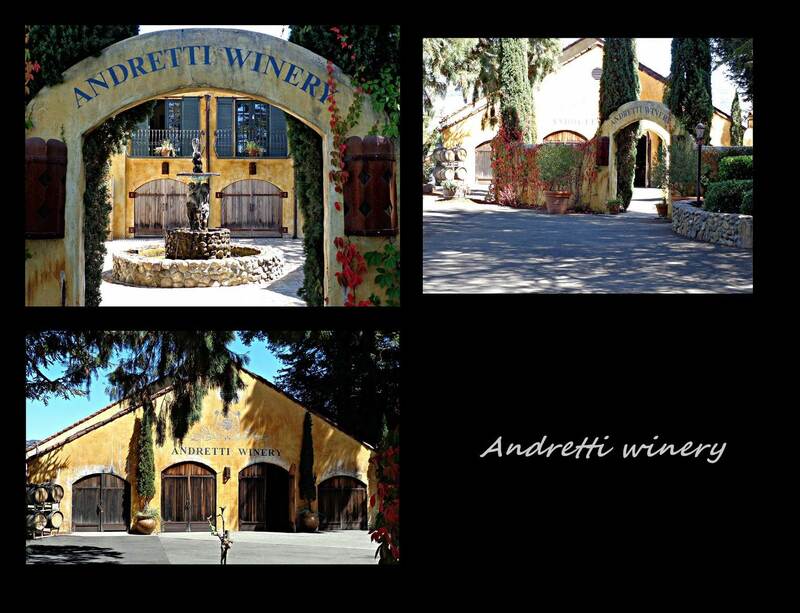 We drove into a number of wineries such as stately white Sterling and beautiful Andretti winery. The “finest race car driver of all time”, Mario Andretti founded this 42 acre Italian village in 1996. Apparently, inside you can taste some of his award winning wine whilst browsing through his racing career memorabilia. It was certainly the most beautiful winery we saw in the valley, we’re just not sure why he chose to stay here if he could have a similar setup in the Italy…preference I guess. 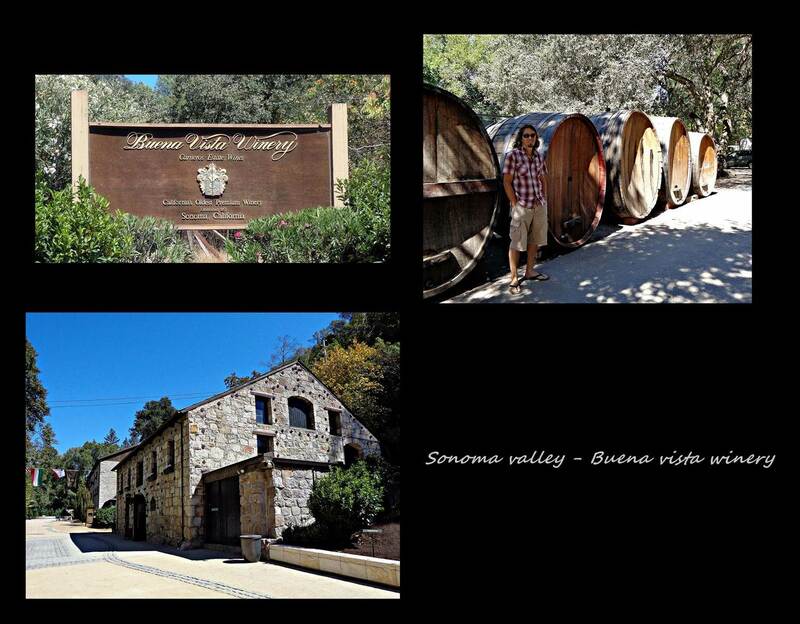 In less impressive Sonoma valley we only stopped at the oldest winery in California, Bueno Vista winery. 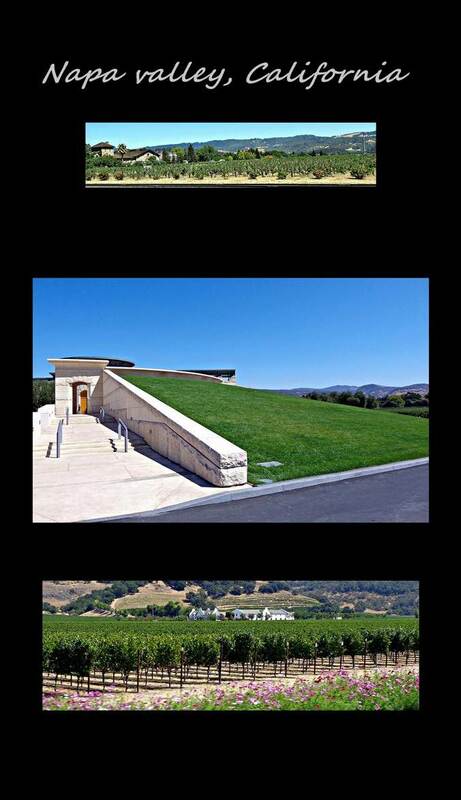 It was founded in 1857 and is exactly what a winery should look like! Further south we were lucky to be able to visit with friends we met in Canada, Craig and Anne. 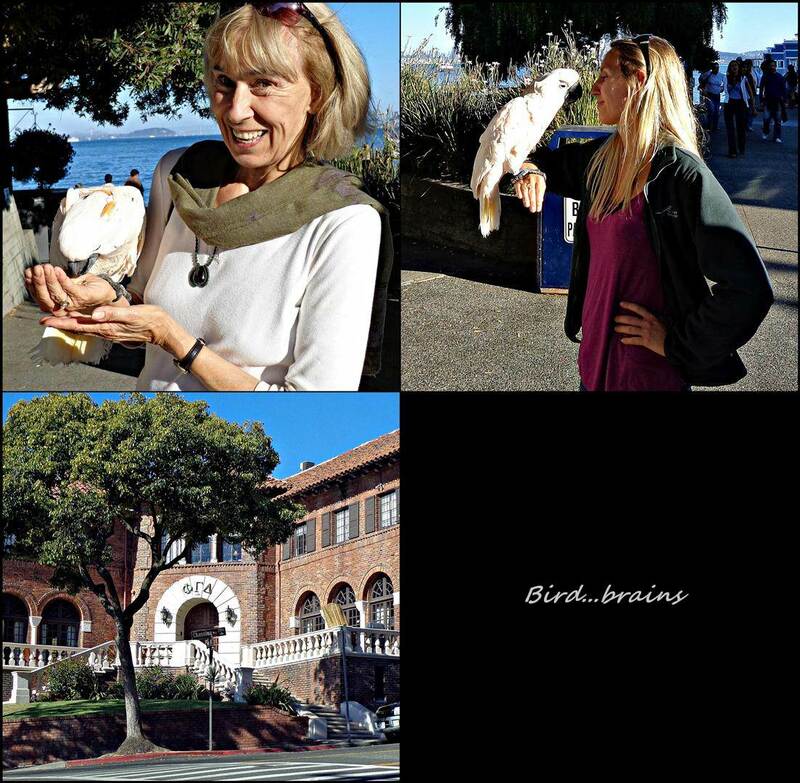 They live in Berkeley where it seems the most important scientific discoveries of our time are being made. Anne drove us all over the place and I could finally see how the truly smart people of the world live. Decades of American college TV had shown me countless sororities but seeing an αΩ∆ (alpha-omega-delta) house in person was pretty cool. We spent a day in San Francisco doing all the touristy things! 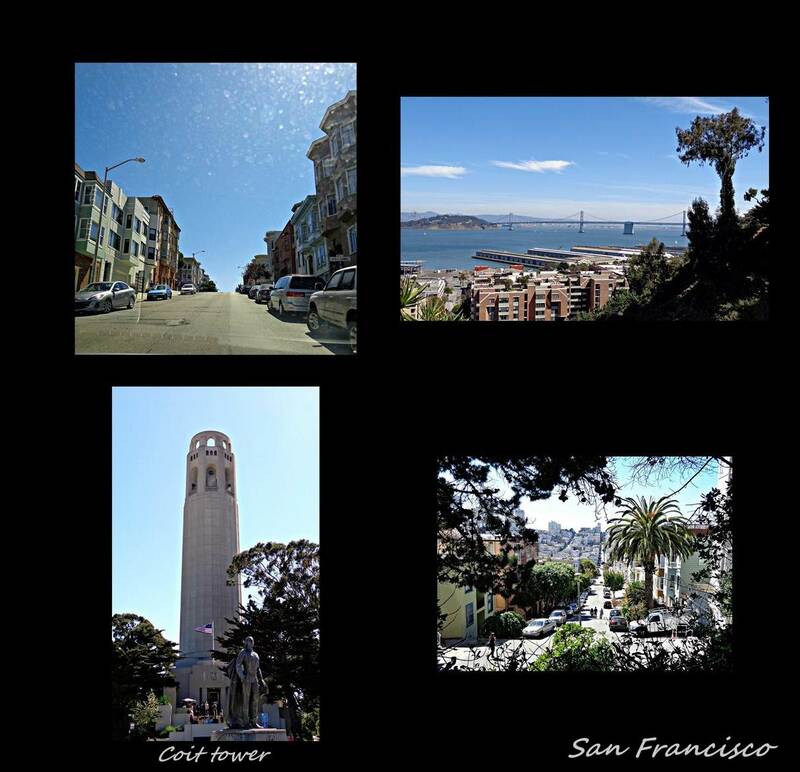 We ran up the stairs at Coit tower to avoid a parking ticket, got stuck in a fancy self-cleaning toilet that speaks to you, drove through the crowds of Fishermans wharf, saw one of the famous cable trolleys, drove the hills and valleys of the San Francisco streets and finally walked halfway across the Golden Gate bridge! 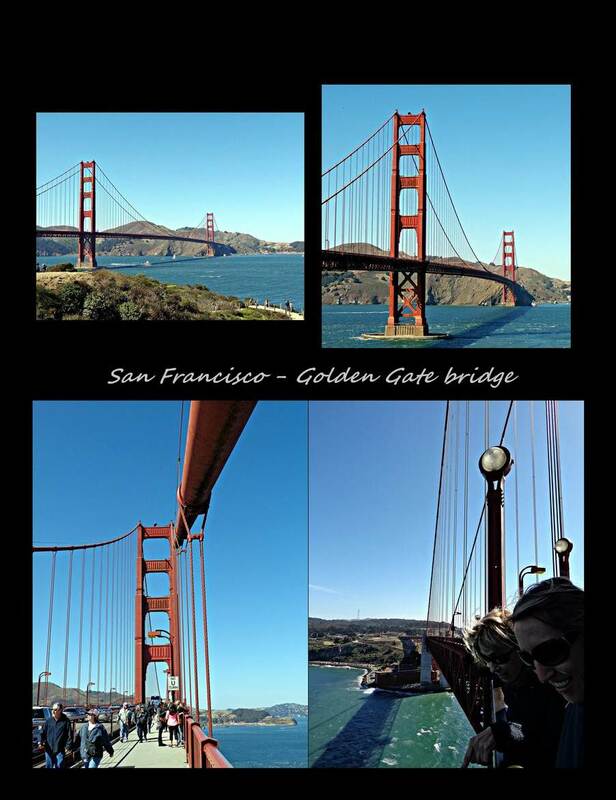 The weather was amazing and we could even see Alcatraz from the bridge…it was a perfect day! 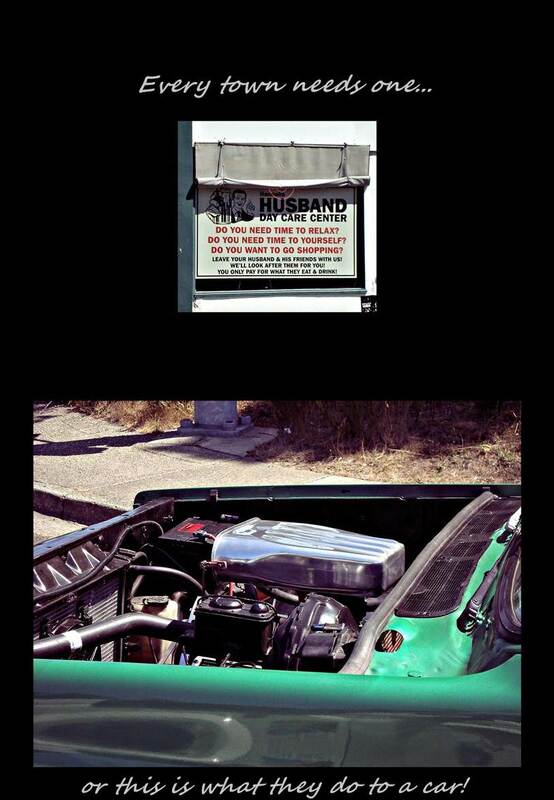 We got a taste of true green living as Craig and Anne only eat organic foods, do what they can to conserve water and even drive their vehicles on vegetable oil. We had tofu covered in natural yeast and lots of leafy greens and I think it has finally helped me convince Marius of a once-a-week vegetarian night! I wish! We went for our first movie in the US (Lawless) after we had amazing Indian food at restaurant close to their house. On our last night there Craig took us to guy who seems capable of building anything thinkable. He is the inventor, designer and builder of an amphibian car called the “sealion” (check out Utube) which he was happy to finally get rid of recently. He built his daughter a miniature car to drive to primary school with and will wow the average housewife with his elegantly designed height adjustable table. He should be making millions with his knowledge and skills. 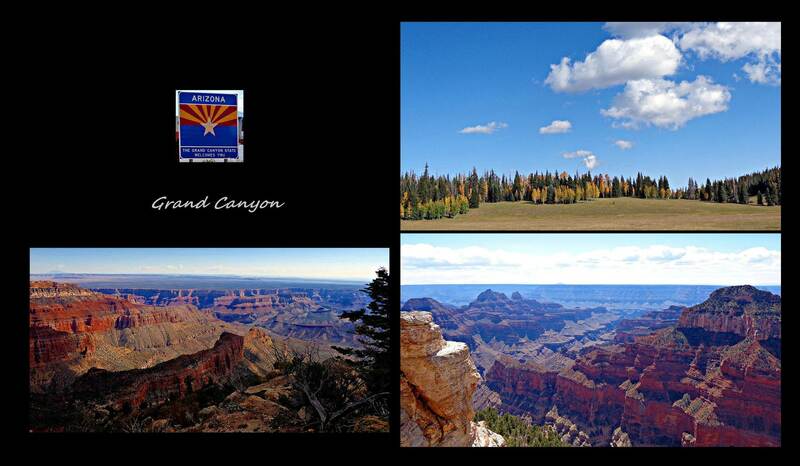 Next we started to head east toward the collection of National parks including Yosemite, Death Valley and Grand Canyon. 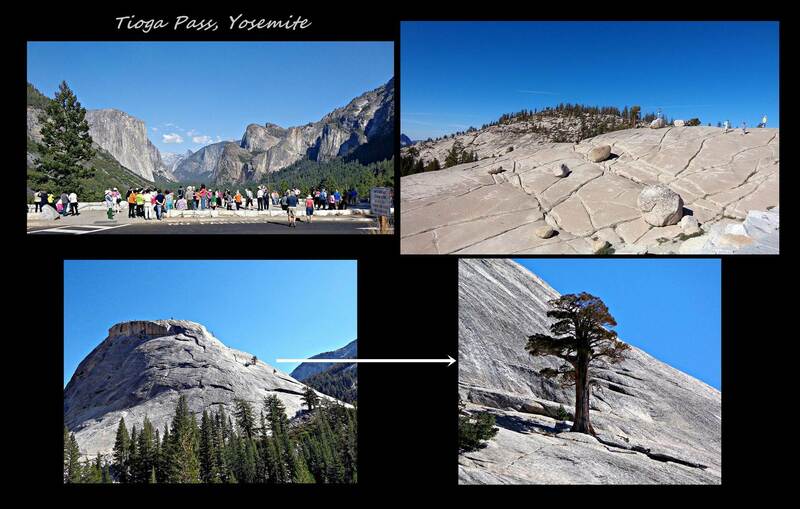 Our first park was Yosemite National Park which is characterized by gray granite cliffs towering over the valley and some giant sequoia groves in the south. The massive cliffs stand at between 2100 m and 2700m and geologists think that they were formed over long ago after the granite of the valley walls solidified over five miles underground. 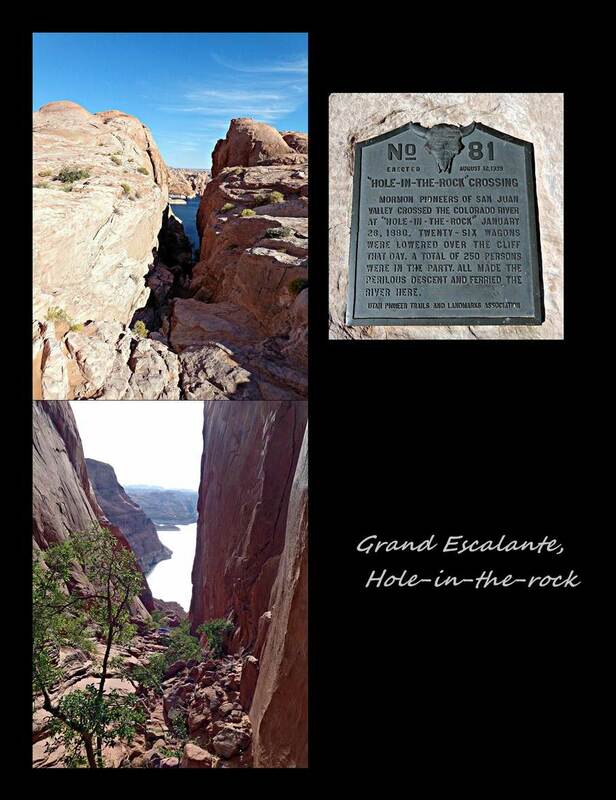 This granites rose as overlying rock eroded over time exposing the giants we see today. American Indians however tell the story of a woman and her husband arguing. Displeased spirits changed them into the two highest peaks to be forever stuck facing each other across the valley…seems like the crime doesn’t fit the punishment! Other high overlooks like Glacier Point provide beautiful views over the valley and cliffs but it was the Tioga road heading east away from valley where the real beauty of this park lies. Here lakes and cliffs come together spectacularly with the morning sun from behind. It was an awesome sight! 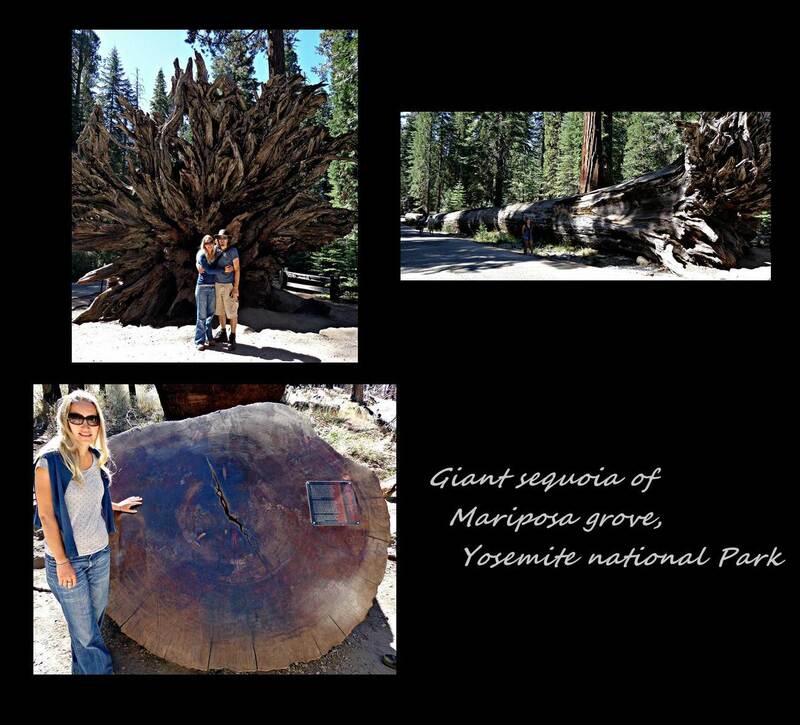 We visited the giant Sequoia groves in the south and this time we really felt small. These trees grow from a seed the size of an oats flake (oats feature way too much on this trip!) and reach over 25 feet thick. They may not be the tallest but they sure are the thickest! Another interesting fact is that they need fire to reproduce..apparently fire promotes reproduction by clearing away the competing firs and cedars and exposing bare mineral soil for their tiny seeds to take root. 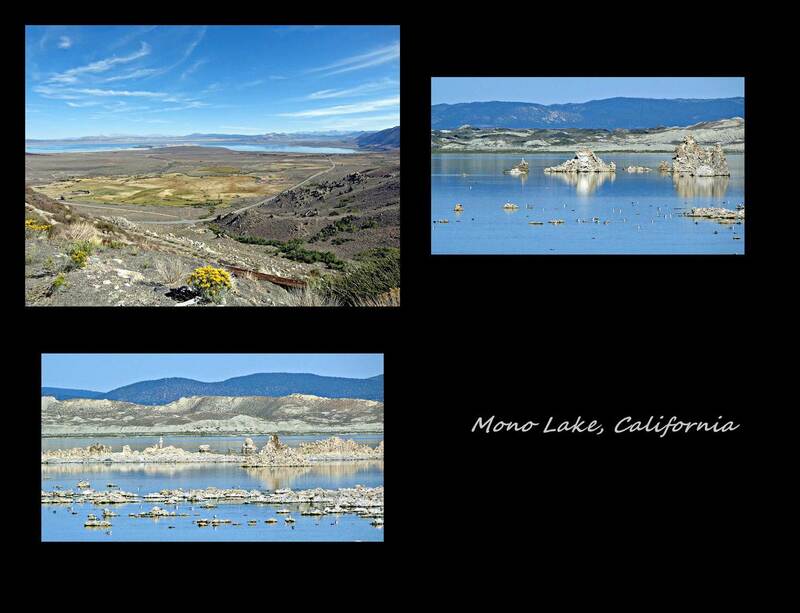 Once you cross over the beautiful Tioga pass, you descend toward Mono Lake. We expected the area to look like something on the moon from all we read about this strange place … bright blue water and sandcastle-like formations in the midst of this volcanic desert landscape. Sounds better than it was, but it might just be because it is the 2578th lake that we have seen so far..too spoiled! 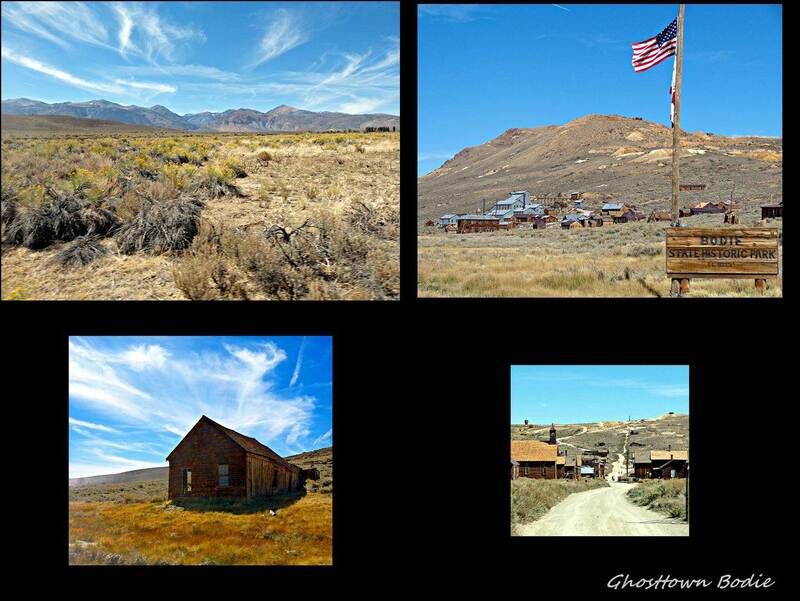 Close to Mono lake lies one of the most authentic ghost mining towns in the US called Bodie. We drove the 10 miles of rather rough gravel road to get there and wasn’t surprised to see that a guy driving his shiny Merc in front of us..if it has four wheels these guys can drive it on any surface! 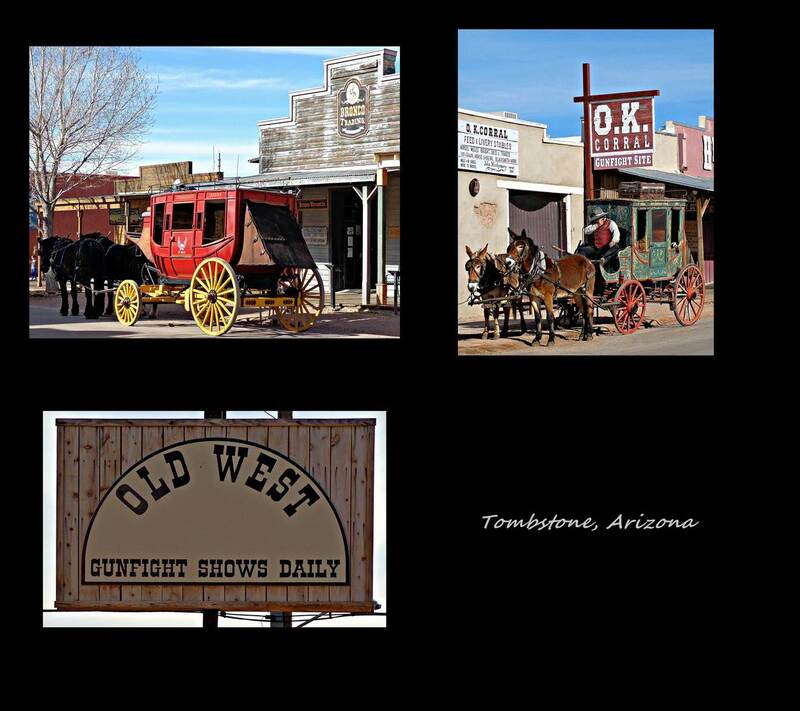 The little town was very well kept and if wasn’t for all the RVs (and brand spanking new Mercs) surrounding the place we would have thought we were back in the Wild west. 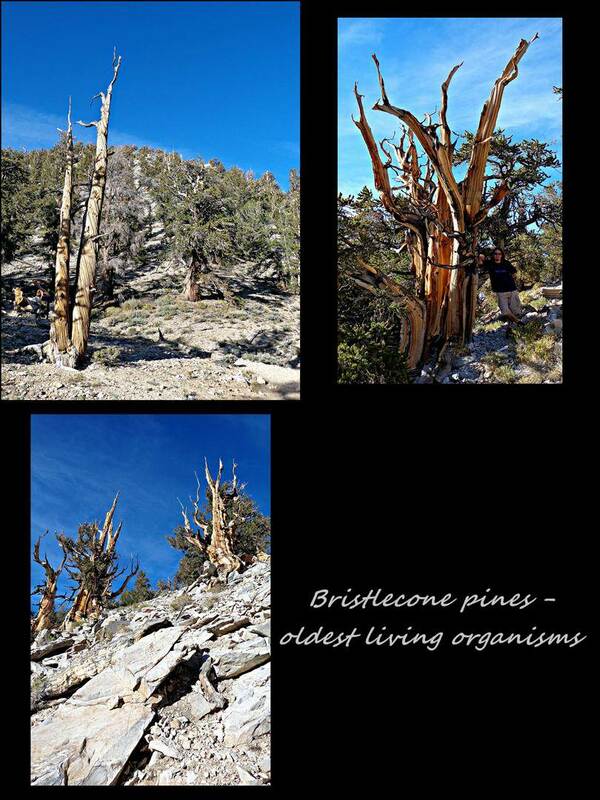 On the way to Mono Lake, two lovely ladies told us about the ancient Bristlecone pine forest just north of Death Valley. By mapping tree-ring patterns of dead and living trees, scientists can piece together samples and have found some that date back to 11500 years. These grandest of grandfathers grow at high altitudes in dolomite rich areas, not because they need the dolomite, but because they have adapted to living in these conditions. 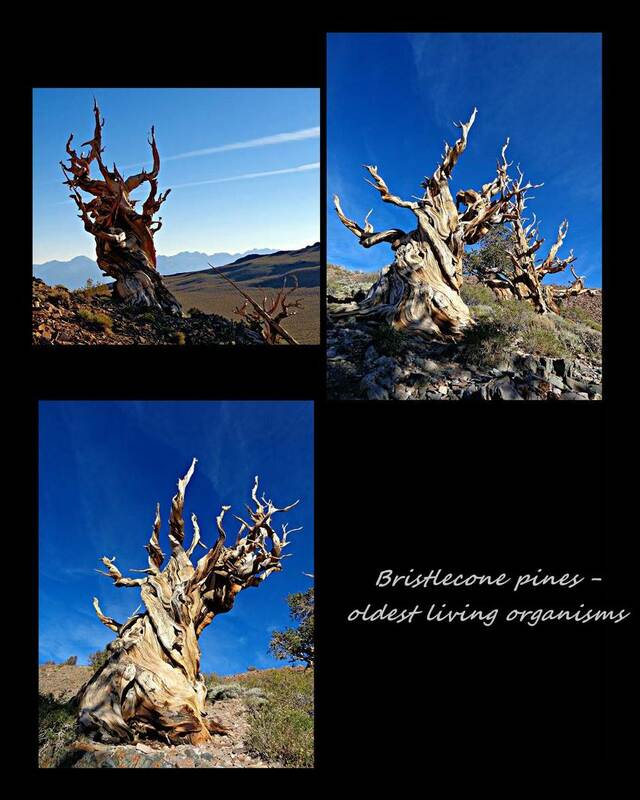 The oldest living tree in this grove, aptly named the Methuselah tree is 4000 years old, making it the oldest living organism on earth…! Think of it this way, he was around long before Jesus walked the earth. 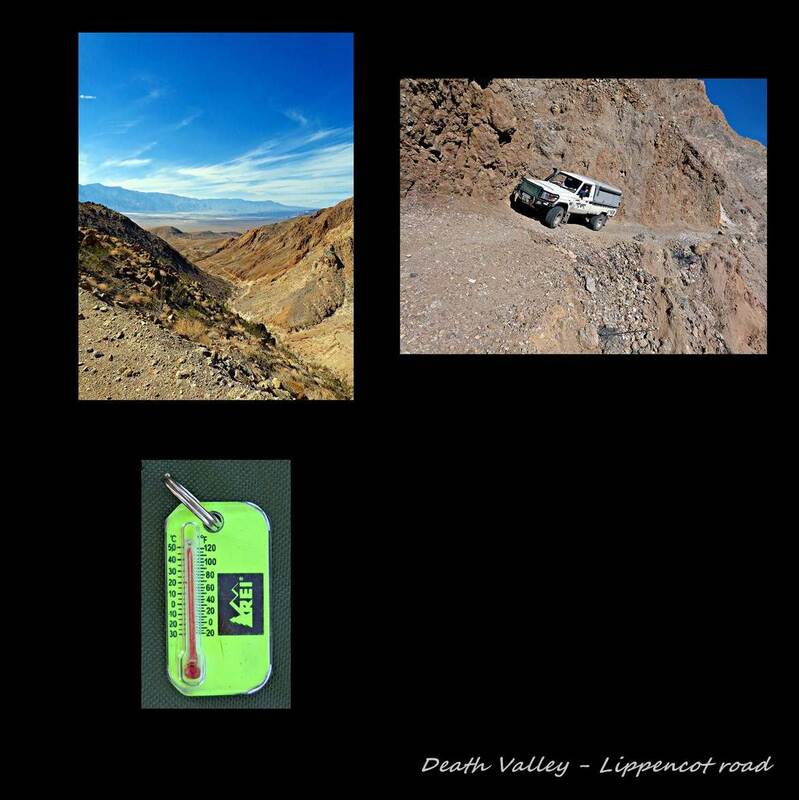 From the lofty and rather chilly Yosemite area, we descended into the depths of Death valley. We had a jolly hard time to actually get into the area Craig had mentioned as there was a rainstorm recently which resulted in most of the roads being washed away and subsequently closed. This was what we were told then, but we have since heard another version which I will get to in a minute. We tried to enter from the north, and twice from the west sides..first closed signs were posted in the middle of the road, the second time the road on the GPS just didn’t exist…so it was third time lucky. The road we finally took into Saline valley went over Inyo mountains passed an ghost town where silver was mined back in the day, Cerro Gerdo. After crossing over the mountain it seemed like mankind had disappeared and for the first time we were slightly more alone than we had become used to in this populous country. That night we had dinner, got into bed and then after rolling around for a while got out and drove on. 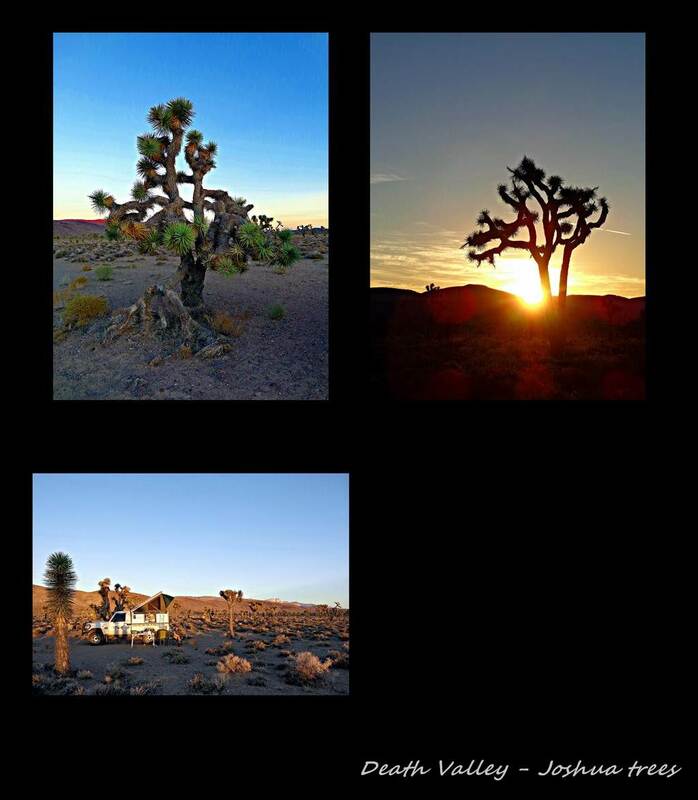 We actually crossed over the unmanned park border at around 11pm that night and went on for another few 4×4 kms before we called it a night on a flat piece of land surrounded by Joshua trees. 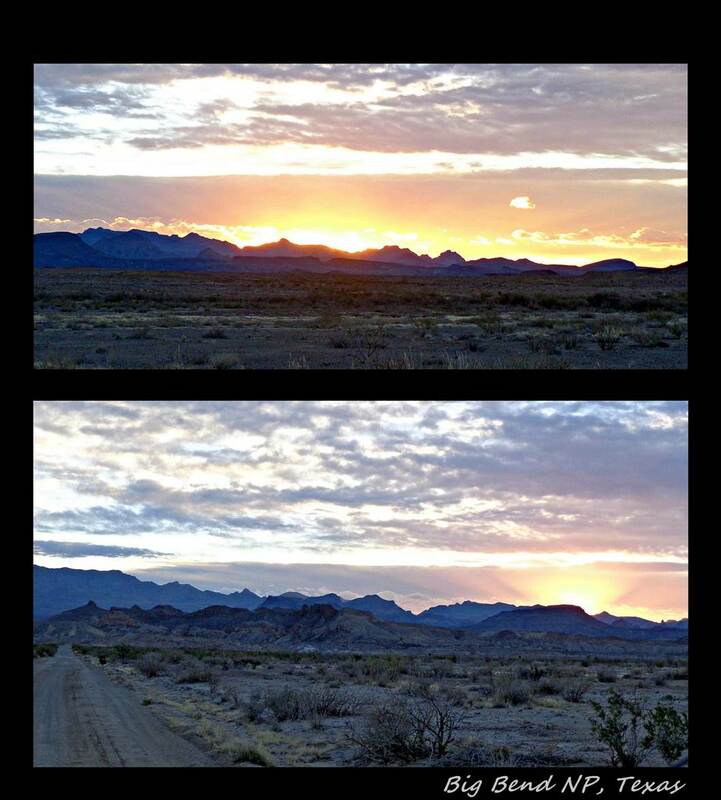 When we woke it was as if we had been transported to another world…for miles and miles all you could see was mountains covered with dirt and Joshua trees..if we blinked really fast we could have imagined that we were back in Namibia. 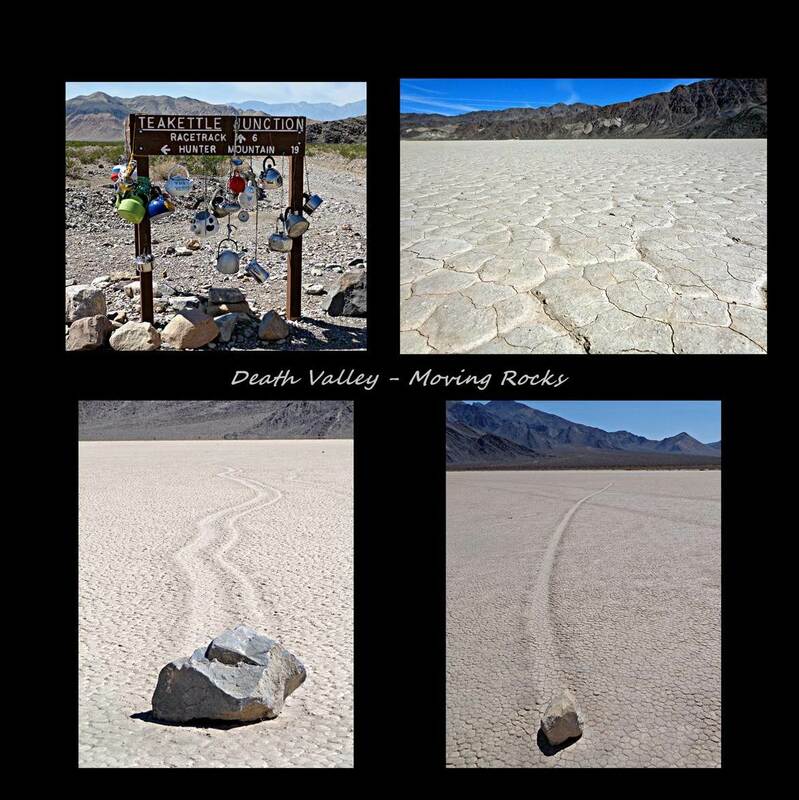 Our first point of interest was the Racetrack, known by this name as a result of how flat the pan is here and the movement of the rocks in the area. Yes, the giant rocks move along the pan floor making tracks as they go! 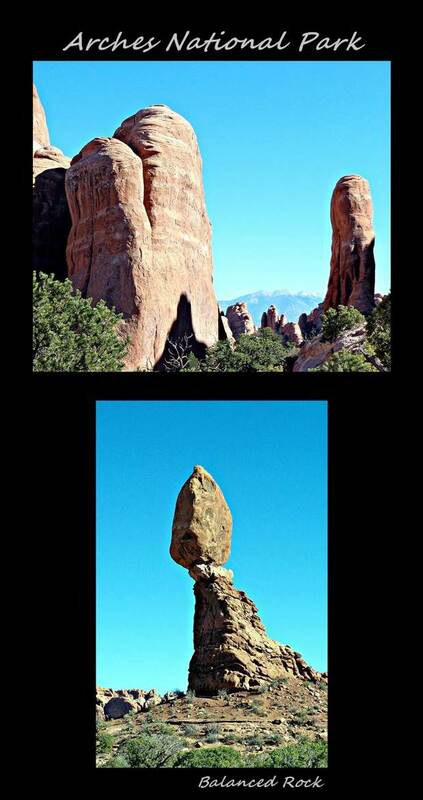 According to scientists these rocks gather snow and ice around their bases which then result in their gliding when rain or snowfall wets the valley. As Marius pointed out however, why do they still form tracks though? Well, anyway it was amazing to see these boulders and following their tracks in different directions. 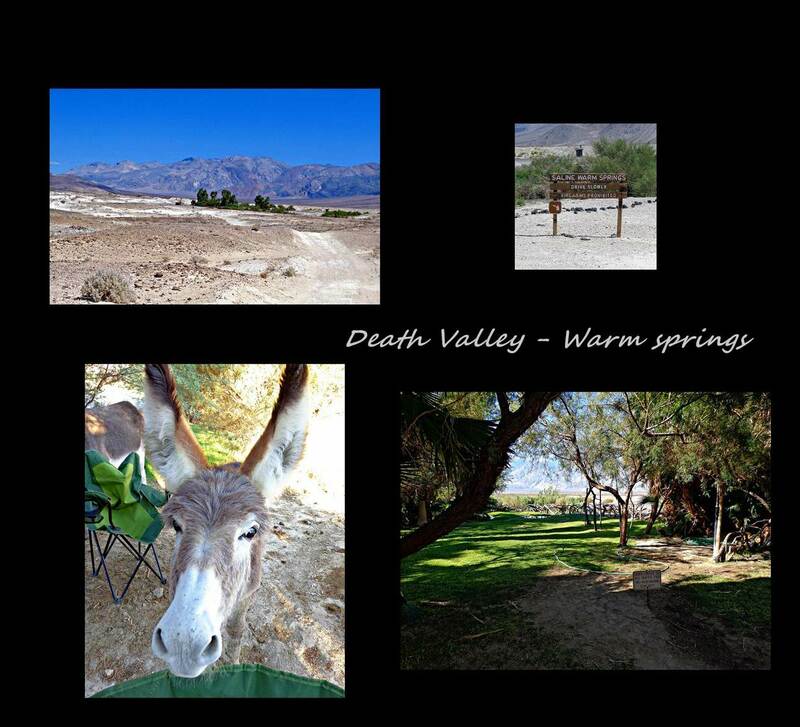 By this time we were pretty convinced that we were in the hottest place on earth and with names like Furnace creek, stovepipe wells, devils golfcoarse and badwater we couldn’t really forget it. 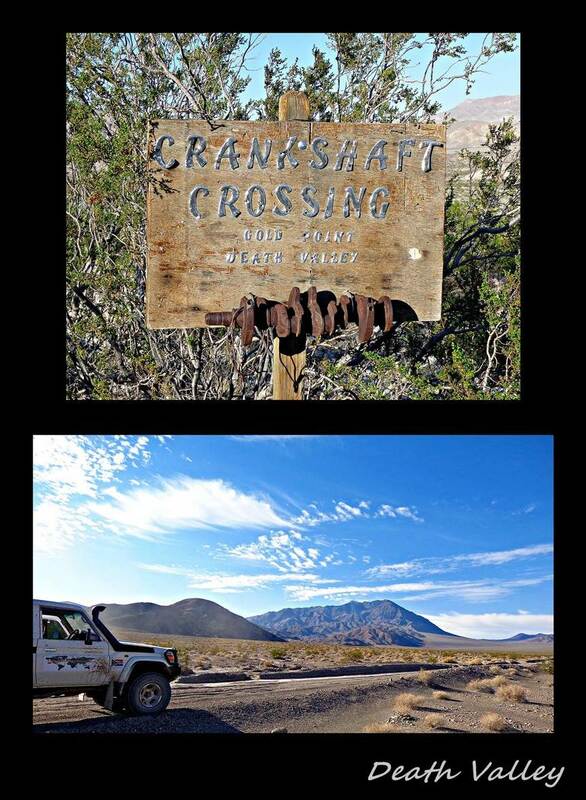 From racetrack we followed a death-defying route called the Lippencott pass down into Saline valley. It wasn’t very long, but it had a number of very narrow cliff edges some of which were rather washed out. 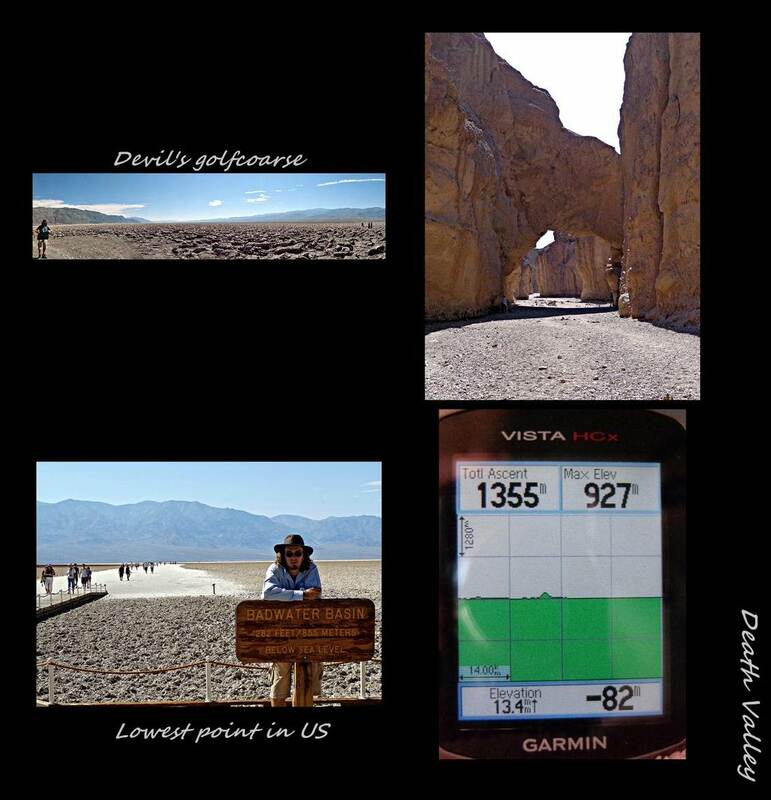 We were happy to have finally made it into the Saline valley and could see why they call it the most remote place in California..we hadn’t seen a single soul since crossing over the Inyo mountains. The next morning we were up before the sun to try and get a head start toward a place called warm springs. We really felt sticky and dirty and Craig had told us about a waterfall in one of the canyons in the areas. We spotted the green foliage coming from one of the canyons and drove up the riverbed (more like a creekbed) until we could literally not see a road anymore. I was super delighted at the idea of getting out and walking in 45 deg C but was so glad that we did it after we washed our hair. What a difference a little water makes…I can be so grumpy sometimes! In no time we reached the Warm springs which stood out like Lake Turkana in the middle of the Chalbi desert …an oasis of palm trees, green grass and donkeys in the middle of a dry rocky desert. What makes this place even more odd is that most people there go naked as we saw when we were met by a very naked (except for his cowboy hat) Paul and his family who gave us the “full monty” on how things work around there. 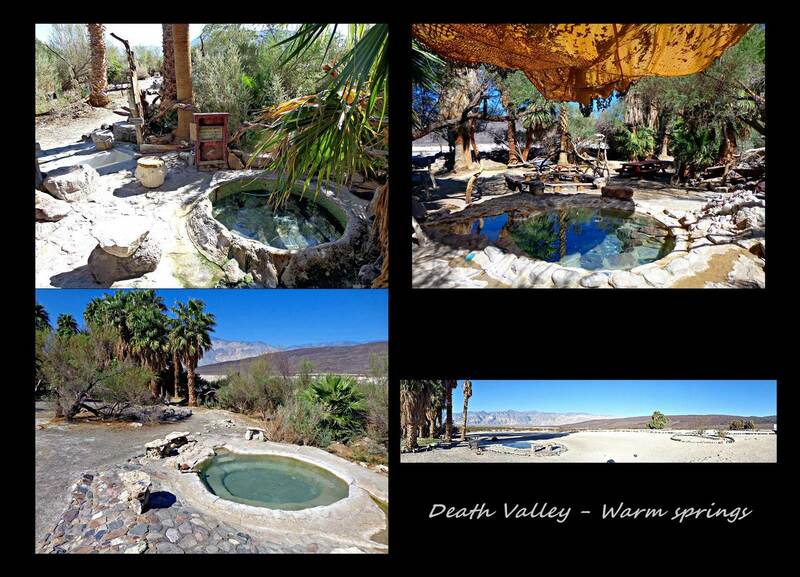 Three natural warm springs occur in this area and back in the day hot pools were built from two of these by some enlightened hippies. It was a gorgeous place which were kept spotless by the unofficial host Lizzard Lee (I’m hoping he’s called by that name due to the fact that he can survive in this heat as a lizard can….) who meticulously cleans the pools every day. Unfortunately it was too damn hot to actually sit in the pools, even late at night, but it was great to be able to wet yourself under the open air shower. Our friendly fellow camper Paul told us how busy it can get there around Thanksgiving and we subsequently gave our own thanks that it wasn’t that time of the year! He was also the one that informed us why there were so many road closures.. he told us that for the most part, all roads leading into the Saline valley have signs saying their closed because a lot of adventurous US citizens have tried to bring their 35 foot RVs on these roads and then get stuck in the middle of nowhere! In an effort to save some individuals from themselves, they make you think the road is not drivable and therefore you stick to the nice paved roads. Aside from the politics, palm trees, green grass, hot springs and naked people, super low flying army fighter jets also practice their skills in this remote area…problem with breaking the speed of sound is that you don’t hear the damn things before its almost too late to save your ears…as if this place could get any stranger! We fried in the sun for two days watching the donkeys drink hot water before we said our goodbyes and continued on at 5mph on another bumpy road. 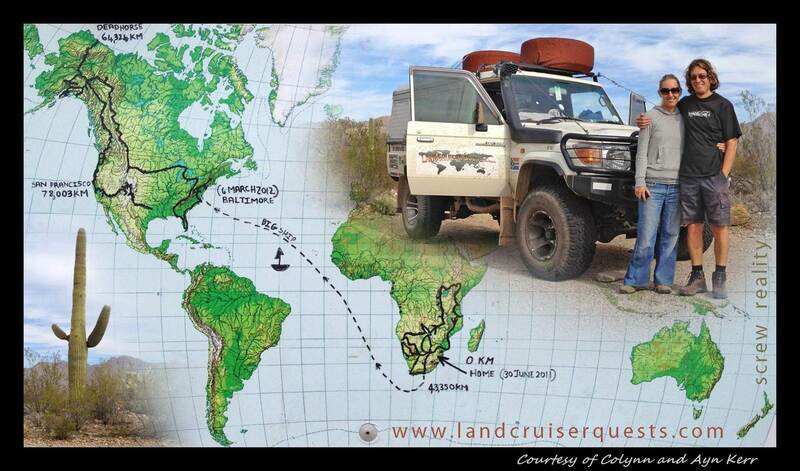 Now when people ask us what our strangest experience has been in our travels…we have something to say! 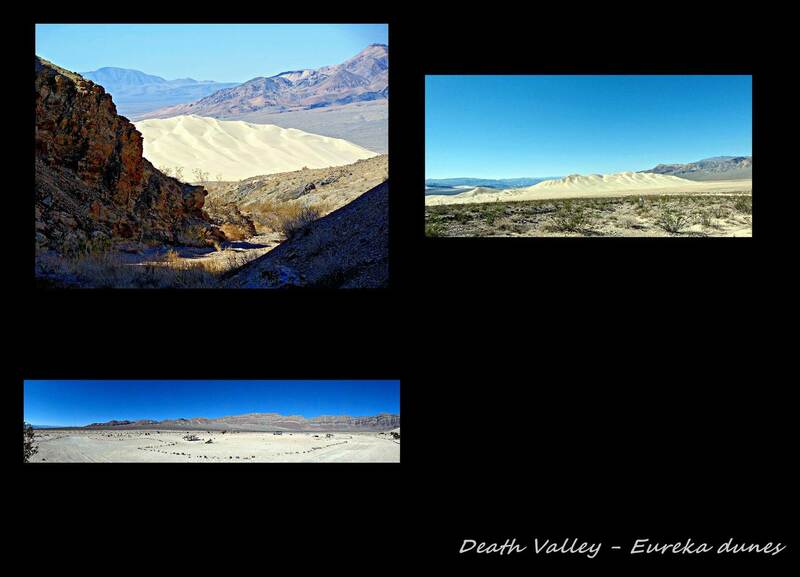 From the warm strange springs we headed north to Eureka dunes. 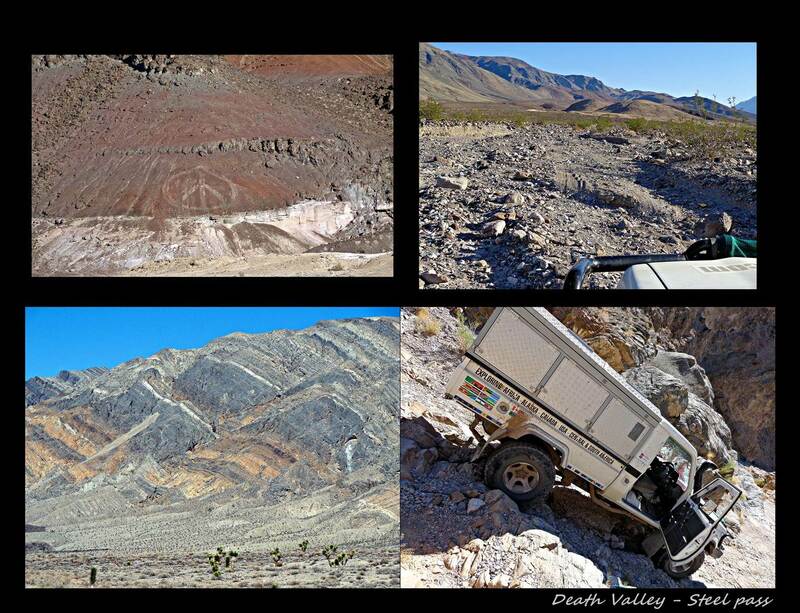 Like all previous roads in Death Valley, this was also a 4WD, high clearance road. At first there wasn’t any road just an endless amount of dry riverbeds flowing into one another giving the illusion of a flat driveway. It was bumpy and rocky and it took quite a while to get to Steel Pass…the part of the road we actually expected to be bad. What we found however was a smooth road on a flat mountaintop. We were within millimeters of Eureka Dunes on the GPS when I told Marius I didn’t know what all the fuss was about the pass, when a series of steep, narrow rocky steps showed me exactly why! In 45 deg C/110 deg F you do not want to be directing a 1.8m wide Cruiser through a 1.6m V-shape rock with an incline of 30+ deg. Obviously temperatures were not the only thing that was high during this 45min ordeal, but we made it through with the Cruiser in one piece and only some minor 3rd degree sunburn…we were sure the devil was around one of these corners! When we finally saw the Eureka dunes, the name made a little more sense..the founders must have come through the same road! When we finally drove by the “Road closed” sign from the wrong side, we saw another human being for the first time in days (since the last naked one). We were now driving toward the lowest point in North America called Badwater which sits at 282ft/86m below sea level…and as we descended deeper into the devil’s armpit (or so it smelled..), it got hotter and hotter. We have to tip our hats to the American peoples though…they still get out of their vehicles and walk to exhibits in the blistering heat, something I had to be coaxed into doing mostly! 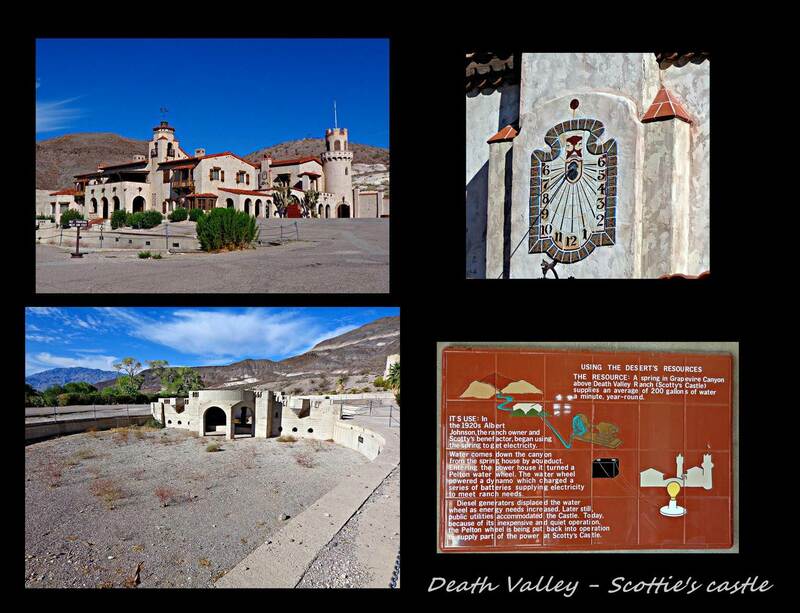 Although it had been some of the most spectacular scenery of vast desert we had seen up to now, we were happy to drive out of Death valley toward the oasis known as Sincity. 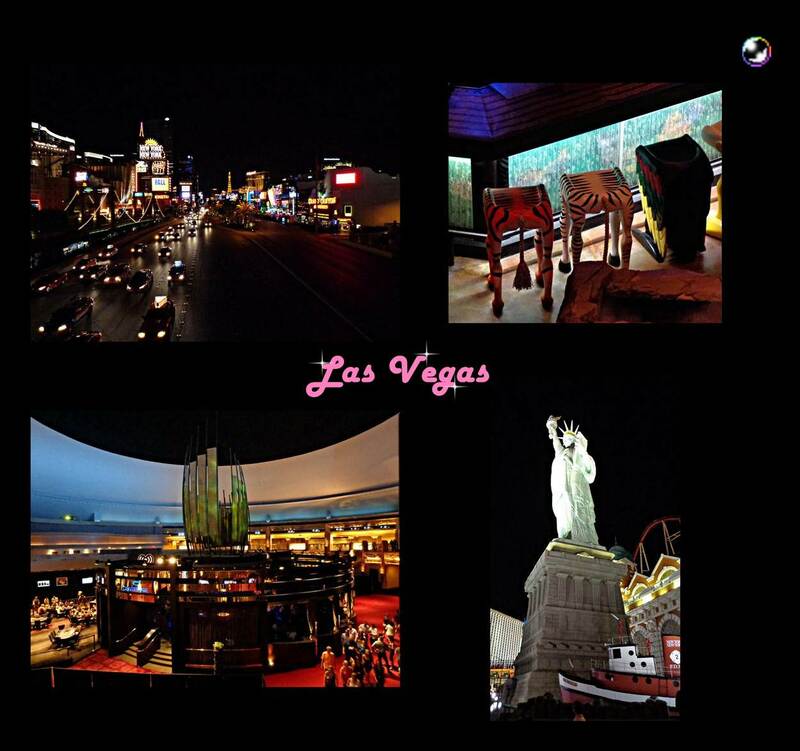 Like most oases, Las Vegas materializes in an otherwise barren, dry landscape. It seemed a bigger town than I anticipated. 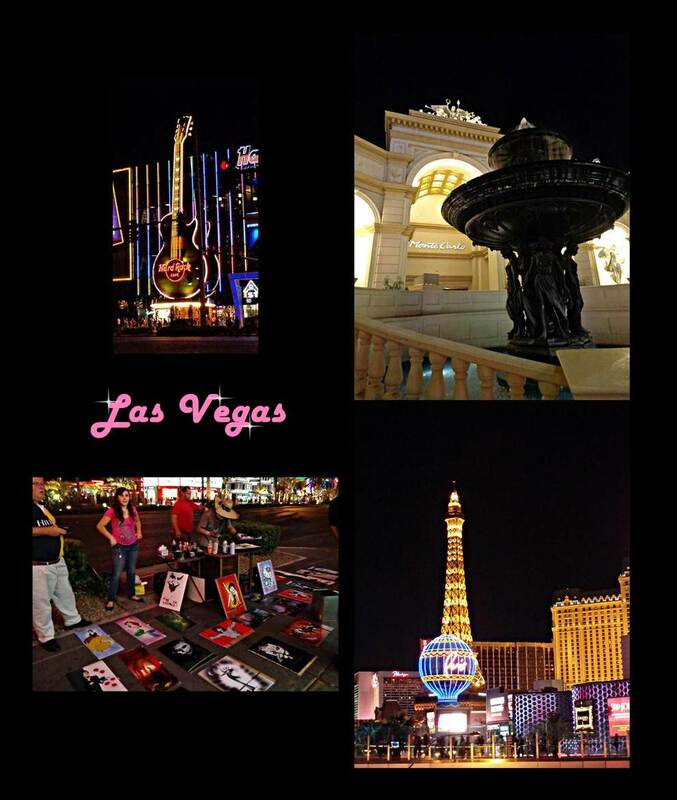 From way out of town you could see the casino’s on the strip but they seemed dusty and ordinary in the light of day. 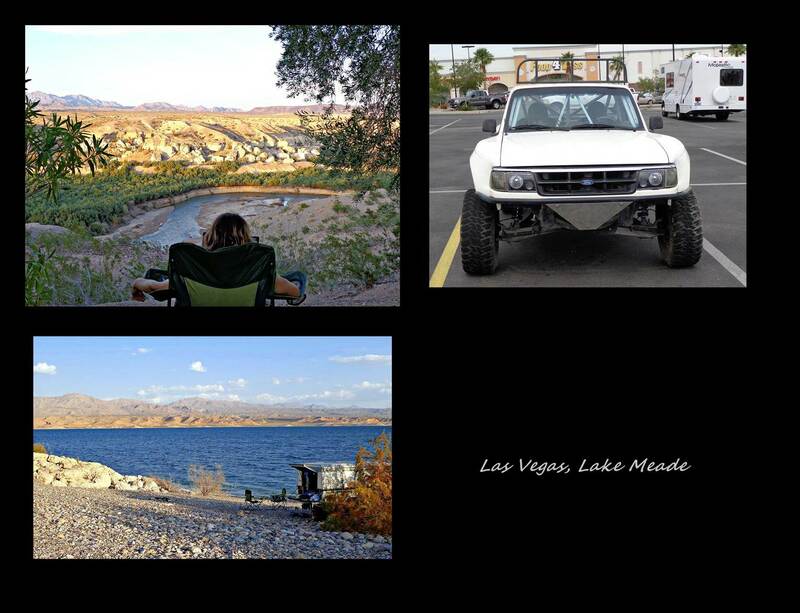 We stayed at the lake Meade recreation area for the first few nights as we wanted to avoid the weekend rush and rates. On the Sunday night we put on our “Sunday best” and headed for the playground of the rich and famous. 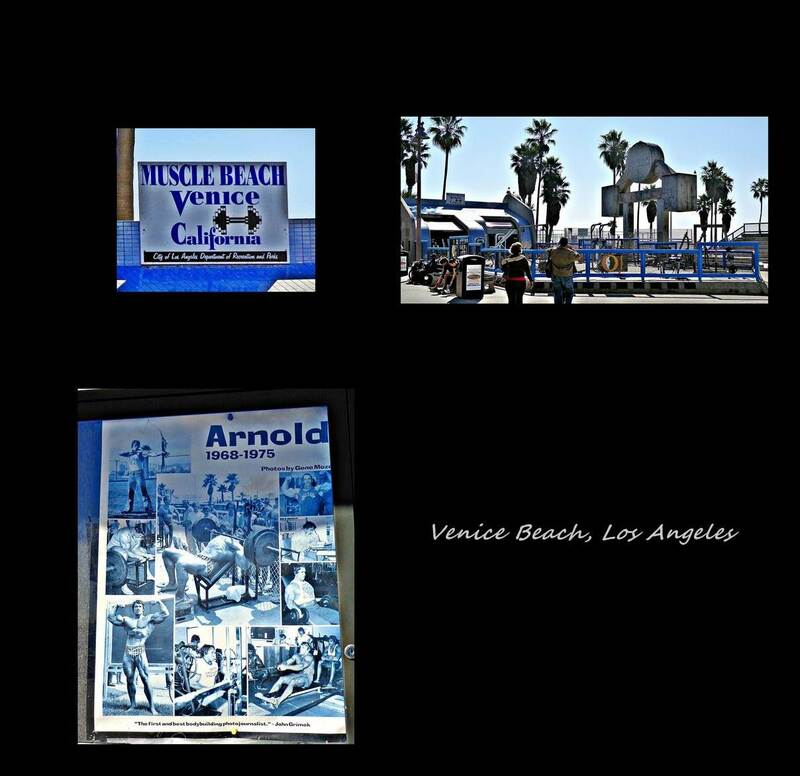 We did our research on where to get a decent buffet and luckily the locals at the mobilehome park, where we would stay after our gallivanting, gave us some great advice. We went to the Boulder Station casino and became part of their VIPs which entitled us to $6 discount on their buffet…only $9-99 for all we could eat! And we really tried our best to eat as much as we possibly could…they had an asian area, Mexican area, pizza, glorious salad bar, veggies, deserts and to Marius delight (and mine to a lessor degree) meats of all kinds …the food was great! We ate so much that we actually just wanted to sleep, but at 20h00 that evening we headed to the Strip . What makes Vegas even greater is that they really want you to go to their casinos and therefore offer free parking at any of them. 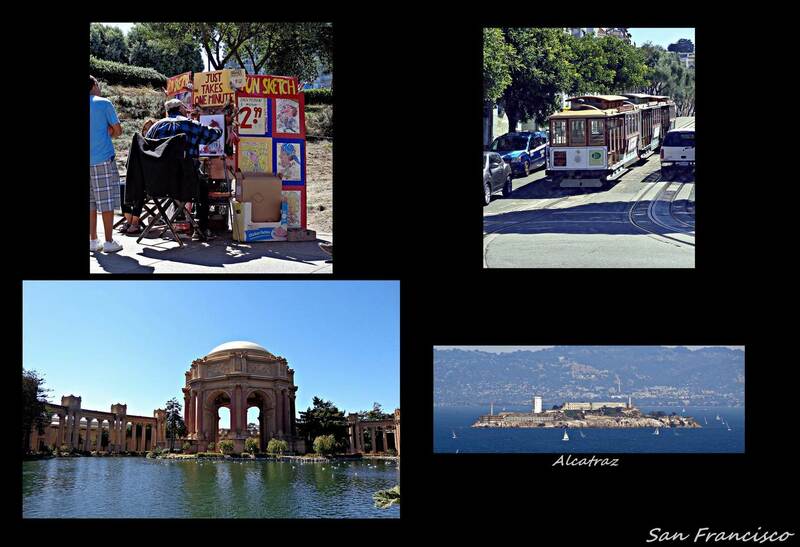 Unlike our usual trial and tribulations in cities, we had no trouble at all navigating ourselves and the Cruiser into a parking spot close to the southern end of the Strip. 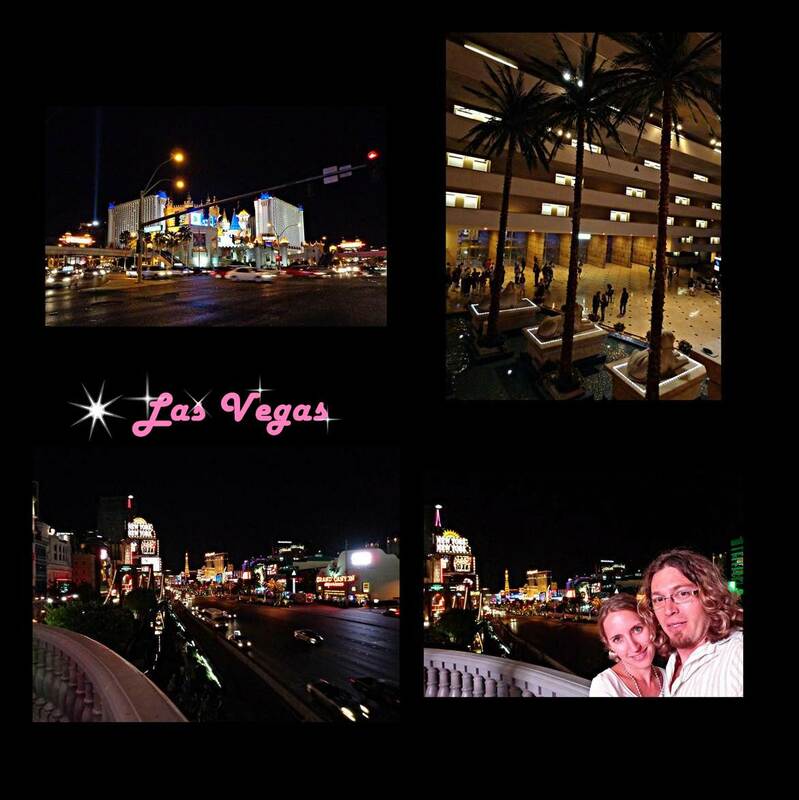 From outside, the lights of the Casino’s were spectacular…it truly is as bright and shiny as you see in the movies. 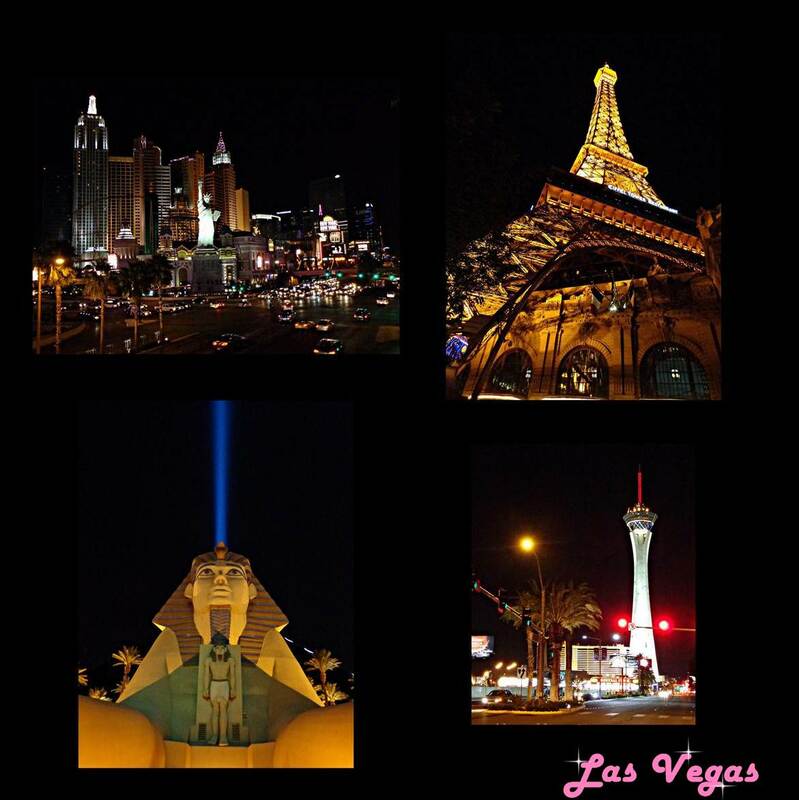 It seemed very surreal to stand below the Egyptian themed Luxor, the golden Mandalay and the Disneyland copy Excalibur we have seen on so many movies. New kids on the block like the New York New York and Paris are miniature replicas of the actual cities, complete with both Lady Liberty and Eiffel tower. 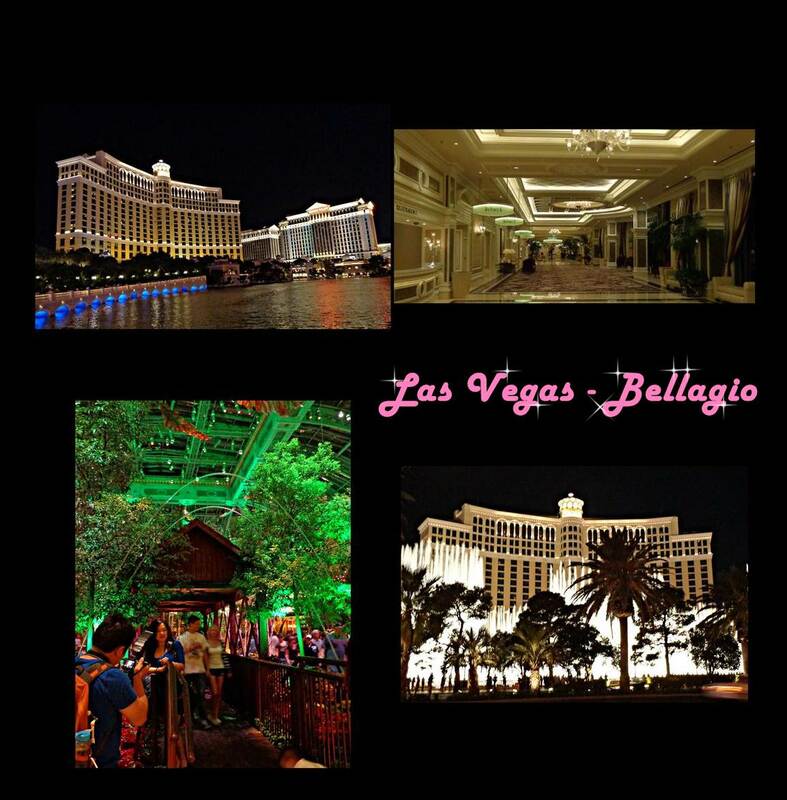 None however compared to the greatness that is the Bellagio which has an eight acre lake with a musical fountain playing every 20 min to the chocolate voice of Ol’ blue eyes . Inside most of the casino’s looks like most casino’s do…flashy slot machines fed with coins from a tired looking lady with a drink in one hand and a cigarette in the other. Pictures say a thousand words, so here’s me keeping quiet! 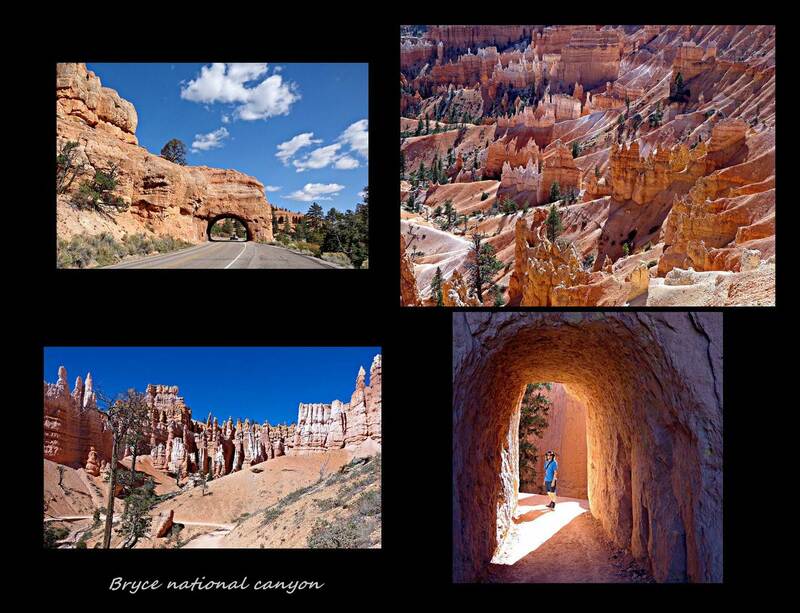 After Las Vegas we were heading to Utah aka National Park Central. 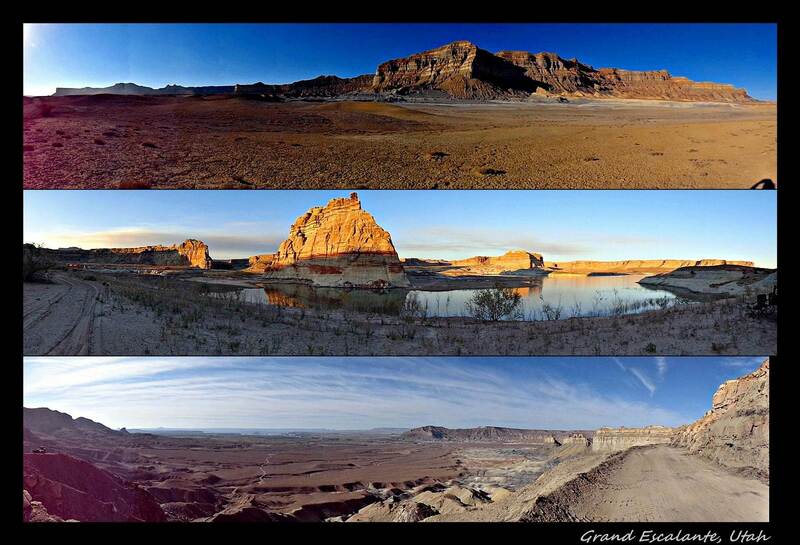 Here, most tourist do what is known as the Grand Circle which includes Zion, Bryce, Grand Canyon, Capitol Reef, Canyonlands and Arches National Parks as well as a few National Monuments such as Grand Staircase-Escalante and Monument valley to name only two. 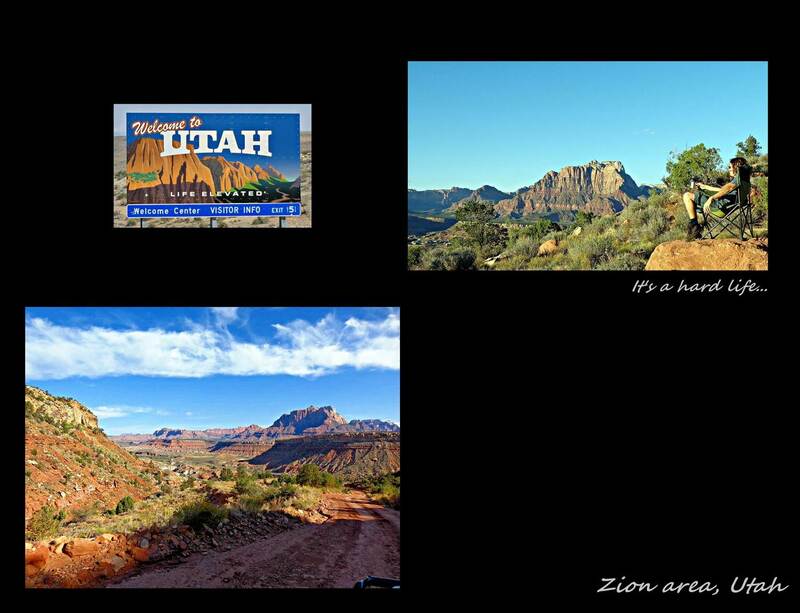 They have actually talked about just making the whole Utah one enormous national park, might be easier! To try and put this whole areas geography in a nutshell seems almost impossible but here goes..long ago streams, deserts, oceans and volcanoes deposited layers of mud, lime, sand and ash. Heat and pressure turned the sediments into stone and years later a large chunk of about 180 000 acres, now known as the Colorado Plateau, was lifted by underground forces. Rainwater started trickling into minute cracks in this plateau eroding away at the large sediment and ultimately resulting in the canyons and structures we see today. 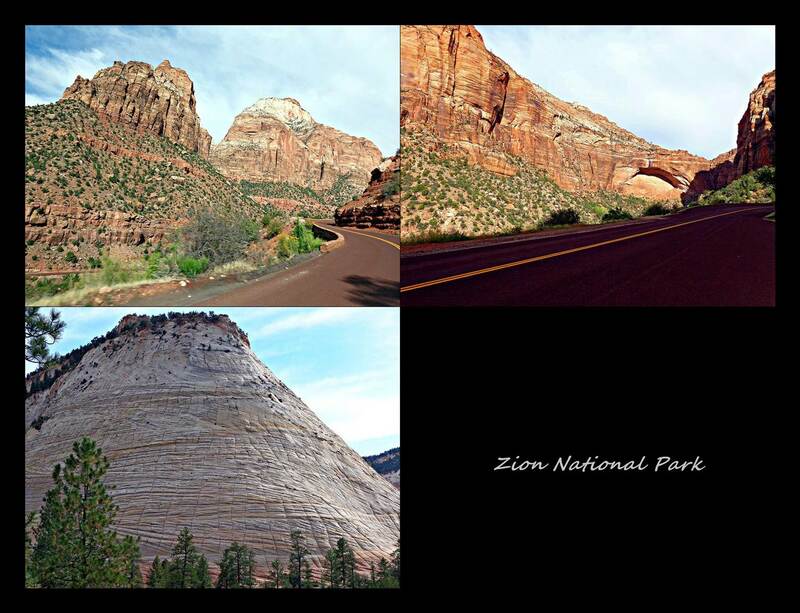 Anyway, we started with Zion…a beautiful canyon named by Mormon pioneers who found refuge from the dry desert in this area. 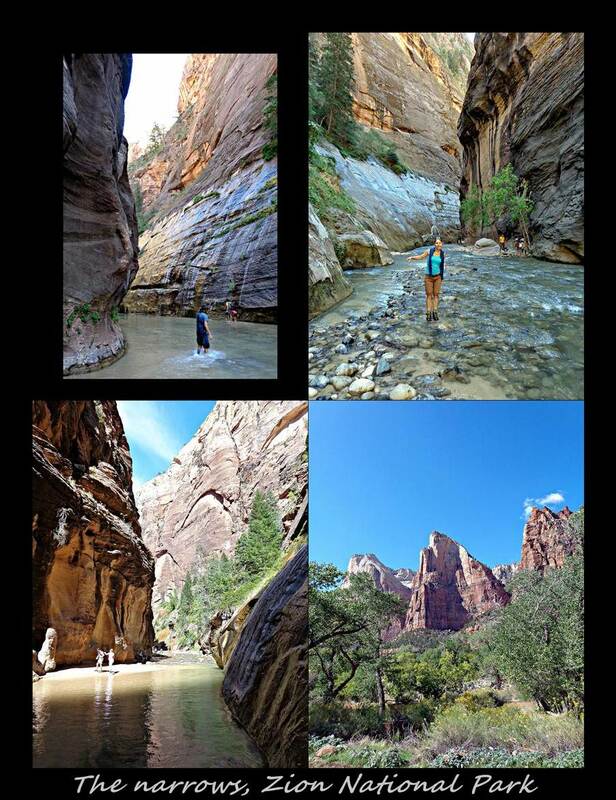 At the very end of this golden canyon you can hike in the Virgin river as the canyon narrows eventually ending in slot canyon (basically where you have to step into the fissures of the canyon whilst being able to touch both sides of the canyon walls). We didn’t hike the entire 14 miles that it takes to get there, but we hiked in far enough for our shoes to be soaked and our toes frozen. 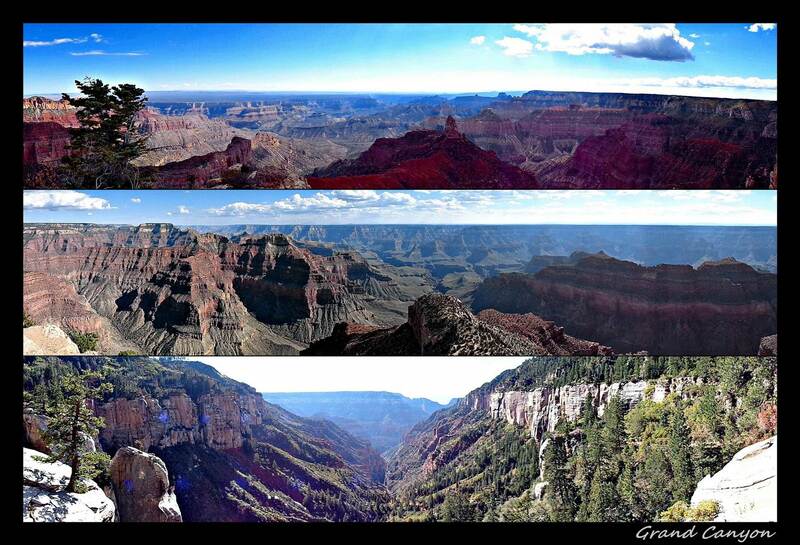 Next up we visited the North Rim of Grand Canyon in Arizona. 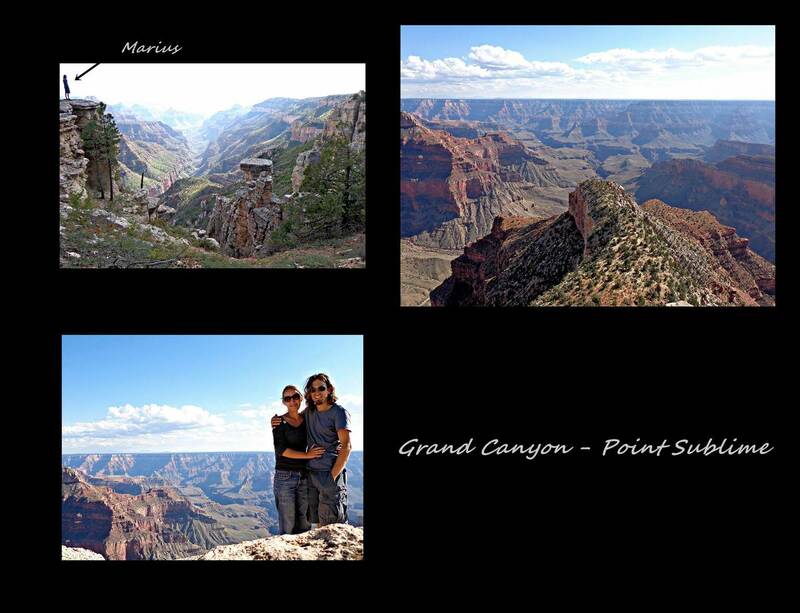 We decided on the north rim because it was more on our way and it was said to be the less touristy side of the canyon. After seeing the North rims tourist, we shutter to see what the south rim looks like. We drove and hiked to most of the overlooks like Point Imperial and Bright angel point, but it was after reaching Point Sublime on a dusty 28 mile road that our jaws finally dropped that this grand crack in the crust. We think that the sheer size of the whole area is almost incomprehendable and the 240 deg view and the view of the mighty Colorado river way down in the canyon kind of put things in perspective. 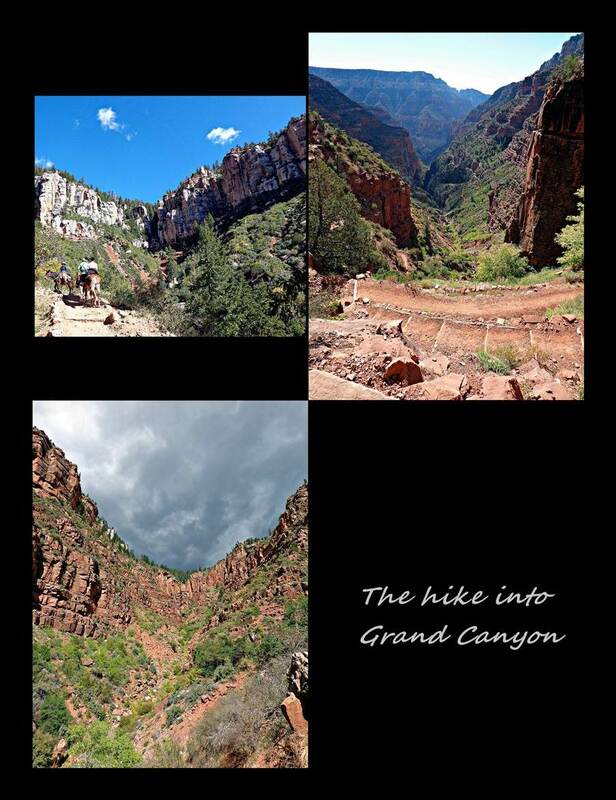 The next day we did a 8,2km roundtrip trail into the canyon and almost didn’t make it back up. How silly we felt when we were met by runners on their morning jog up and down the canyons 45kms..Anyway, I thought we did really well! We had heard of a place called “the Wave” located in the Vermillion cliffs National monument. 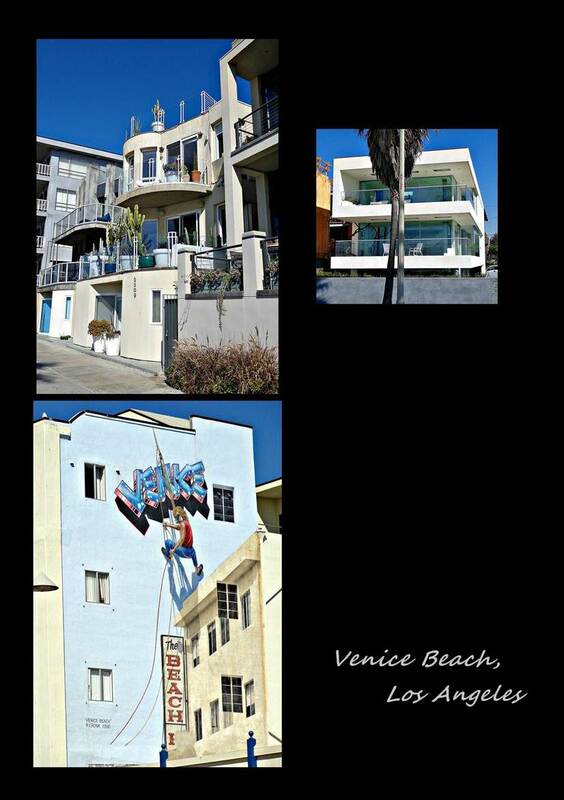 The story goes that this amazing place can only be seen by obtaining a permit in a type of lotto scenario. We thought that you can get the permit on site and therefore headed there. In a lucky turn of events we stopped to use the restroom at a Condor releasing ceremony (yes, this is exactly as strange as it sounds) and met a ranger there who informed us that the permit should actually be obtained in a town 45 km out of our way…Fortunately however he directed us to an area which was pretty amazing to see and needed no permit. 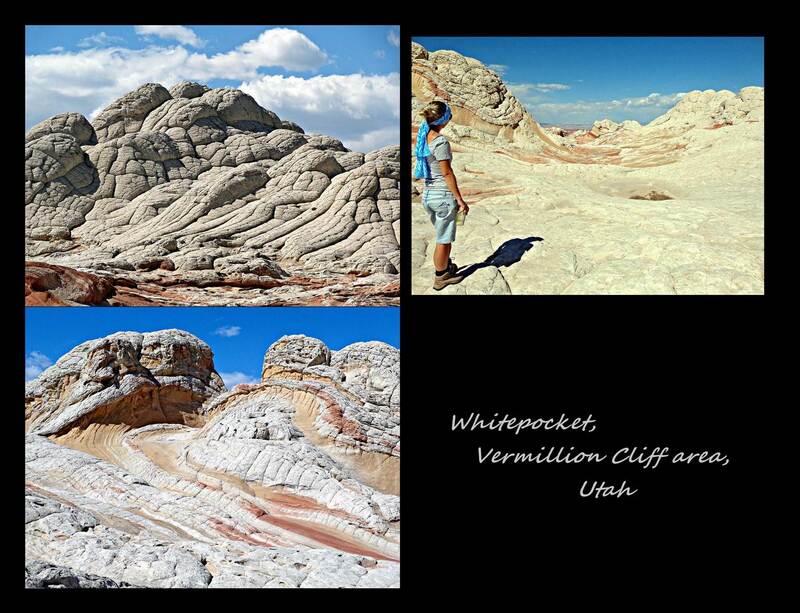 I have no idea how the area called Whitepocket was formed but it sure as hell seemed like something on a different planet. 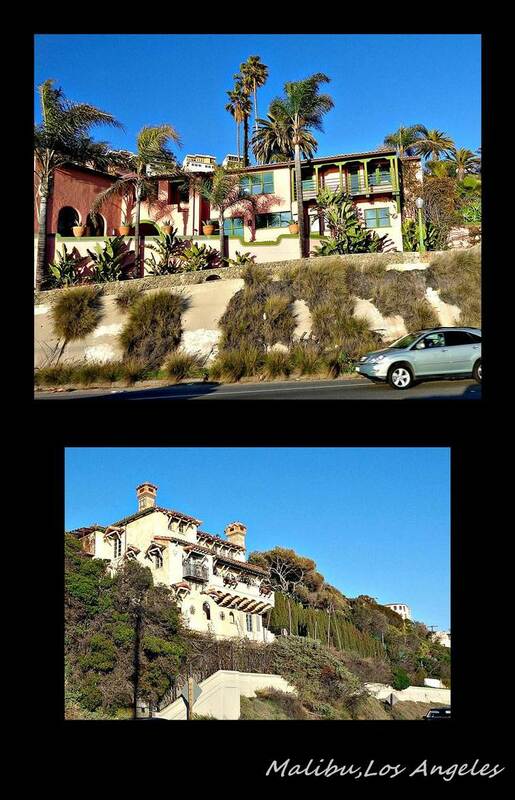 It was beautiful and although we didn’t see the “wave” we know such a place exist and we have some pictures of it. Make sure to get your permit in Kanab! 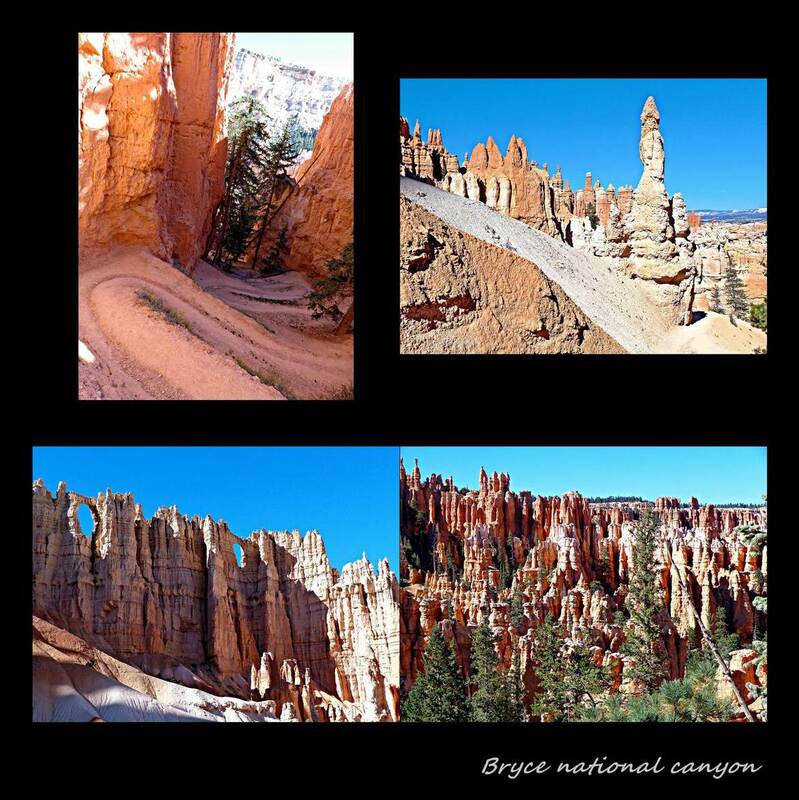 Bryce National Park was named in honor of Mormon settler Ebenezer Bryce who proclaimed it to be “a helluva place to lose a cow”. And we can agree with such a statement. 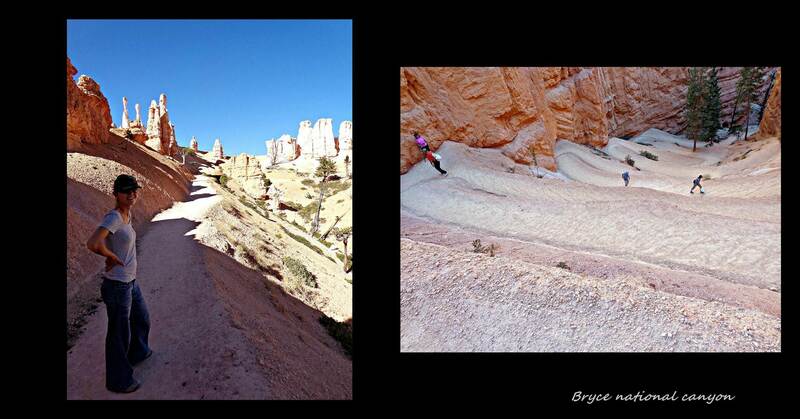 Here, hoodoos are scattered across a canyon floor illuminated in bright red and all shades thereof. The formation of this myriad of phallic symbols can be attributed solely to the freezing and thawing of water. When water becomes ice it expands to approximately 110% of its original volume resulting in pressure which forces the cracks in the rock apart. The first cracks to be attacked are those created by the initial uplift of the plateau resulting in fins of rock remaining. Next, frost-wedging cracks the fins making holes called windows which then eventually collapse leaving colorful pinnacles known as hoodoos. 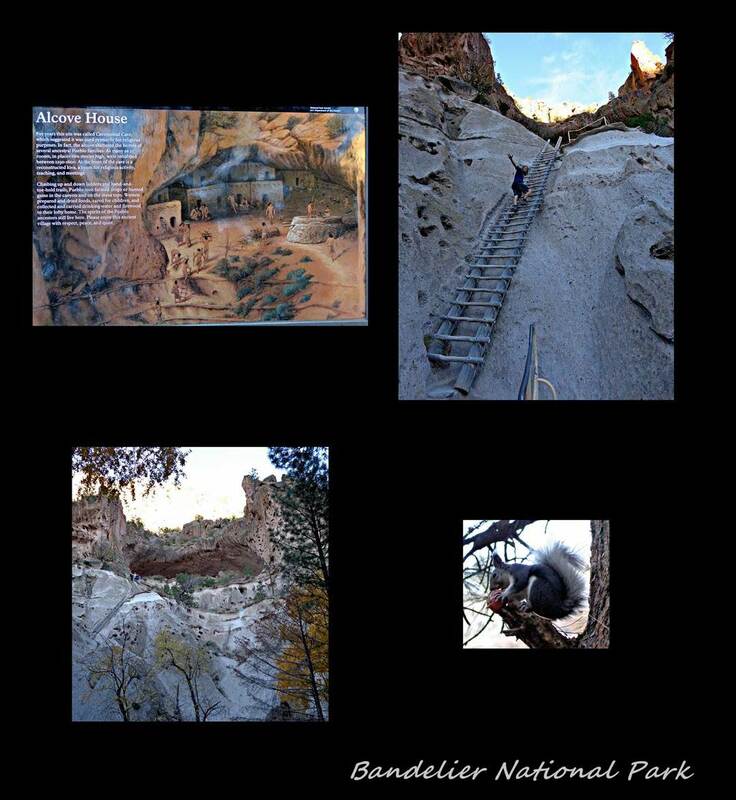 We hiked down to the Queens garden and then did the Peekaboo trail before dragging our heavy bodies up the supersteep Navajo trail to the top. It was beautiful! 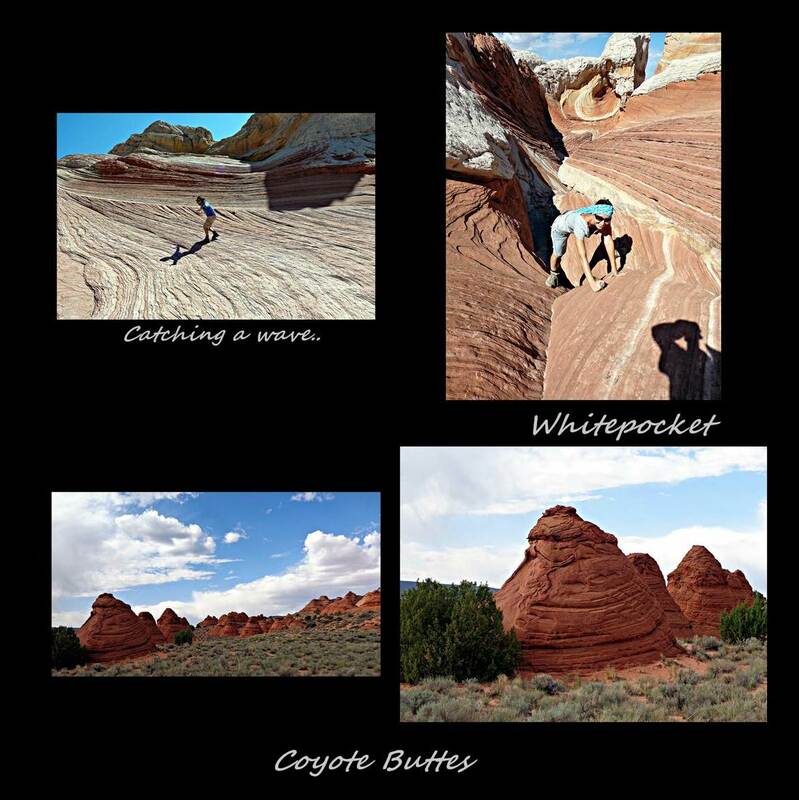 We planned to enter Capitol Reef National park from a small, unpaved forest road …the kinds Marius has the gift of finding! We set up camp for the night a few miles from the entrance to the park as dispersed camping within the park is not allowed. It was late already and we just finished dinner when darkness descended. We had just mentioned how far away from anything we were when I noticed a small light not too far away. We knew there wasn’t a road going there because we came from that side, so we didn’t really like that someone was just randomly staying in the middle of the forest with only a torch. By now we knew it wouldn’t help to ignore what we had seen and we might as well pack up and drive on. And so we did and sooner than later we got to the park boundary where we knew if we entered we would have to drive to the campsite which was another 30 miles north. Just as we had resolved to sleep infront of the gate, we saw two more lights, this time it was the headlights of two vehicles driving on what seemed to be the same road that we came on…we knew it was probably people doing exactly what we do but it was more than enough to convince us to continue driving. If we had only known that this would be the worst road on the entire US trip so far, we might have slept right there. At only 14km, this full on 4WD,low range, difflock road with steep side inclinations and some water patches mostly on the ledge of some mountain would have been fine, had it not been 8pm at night. 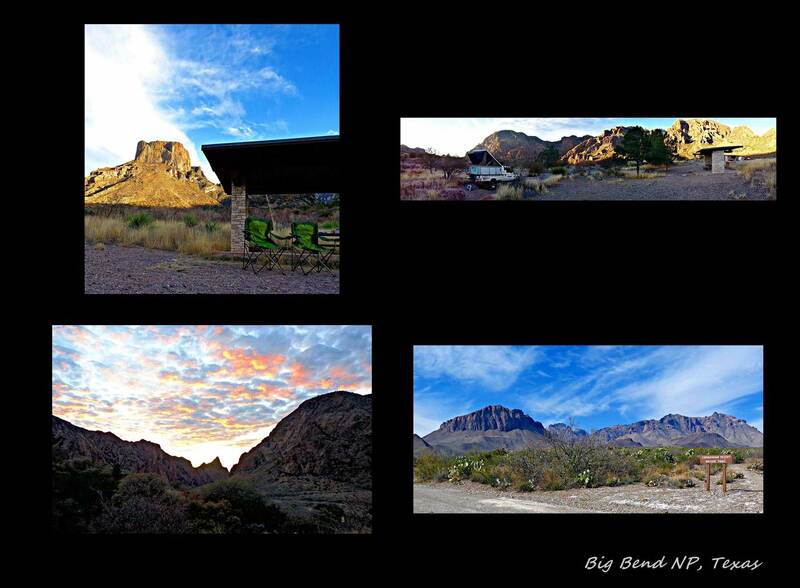 It took some time to get to the main scenic road and campground and as Murphy would have it, the campground was full. By this time it was well passed 11 pm. Luckily some guy somewhere told us that people do sometimes camp just outside the park boundary and we found the area without problem. When we got out the wind was blowing like there were no tomorrow and we crawled into the back of the Cruiser, as it would have blown the tent to smithereens. 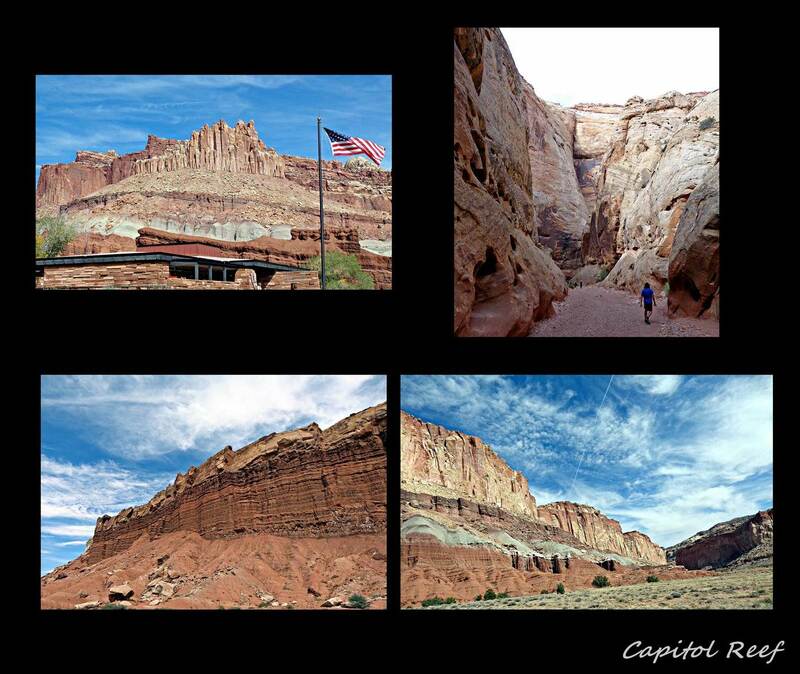 We only got to see reef of Capitol Reef the next day and although beautiful we had seen so many spectacular mountains and rocks that I think we may have been a little desensitized. Craig and Anne..thanks for all your advice and books on the roads in the Death valley national park and around, and also what to see on the Baja in Mexico, we definitely have better idea of what not to miss! Bill and Gene, we had a great time hiking with you guys, thanks again for the amazing calzone and great conversion. 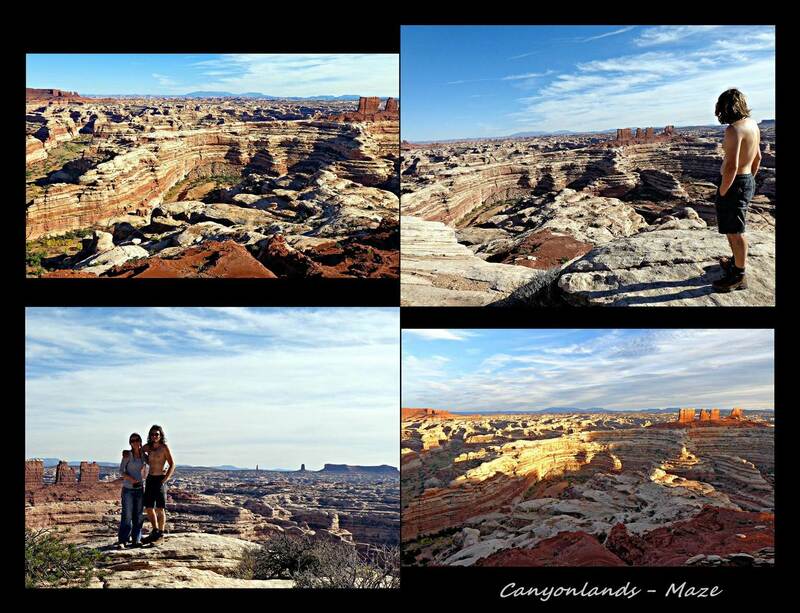 After Capitol Reef we headed to Canyonlands, the biggest of all the parks in Utah…and we both agree the one that has the most spectacular scenery to offer. The park is divided into 3 regions by two rivers, the Green river and the Colorado river that form a Y-shape as they combine into one. On the west side of the Y is the Maze district which can only be explored with a proper 4WD vehicle. They are so adamant to make you understand that this area is serious off-road and that you are really on your own that they have a sign telling you that if you were to require any help, a chopper would be your only rescue and that it would set you back a mere $10 000 -25 000. We thought that we had probably seen worse in Africa and on we went. This time however, the Americans were not just dotting their “I”s and crossing there “t”s…As soon as we headed to Panorama point after we got our required permit for the four nights we planned to stay in the area, we were hopping from one rock to the next at a snail-pace. The friendly lady told us that it usually takes about 2h to get there but because the Cruiser is soo heavy, we took a hour longer! After hour two we were sure that no viewpoint could justify this terrible road, but just as the sun had set we arrived at the site and were proven so wrong. 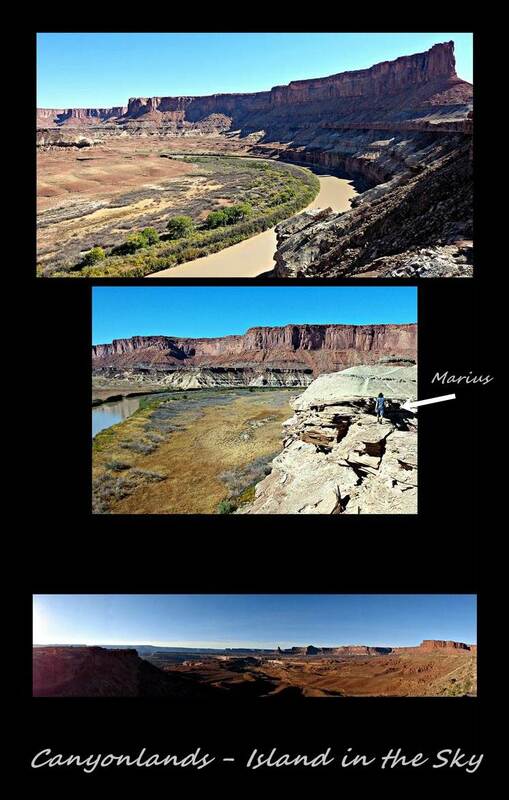 The viewpoint was on the top level of a canyon within a canyon, within a canyon. Here and there sturdier sediment had left fingers and bagpipes rising up to our level…it were a sight difficult to put into words. We stayed there for the night in a silence which almost hurts your ears. 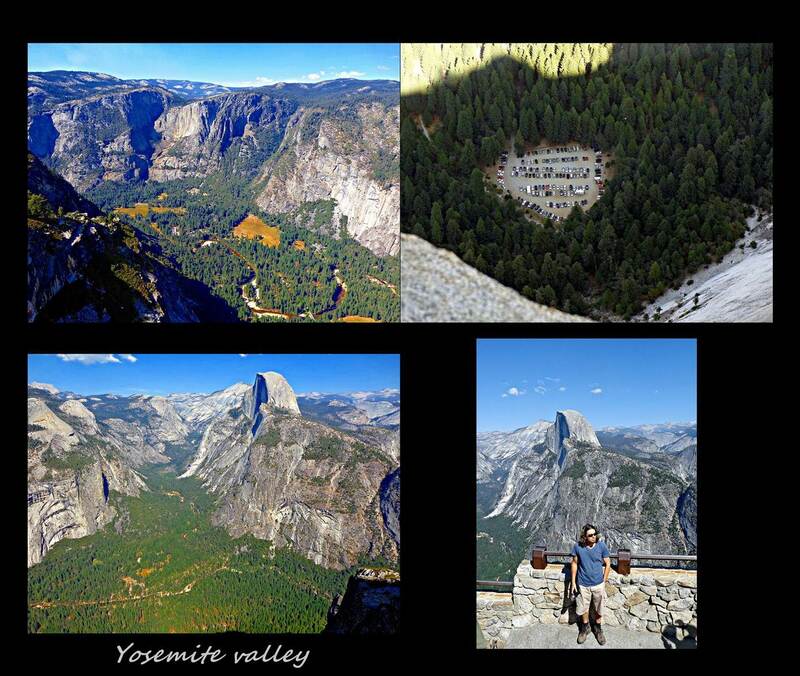 They actually mention how they measured the interior of the park and found it to be one of the quietest places in the US. The next day we crawled to the Maze, a campsite situated on the level just below Panorama point. 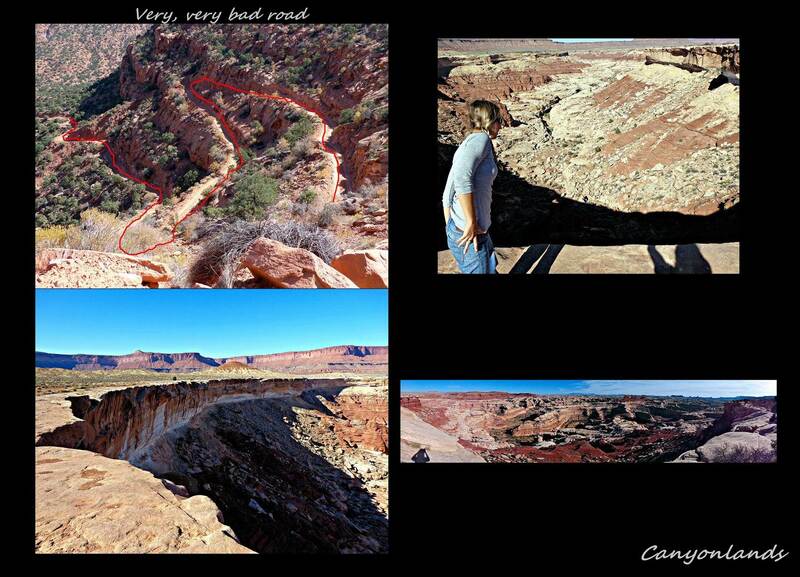 A very steep and narrow rocky road makes grey-hair inducing switchbacks along the rim of the top layer canyon until reaching bottom about 45min later. The road was pretty bad, but compared to the Panorama point road we expected much worse. It took us most of the day to drive the 45 km to the campsite but like Panorama point the view made the drive completely worthwhile. We hiked down into the canyon but could only reach level 4 (advanced) of the 5 before our rock climbing skills (and cahunas) let us down. We opted not to go to the Dollhouse campsite as the road there was supposedly the worst in the whole Maze area and our, as well as the Cruiser’s 4×4 itch had been scratched quite enough by this point. 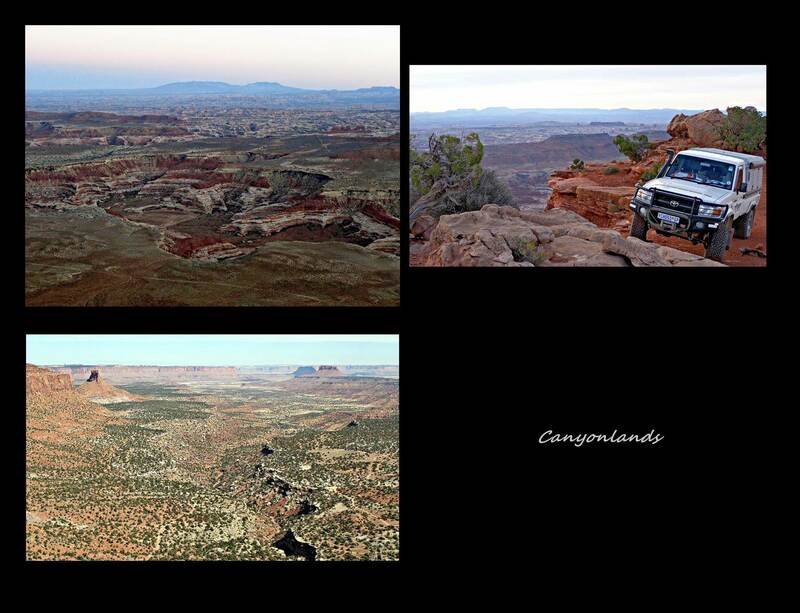 The second area of Canyonlands are in centre of the Y called the Island in the Sky…literally an island in the sky because you drive on the rim of the top level island that protrude into the canyon area offering amazing views of the canyons below. 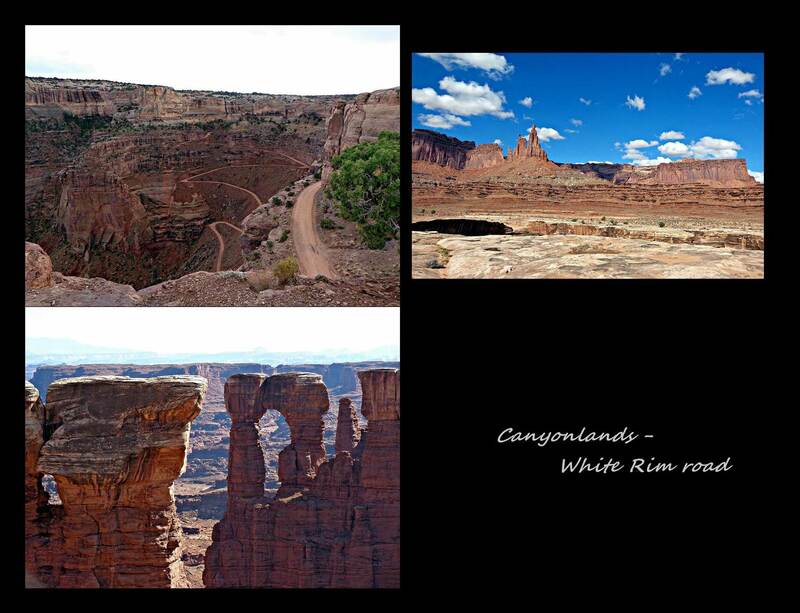 On the level below that one, a 100mile road called the white rim road circles below the island allowing you a close-up of the large canyons being carved by the Green and Colorado rivers. We were lucky to get two camping spots along this rim road as the ranger-lady told us that some of the spots are booked as much as a year ahead of time. It was three days of beautiful scenery and two nights of good weather camping. Arches national park was our last park we would visit before heading south out of Utah. 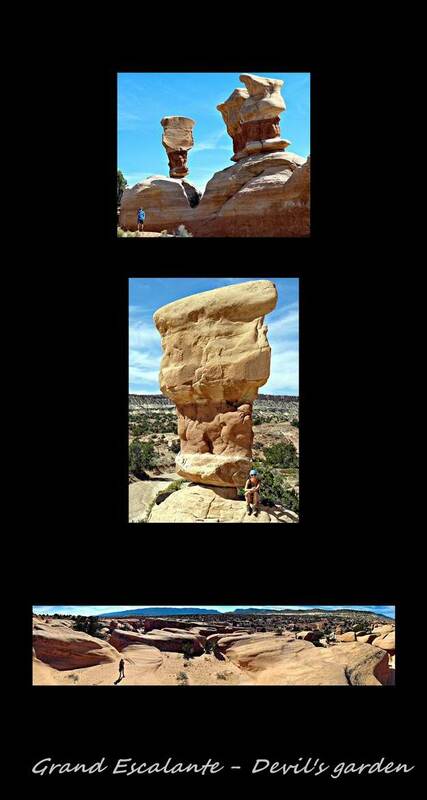 As the name implies there are a number of rock arches that you can see in this small park. About 300 million years ago a salt layer was deposited on top of the Colorado plateau by a sea that once flowed in this region. Wind and floods resulted in layers of sediments being deposited and eventually formed rock on top of this salt. As a result of the pressure, the salt became unstable and shifted, thrusting the rock layers up as domes while whole sections fell into cavities. Faults deep in the earth resulted in vertical cracks. As the ice seeped into the cracks resulting in pinnacles at Bryce national park, it also contributed to the breaking off of bits and pieces of rocks here. Wind and water did the final touches resulting in the amazing arched rocks we see today. The longest arch in this park is the landscape arch which is 306 feet long and the most spectacular arch is probably delicate arch. It was also here that we got our nicest complement so far…and that from a 3 year old! 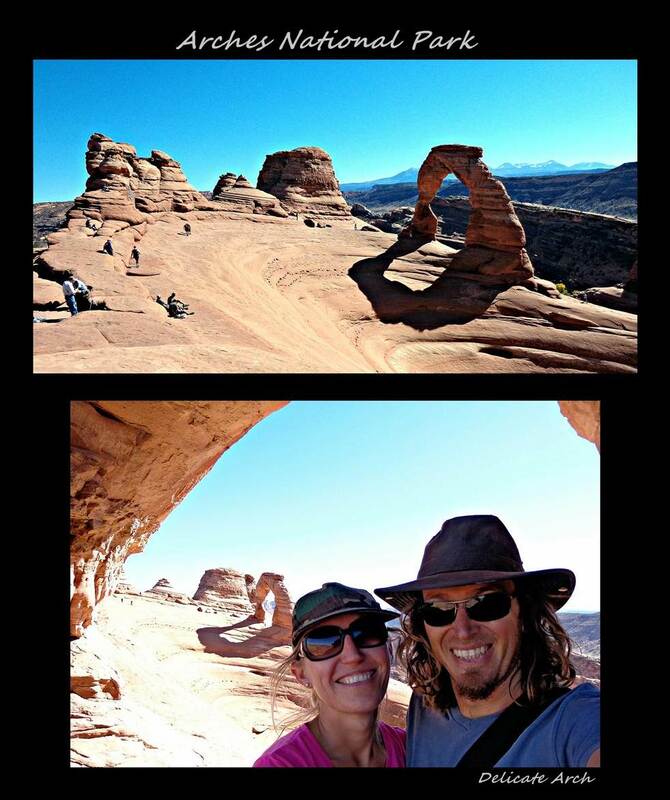 As we were hiking to Delicate arch, we had a few climbs up and down rocks..as we were hopping down one of them, she asked her dad…”are they kids?”…from a kid, I’ll take that as a good thing! From arches we started heading south through 4WD central (aka Moab), then along a forest road on the rim of the third part of Canyonlands (the right side of the Y), down a Moki Dugway into the Valley of the Gods where we could start to see that we were getting close to Monument valley. 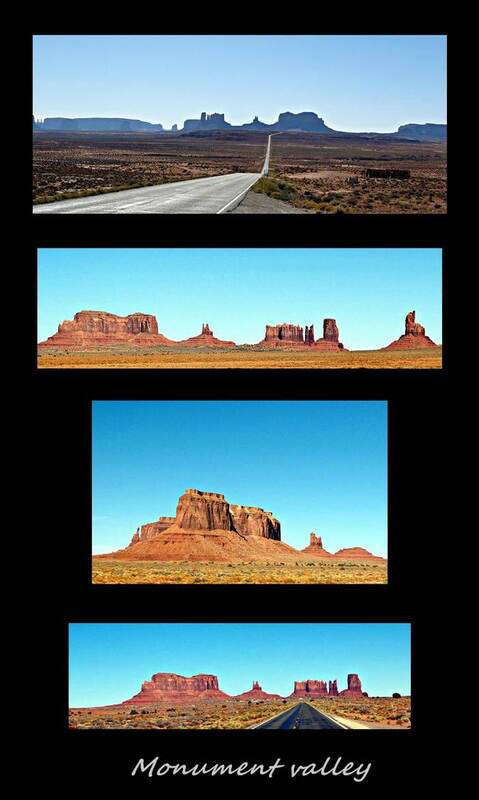 The plan was to sleep in the campground at Monument Valley which is located within the Navajo Indian reservation. 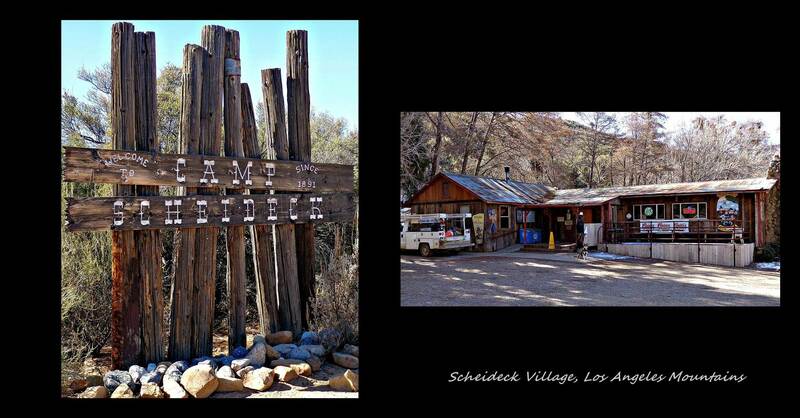 When we got there, the campground was being renovated and there were only one other option for camping in the area. As most monopolies in the world work, the rates of these guys were way above our budget, and who needs a shower when you just had one two days ago ;-), so we took some photos at the gate and headed back to Valley of the Gods where we could sleep for free. Strange how the roadsides were not as pristine in the Indian reservation as elsewhere in the country…we even saw two dead horses decomposing next to the road. We were disappointed that we couldn’t go into the park but we saw some of the Monuments from the road. 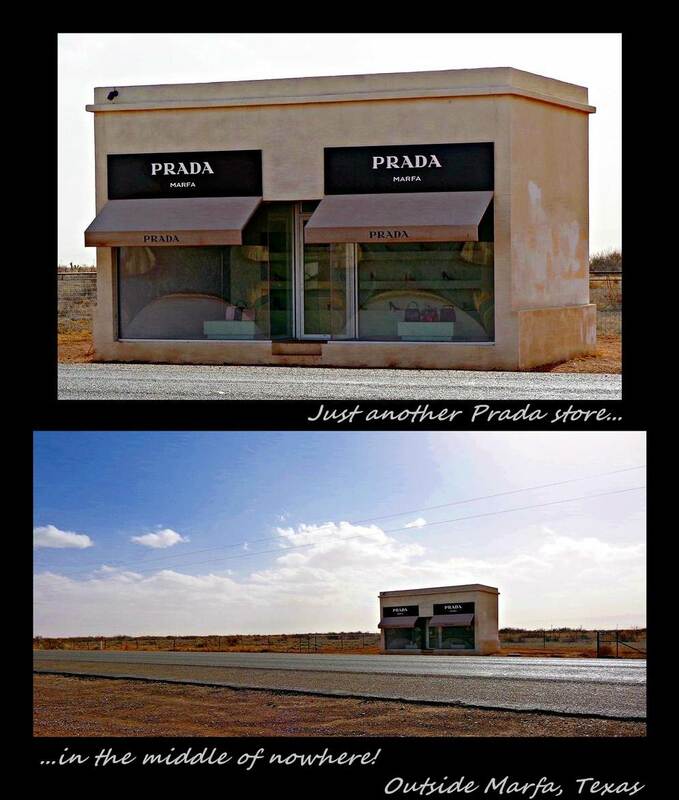 [FYI…as I am writing this on a lonely, endless highway heading to Roswell, New Mexico we just slammed on brakes for a 1.2m tumbleweed…that’s a first!]. 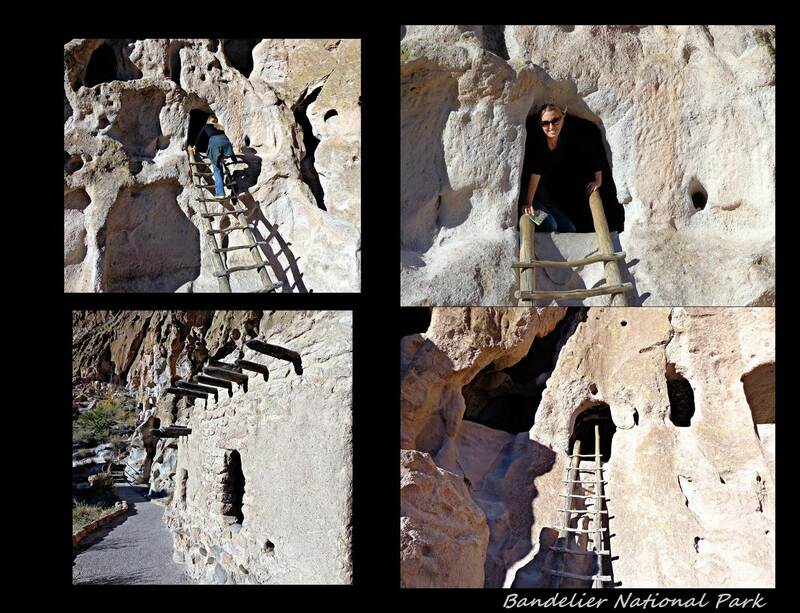 Our first stop in New Mexico was Bandelier National Park where the Pueblo people built dwellings in the sandstone cliffs. 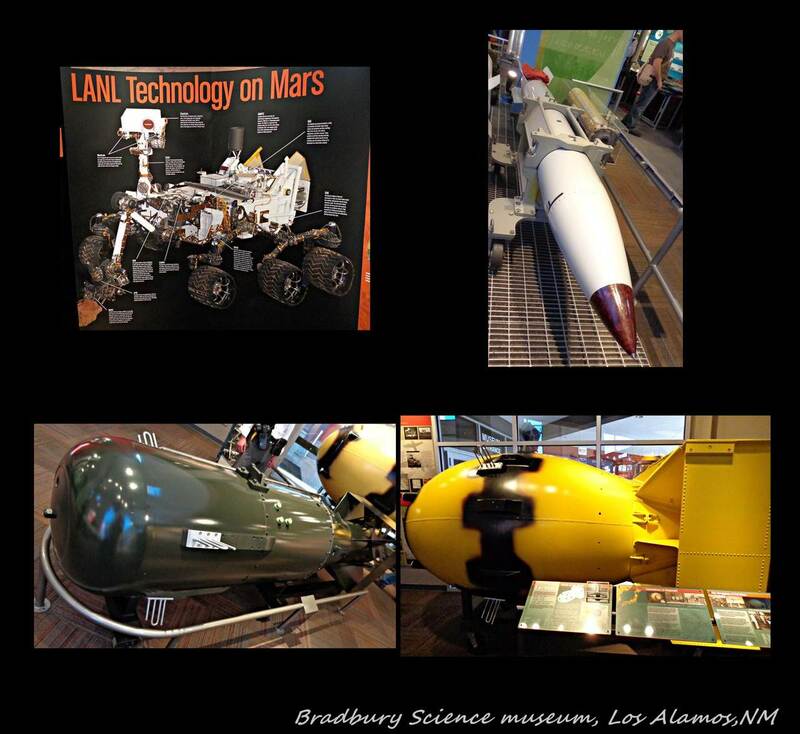 Very close to this old civilization is the town of Los Alamos, better known as the birthplace of the nuclear bomb. It was here that during WWII that a large community of scientists from all over the world moved and worked tirelessly until they had built what eventually resulted in the end of Hiroshima and Nawasaki. Pretty weird to see how small the “Fat man” was that resulted in such a enormous blast! 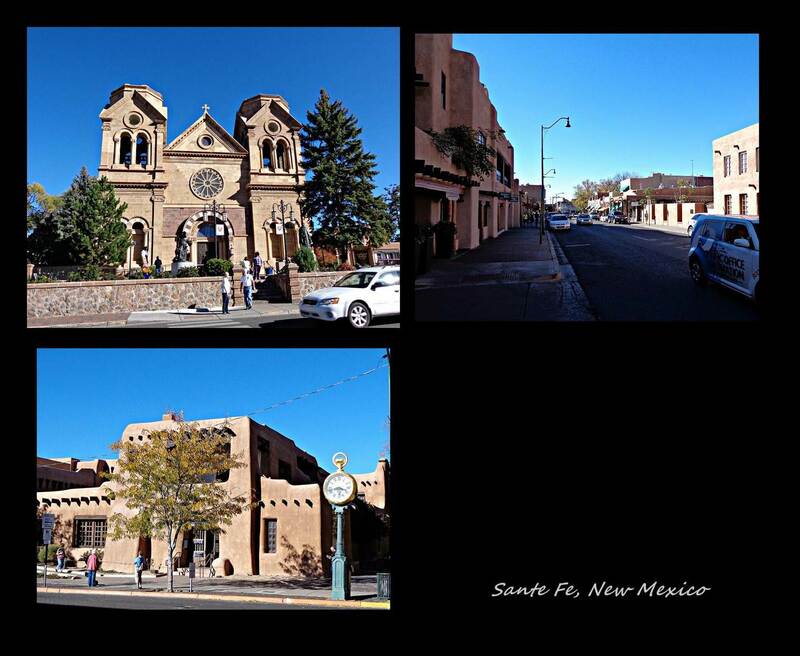 Not far from there, lovely Santa Fe introduced us to a whole different type of architecture known as adobe houses. Around the plaza you can almost imagine that you are in some old Spanish town minus the sombreros but with some expensive stores selling leather coats, boot and jewellery. Finally, we had to go and find the aliens in Roswell but instead of finding little green men we found brilliant scientists, cheap fuel and the dairy capital of the US. The Roswell incident, as they like to refer to it here, happened in 1947 when a farmer outside the town informed the authorities that an object had fallen from the sky. Major Jesse Marcer of the US army sent a report to the paper that an alien spacecraft had fallen, there was even a photo of him holding pieces of the “craft” (it looks something like a cardboard covered with aluminum foil). Two days after going to press, his statement was retracted and it went from being a spacecraft to being a weather balloon! Although nobody will ever know the truth (well, no one we will know anyway), the “incident” was the best thing to hit Roswell. The possibility of an actual alien landing in the vicinity is enough to lure thousands of tourists per year resulting in a lot of $$$$. The actual star of this town was however a rocket scientist called Robert H Goddard known as the “father of modern rocketry”. Between the 1930 – 1942 he launched a large number of self-built rockets, seventeen of which reached altitudes of over 1000 feet. After his death his faithful wife preserved all his notes and experiments and as a result Goddard has since been awarded 214 patents! A truly “alien” intelligence! 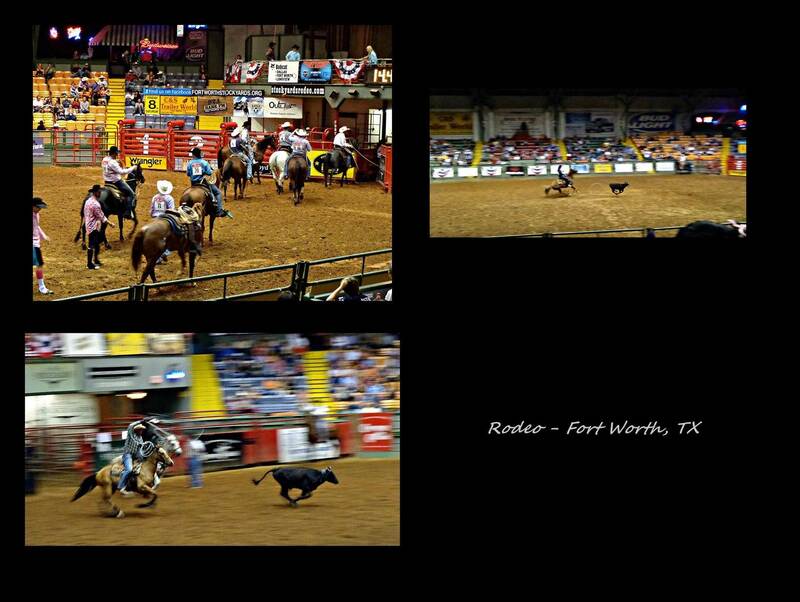 Our next destination was Fort Worth, TX. 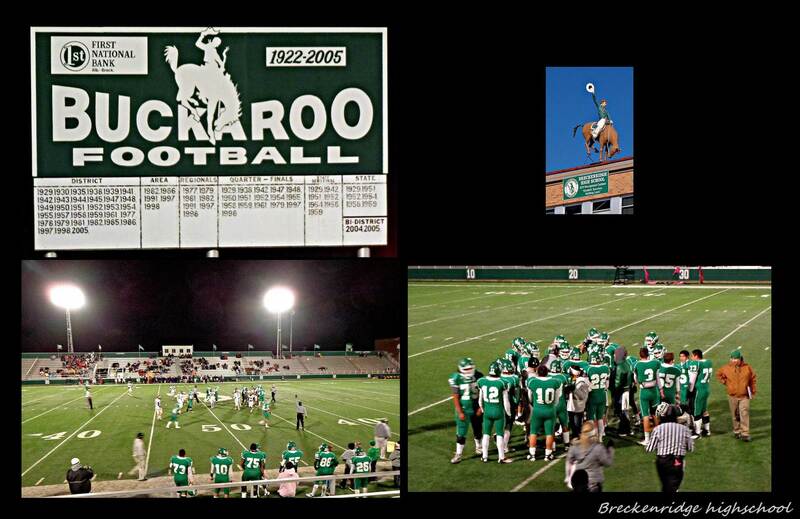 We had two goals in this self proclaimed cowboy town: We wanted to see a Rodeo at the Cow coliseum which hosts them all year round and we had to go for a Nascar race at the Texas motor speedway. On our way to Fort Worth we passed the small town of Breckenridge. We were standing in the parking lot of the visitor centre trying to find a cheap camping spot when we were greeted in a familiar language. It was Afrikaans! At first we thought it must be a South African who had immigrated, but Steve soon told us that he was actually from Texas and had built a church in South Africa and that he and his family had lived there (in Rustenburg no less) for 8 years. We spoke for a few minutes and he invited us to Friday night high school football which his son was playing in that night. I had been hoping we could see a football game while in the states, but was still trying to contemplate where we would sleep that night when Steve returned and informed us that everything had been sorted. He was so kind as to book us into a B&B for the night and then also took us for dinner that night before the game. He sat us next to friends of his and his wife Carey who gave us a play by play on how football works. It was great to be out at night and to see another characteristic American sport. His son Kalib was the star of the game scoring two touchdowns amongst other great plays. It was cold that night and we were super grateful to crawl into a warm bed at Laverle’s B&B (The keeping room). The next day we were treated to homemade pancakes, bacon and eggs for breakfast where we met some interesting other people that stayed over that night. When we went to say goodbye to Steve, Carey, Kalib and their daughter Courtney they invited us to lunch and being the not-so-typical South Africans that we have become on the trip, we accepted with and stayed for most of the day. It was so much fun to share the funny (and sometimes somewhat disturbing) stories of SA with American people who actually understand exactly what you mean. 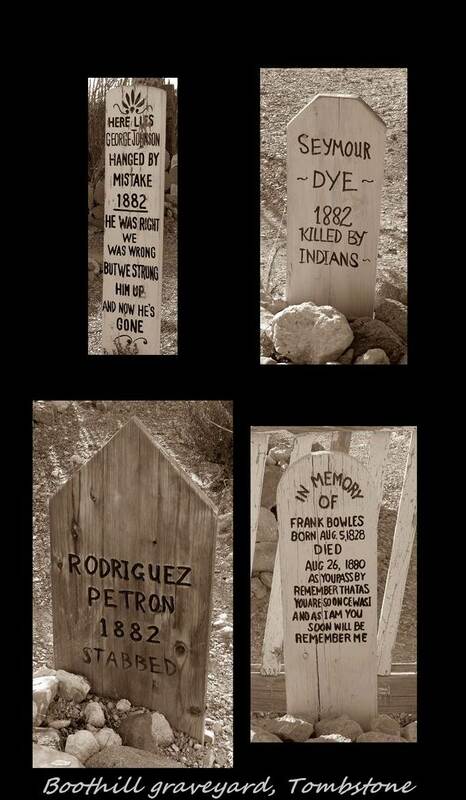 They were just such a good example of how to live your religion instead of just speaking it…thanks again guys! Just as we were leaving Steve told us about a car show he had to go take some photos of downtown, so we stopped to look at some vintage cars. 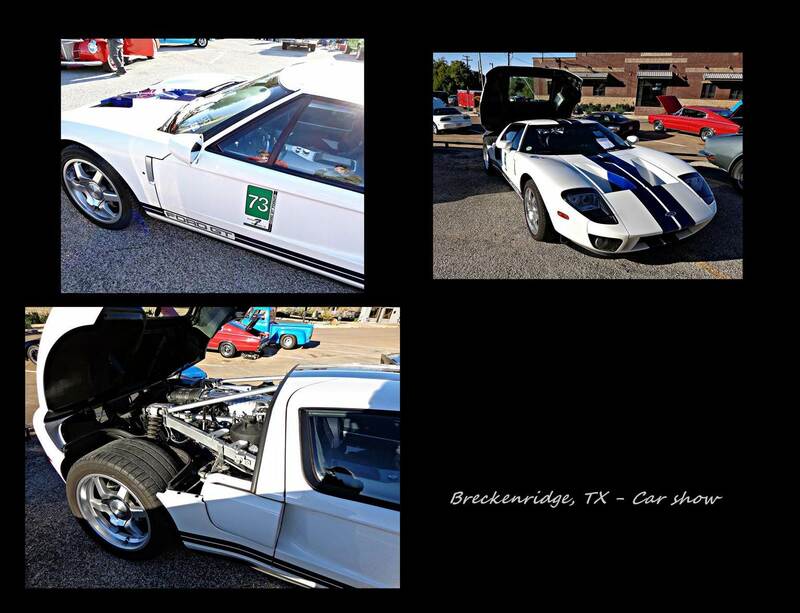 Among the cavalry there was a Camaro ‘66 and ’68, Ford GT, and a 57’ Chevy complete with the roadhouse tray in the window! 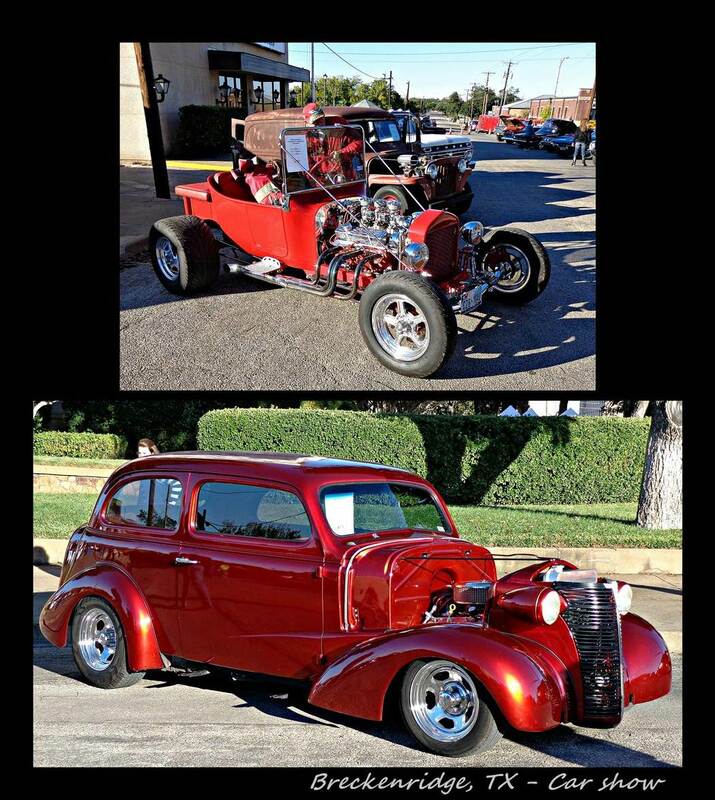 We arrived in Fort Worth a week before the Nascar racing weekend and therefore had some time to get most of the parts we still needed for the cruiser. After a week of moving around between cheap camping spots, Friday finally came and we “fixin to” go see ourselves some bull riding, ya’ll! 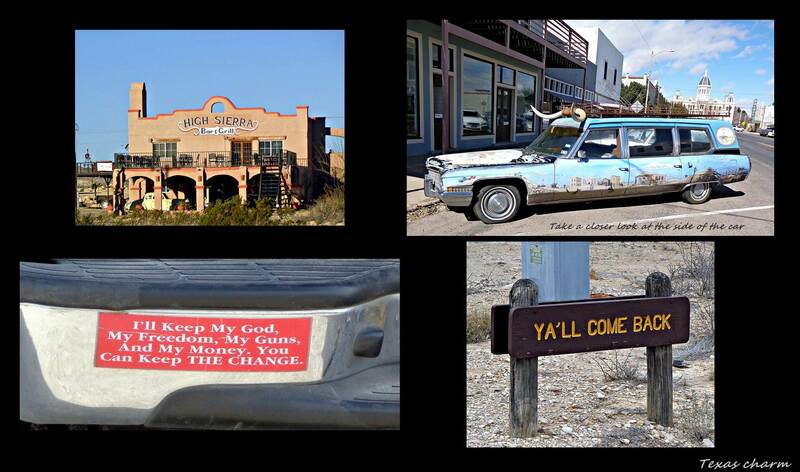 (The week in Texas had proven useful afterall!) So I put on my new Cowboyboots I got as birthday gift and off we went. As most events in the US, the rodeo started with a tribute to the US soldiers fighting bravely in the war, followed by the proud hand-on-your-heart singing of their national anthem. It’s always moving to see how much these people love and believe in their country. 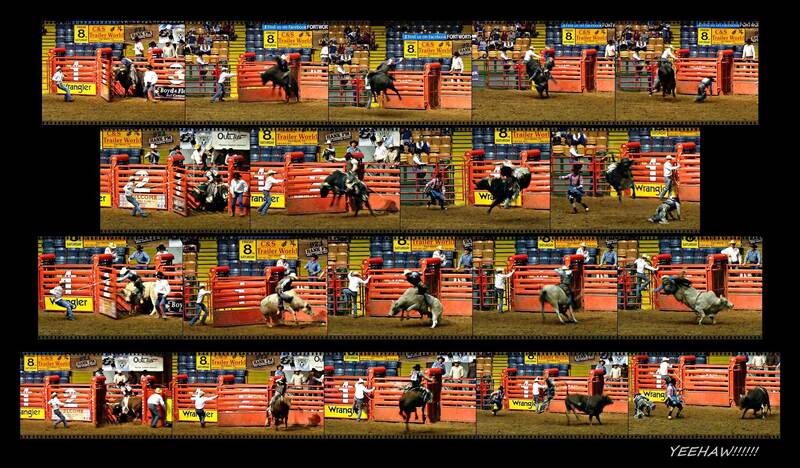 The show was a total of 2 hours long and consisted of various events which real cowboys (and cowgirls) competed in. Events included full-on bull riding, one cowboy on a horse chasing and catching a calf with a rope, two cowboys on two horses chasing and catching a bigger calf with ropes and finally cowgirls holding on to their horses by the skin of their teeth whilst racing between cones. In between events clowns entertained the crowd with silly tricks and had various ages of children come onto the arena to chase after sheep and calves. 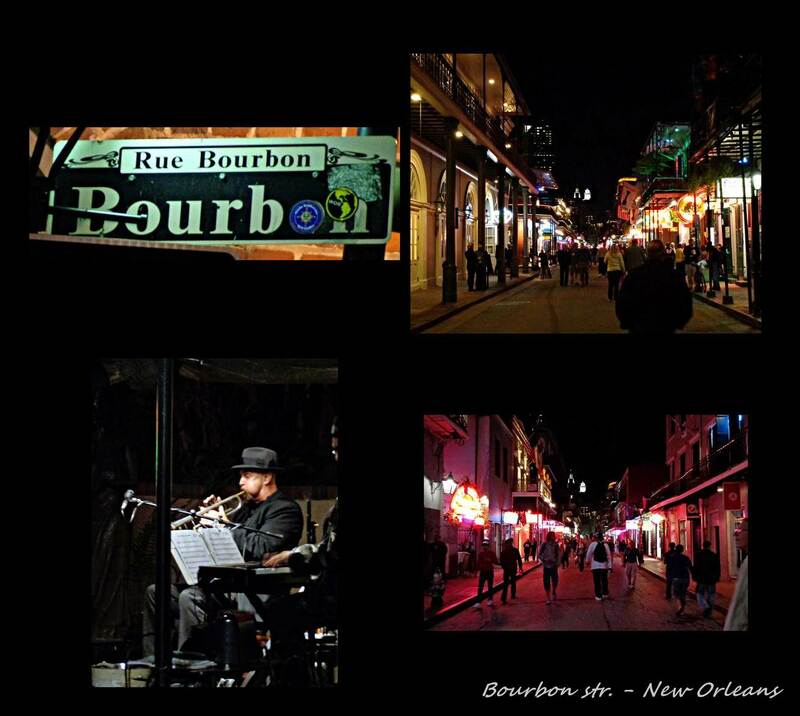 It was all we expected it to be and we enjoyed the night out on the town. The next morning bright and early we were up and ready for a day of Nascar racing. 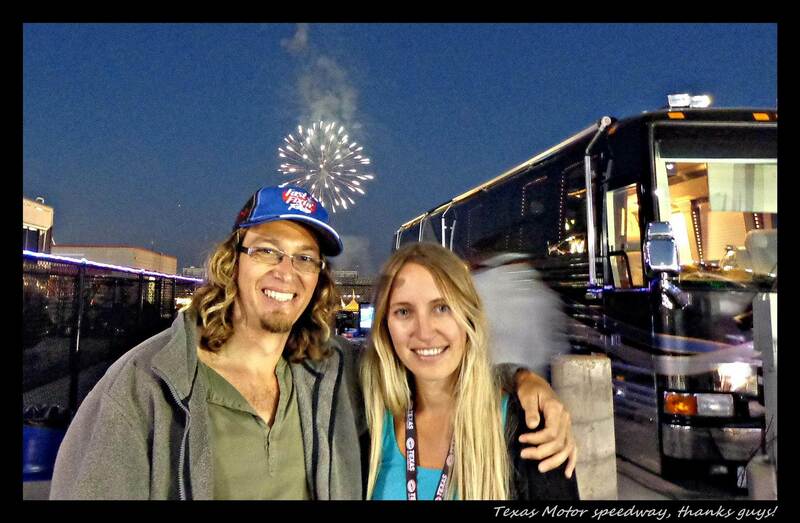 Neither of us had ever seen nascar racing live (well, to tell the truth….I wasn’t exactly sure if we were talking “Days of thunder” cars or “Fast and the furious”) and even early that morning you could feel that there was a buzz about the whole area. 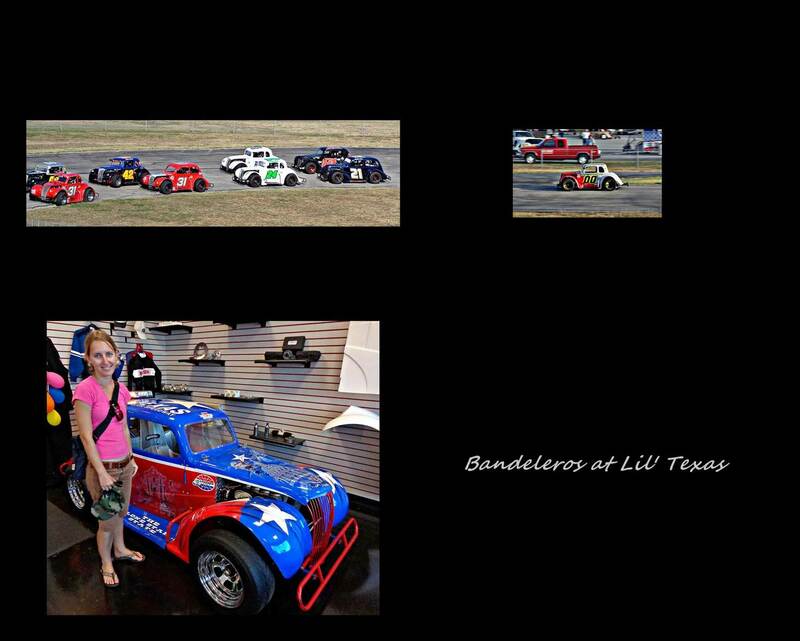 Even though the gates for the race only opens at 13h00, at 10h00 that morning the program showed that there would be the bandeleros racing at the Lil’ Texas raceway also located within the grounds of the Texas Motor Speedway. This is where miniature racing cars (similar like a go-cart with a body) drive around a 1/5 mile track. 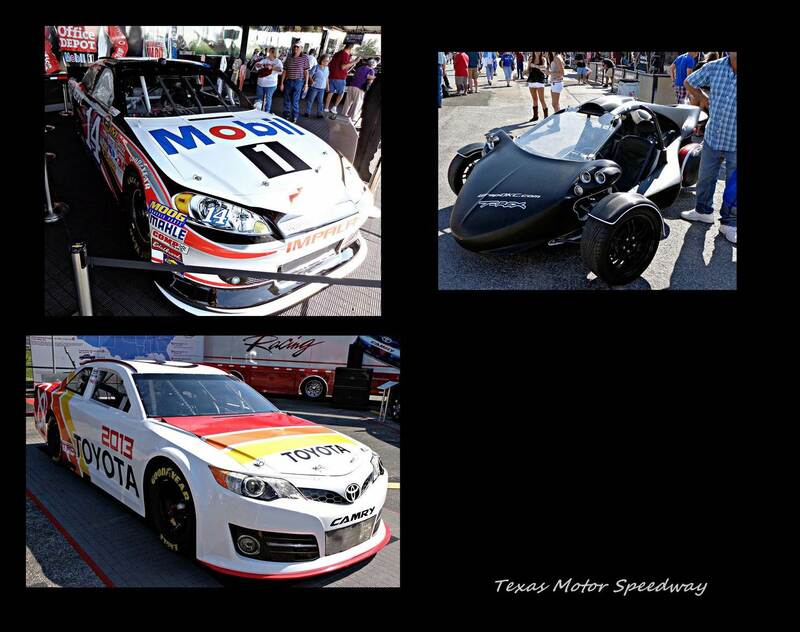 And what is even more amazing is that these miniature race cars are also mostly driven by miniature people! The winner of one of the races was a mere 8 years old! After he won the race he came out like a true superstar to sign some autographs…he must be the coolest 8 year old in his class! We had decided that as the race was such a splurge, we would buy ourselves buns and viennas so we wouldn’t have to buy them at the race. On one of our many trips to the cruiser to make another hotdogs, two guys and a girl pulled up in a golf cart next to the cruiser. Being in a place where cars are the main event, it had not been the first or the second time that day that someone had stopped and asked a few questions. After giving a well-prepared (by this time) rundown of most features, the one guy wanted to know where our tickets were in the stands. Once we had told him, he invited us to rather join them. We expected a private box with a few friends, but we were swept away on the back of the golf cart to an area next to the track which we didn’t even know existed. It is a site where one can park your full size bus RV whilst looking out over corner 2 of the track (the corner where most accidents occur). 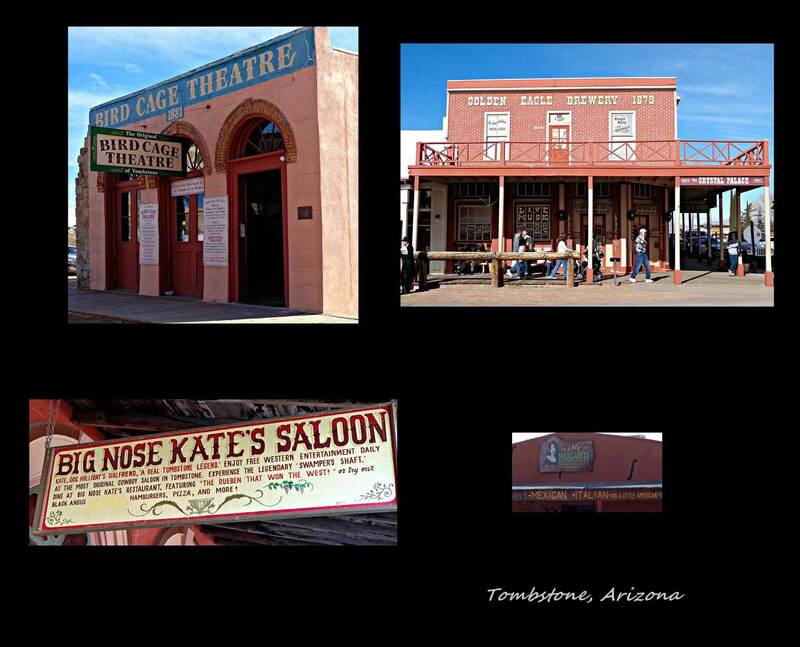 These sites, of which there are only about 50, are not booked by buying a ticket at the souvenir shop as we did. These sites are rented per year for a rather large sum which provides the renter with tickets for about 20 people for three races in that year. So now, thanks to new friends Ben and Sarah we had the best seats in the house and, although we had already eaten enough hotdogs to last all day, we had a great buffet of beef, salads and hotdogs! 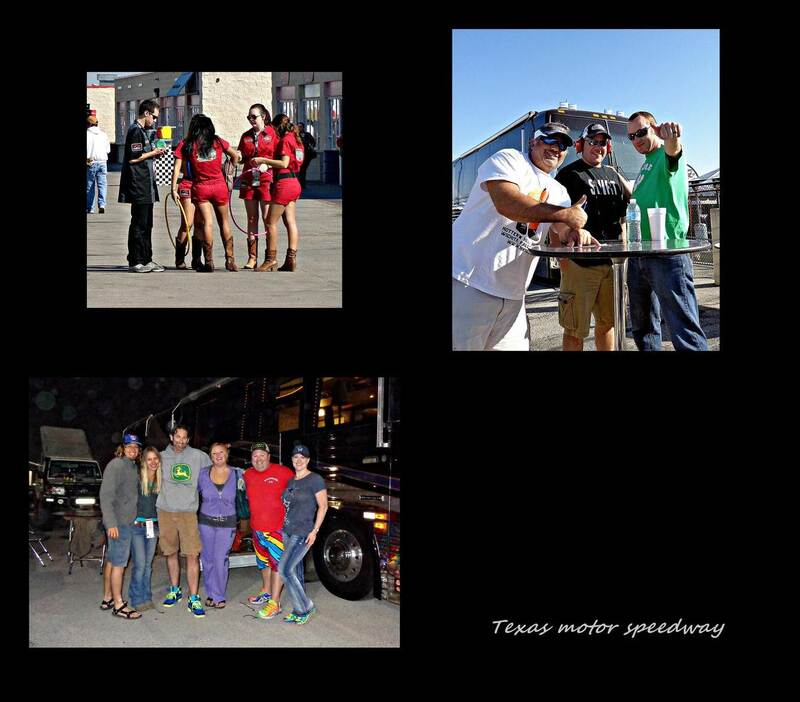 Thanks to friends of theirs Tulip, Crystal, PK, Brad, Brandon and Buddha we had trackside commentary and explanations of how things work and we had a great time just simply watching the cars pass at a whopping 190mph! 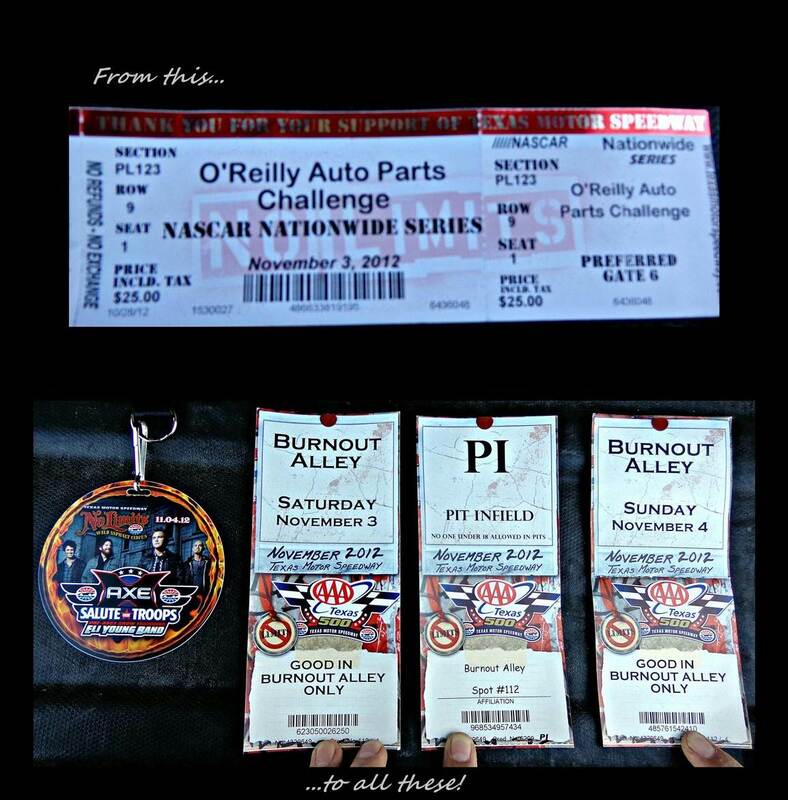 Then, to take things to a whole new level, thanks to Ben and Tulip we got to see the big race on the Sunday and furthermore PK organized for us to go and camp in the infield! These tickets are available at the souvenir shop if you book early and we heard that they go for something like $500 per night or per weekend…either way it’s a bit more then what we usually pay for camping! 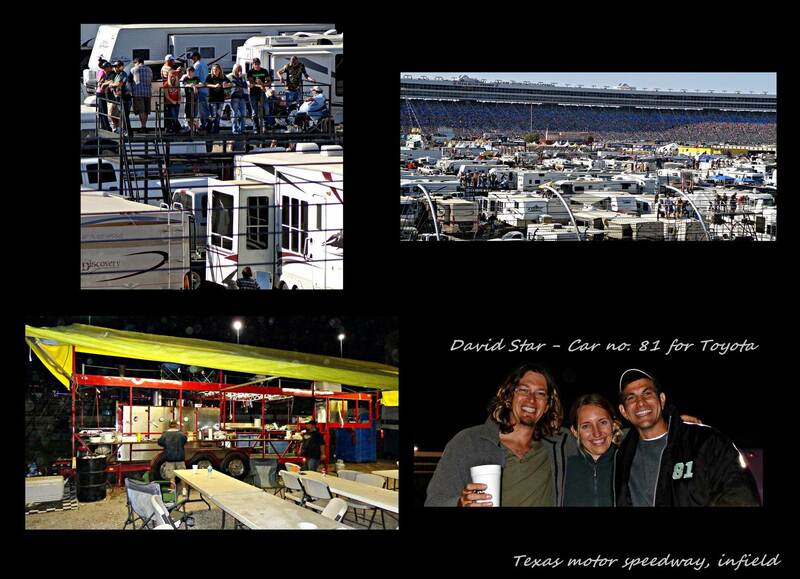 It was a wonderful and weird experience filled with super-rich folks driving around in $2 000 000 RV busses lined with alligator and ostrich leather, Nascar racecar drivers like David Star and caterers giving us free food from their 8m BBQ/smoker trailers brought over for the race weekend by gazzionaires just to cater for their guests. After getting to bed at around 2am that morning we had a shower and were ready for 300 rounds (1.3 mile) of really loud cars! The race wasn’t very eventful with regards to crashes, which we guess is a good thing considering that some crashes result in fatalities. We had another great buffet lunch and finally ended up parking the vehicle right next to Ben and Sarah’s RV for the night. 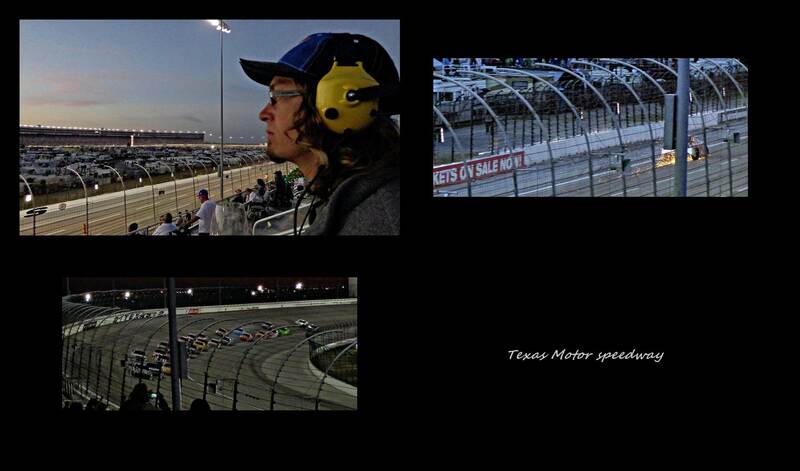 Thank you so much to each of you guys for an AWESOME Nascar racing weekend! 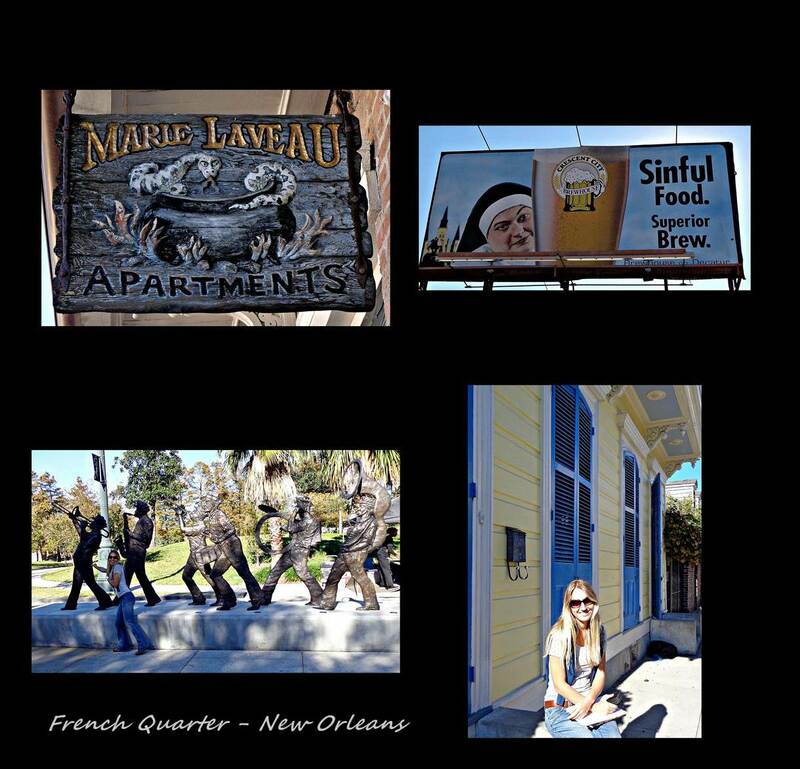 We had some time to spare before we were flying back to SA out of Houston, TX, so we figured it might be a good idea to go and see New Orleans in Louisiana. 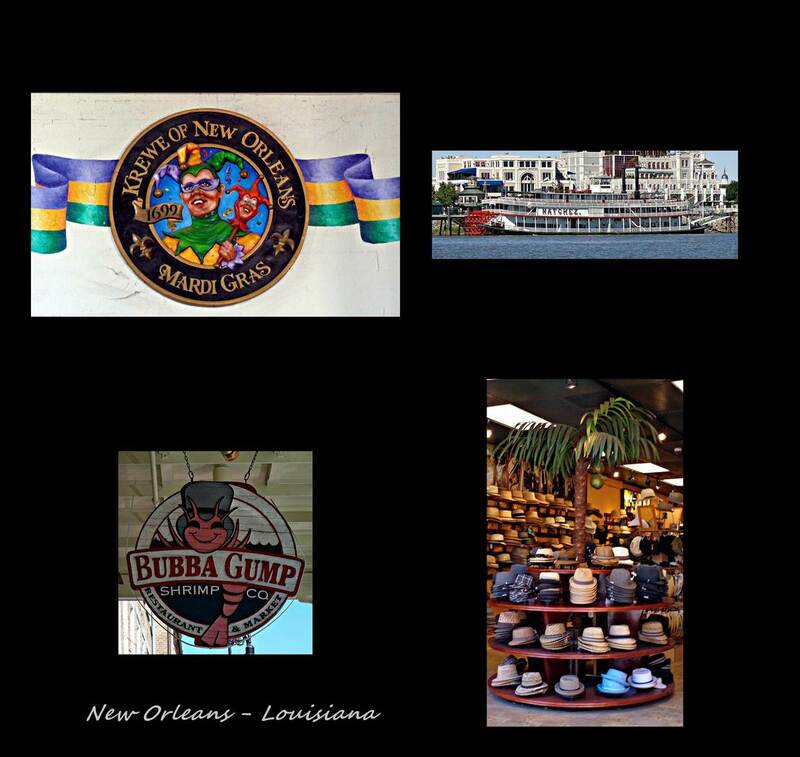 On any normal day, it is known as one of the party capitals of the US, but THE party, aka Mardi Gras, only happen once a year in February. 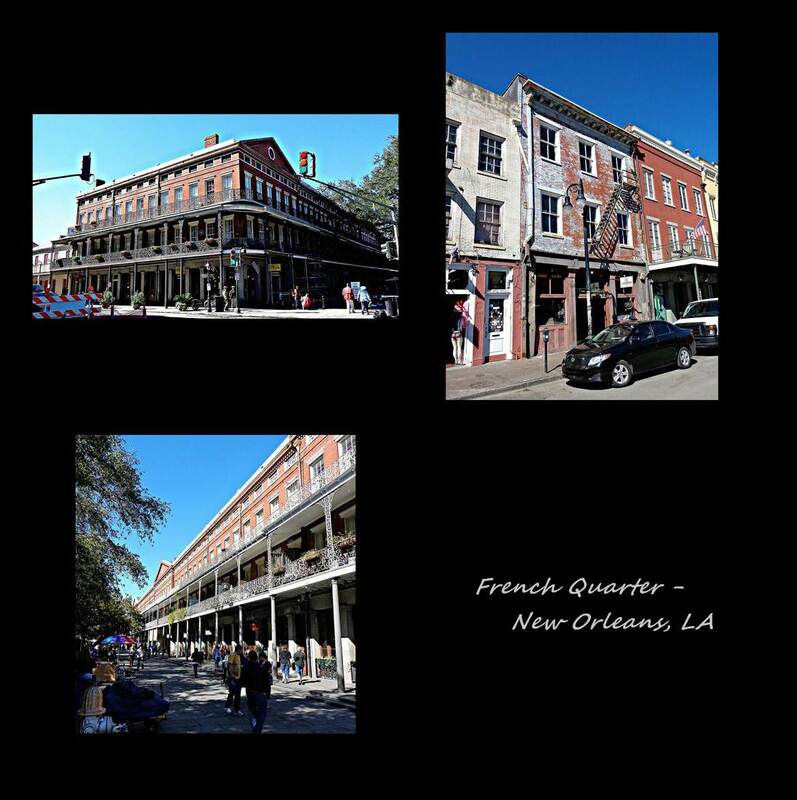 It felt like it was one of those ‘too early, or too late’ things that have been haunting us since the beginning of the trip, but after spending a day in the French Quarter where Mardi Gras is held, we were really glad we weren’t there at the right time. 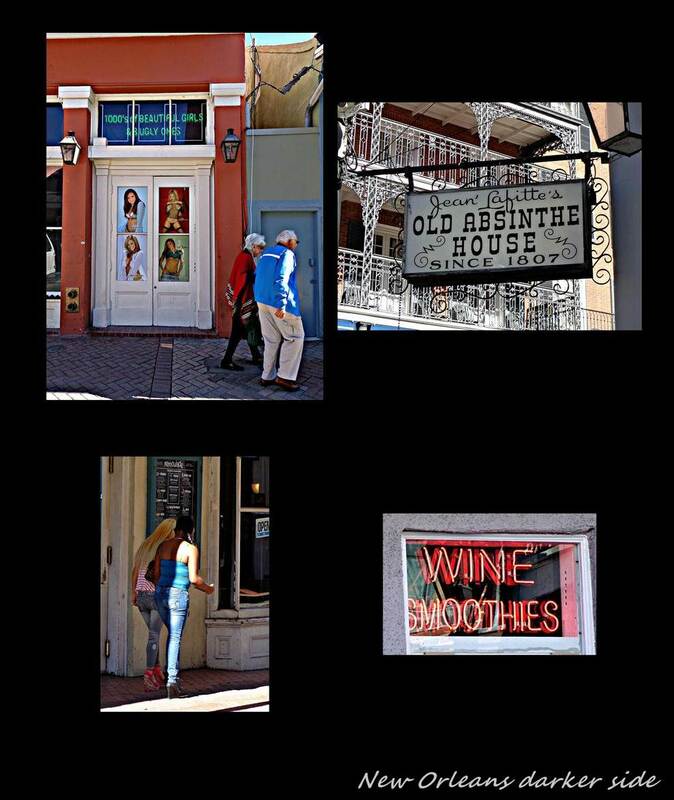 If Las Vegas is sin city then I’m not sure what to call the French quarter…here you will see numerous fortune tellers using anything from hot sauce to Uno cards to tell you what the future will hold, three-quarter naked girls trying to lure you into their club from the street with their dancing, drunk elderly ladies swinging their way down bourbon street with a beer in the hand at 13h00 in the afternoon, all things voodoo including dolls, books and off coarse your own personal priestess you can visit in the voodoo temple (if you absolutely have to put a curse on that ex-boyfriend. 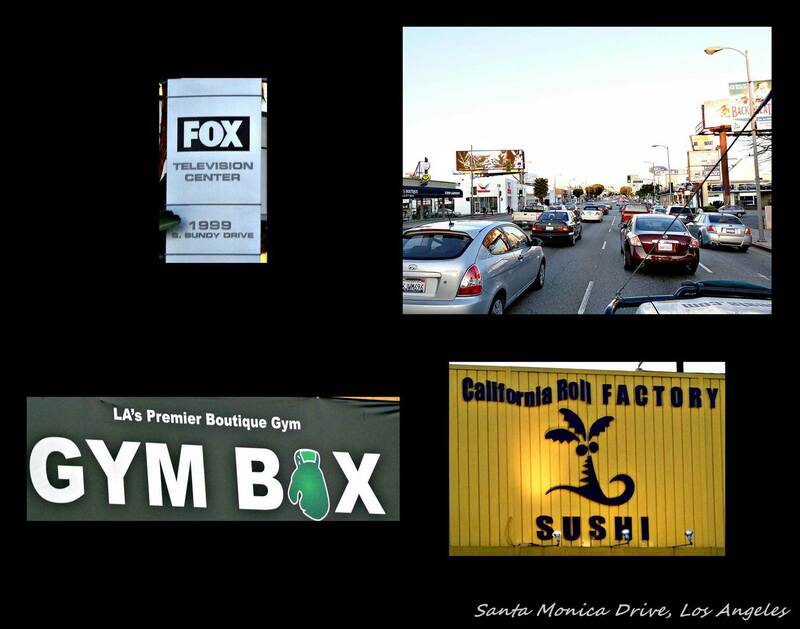 There were some good things about the area as well, like….well…. the food known in short as Cajun. 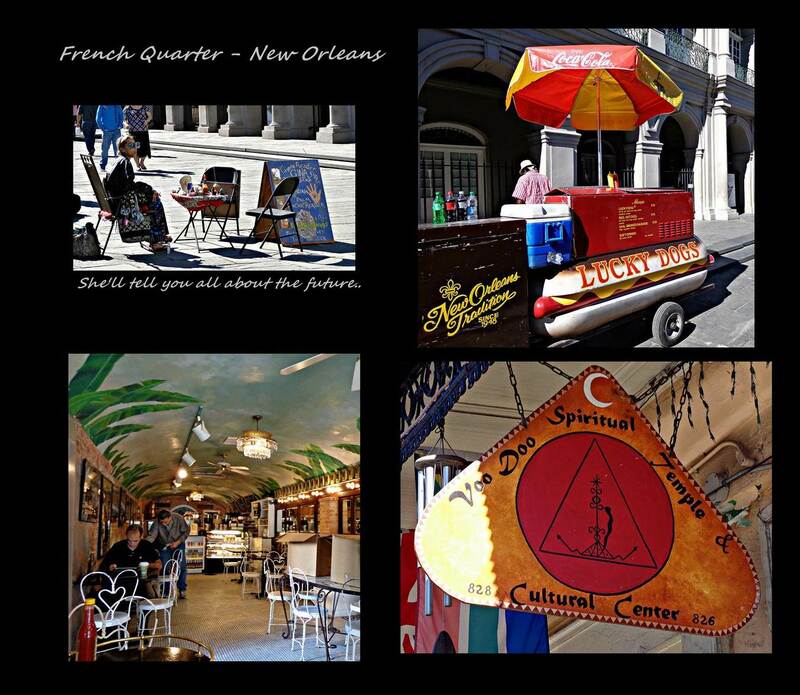 We had Beignets (a fluffy French doughnut which taste exactly like a very light vetkoek sprinkled with castor sugar) for lunch and some Gumbo (a thick, butter-flour based soup with any variation of meats such as shrimp, chicken, duck okra (vegetable) and andouille (spicy country sausage) and bread pudding at an authentic New Orleans hangout called Lil’ Dizzies. From the photos it is probably apparent that we also enjoyed the architecture, especially the shutters. I however shutter to think how terrible it must be to live there when Mardi gras is in full swing. It was a good experience for the most part and to say you’ve been there is priceless. PS. For all you people out there thinking you’ll sleep at a Walmart nearby, think again, they all have no overnight signs which forced us to drive way out of town to find a spot to sleep for the night. 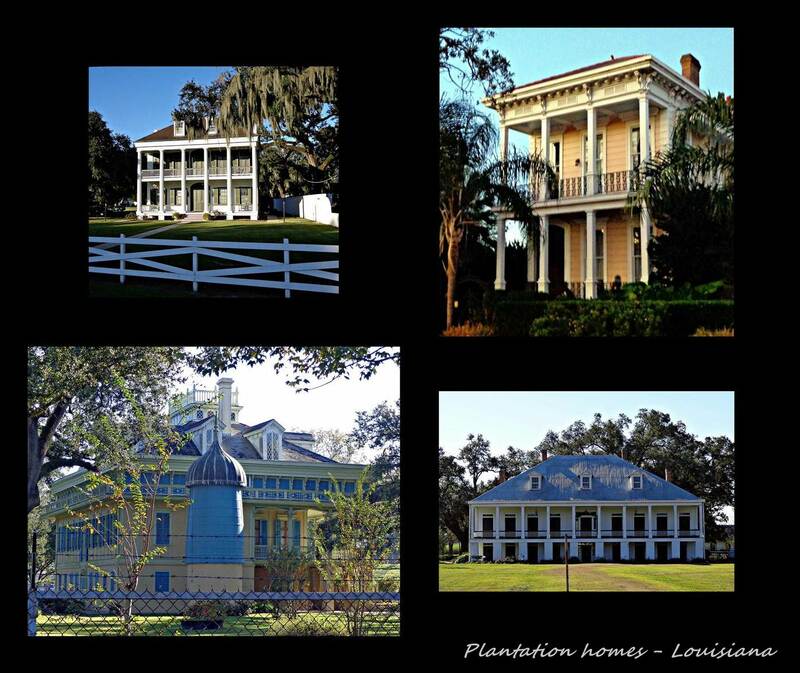 One of the other attractions that Louisiana has is the old Plantation houses found along the Mississippi river. Think Forest Gump…or Notebook. 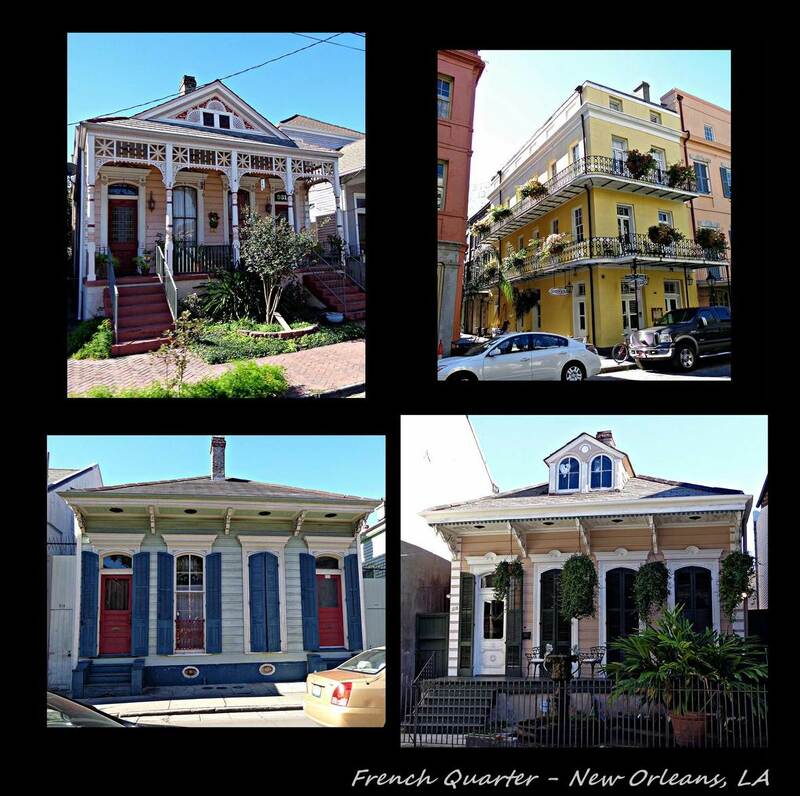 These mansions date back to 1718 when New Orleans were founded and have since been worked for food by Germans, Acadians (French-speaking people that migrated to Louisiana from Nova Scotia). 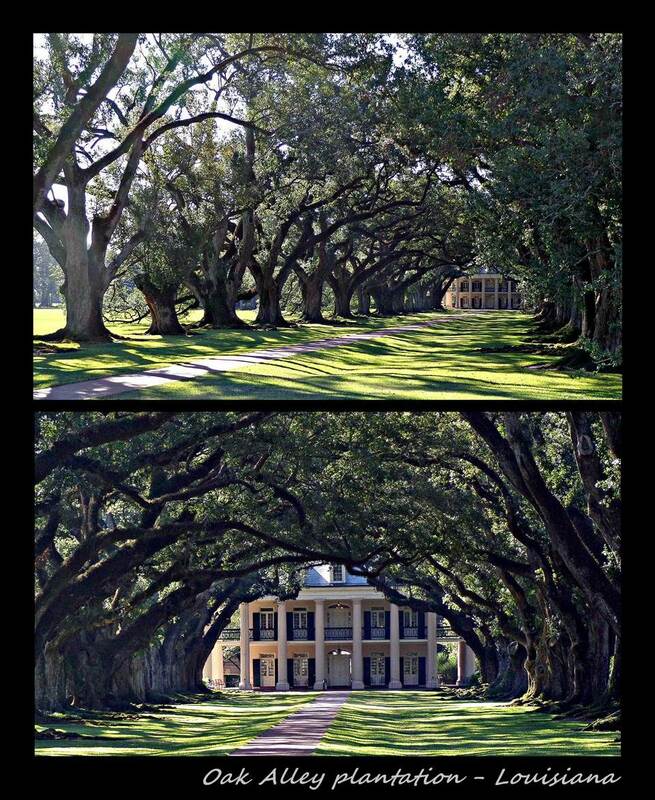 If you’re really grand you can stay at one of the eight plantation homes and get a tour (and apparently a few ghost stories) of the place. On our way back to Houston we stopped at a boat launch campsite close to the town of Franklin, LA. Our very kind host called Guy went out of his way to make us feel super welcome by offering us a shower in his office building and even bringing us breakfast one morning…true Southern hospitality! He told us that most of the footage used for the alligator hunter s reality show called “Swamp people” comes from that exact river. Although Guy warned us about the mosquitoes at dusk, we still thought that the alligators were our biggest threat…but once again we underestimated these small monsters. Although we wouldn’t say that Louisiana is as bad as Alaska, it sure brought back some horrible memories and lapses in sanity. Guy mentioned that we might like to stop at Avery Island on our way west and we were glad we listened. Although it’s not the island surrounded by great open water that one might expect, it is surrounded by swampland and there is only one road going in and coming out. On the island we visited the Tabasco sauce factory and got to see where each bottle sold in the world comes from. Mr McIlhenny and his family has been producing this sauce since the post Civil war era and the recipe he used back then is still used to this day. Although I couldn’t get all the Tabasco branded kitchen accessory my heart desired, we each got four miniature Tabasco sauce bottles to take home…yeah! Our final stop in Louisiana was Holbrook park, Sulpher. Here, the campground host, Harry, his wife Edna and two daughters Carson and Cameron gave us a very warm welcome and invited us to have some Gumbo at their house. They treated us to a great bottle of wine and a giant pot of delicious gumbo which we ate way too much of. Harry has only been there about two or three years but has turned the image of the park around completely. It used to be run over with drug-users and low-lives but since he’s been taking care of the place families can now come and put up their camp here without any worries. They are wonderful people which we were privileged to have met. Finally back in the lonestar state of Texas, we said goodbye to our tenthome on top of the cruiser for the next two months and stayed with Liza and Jim. They invited some friends over and treated us with great food and good conversation. Before we finally boarded the plane to come home we spent a wonderful two nights with Martyn and Sue that was kind enough to invite us into their home. We went out to dinner and afterwards they showed us the Christmas lights of Houston’s rich and famous. We had a great time, thanks again. We arrived safely home after what felt like a million hours of flying and lay overs but have since recovered and are enjoying the comforts of home. We returned to the US after a much appreciated month and a half of relaxing with family and friends. The flight back was a thrilling 29 hours of pure joy as we had a layover of 10 hours in Doha. We landed late on the afternoon of the 18th of January and was thankful to stay with Martyn and Sue for a few days to find our feet again and do some necessary maintenance on the Cruiser. We also had a chance to catch up with Jim and Liza with whom we had a wonderful evening before heading westward. 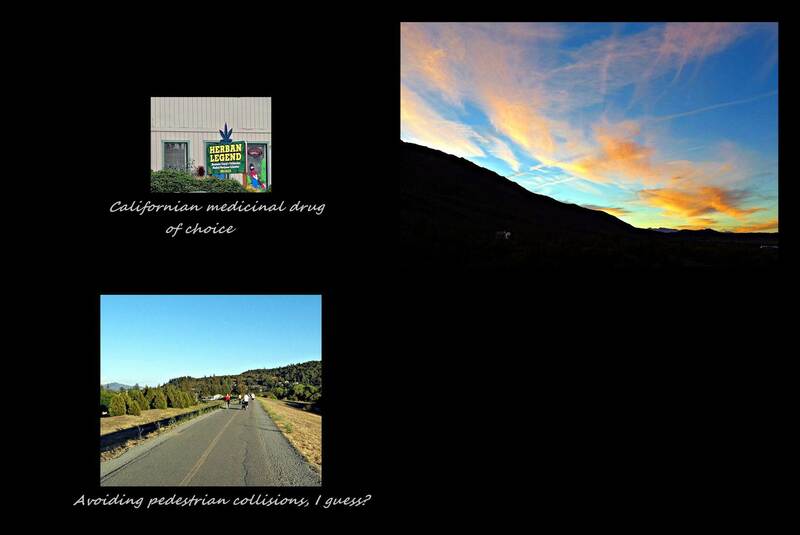 The road to the border between San Diego, CA and Mexico was long and for the most part uneventful. 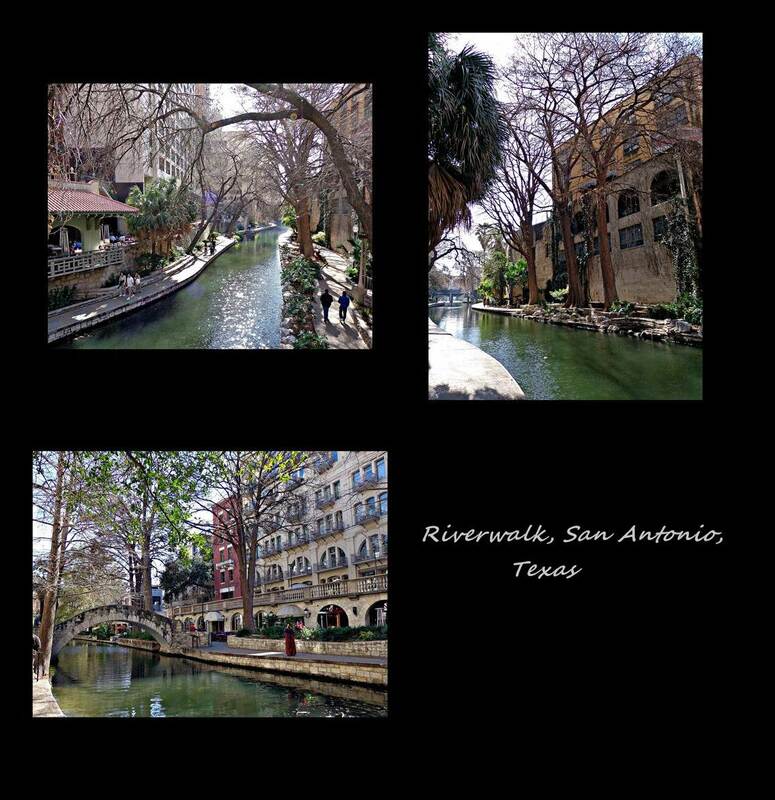 Highlights included the San Antonio riverwalk, feasting on a Texas Roadhouse steak in Arizona and hiking in the Saguaro NP. It took us almost a month to get over the Mexican border, funny because we thought it would only be about 2 weeks! To be fair, we did make a much regretted detour through Los Angeles to kill some time whilst waiting for some online deliveries. 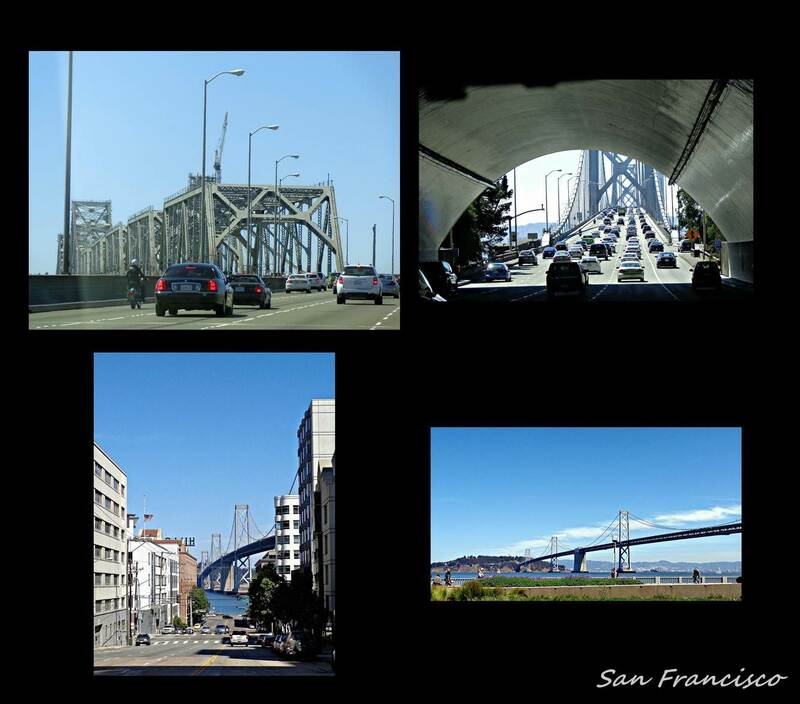 Los Angeles is a beautiful area with lush green rolling hill and dramatic ocean views, but like most cities it is expensive (super expensive in this case) and traffic and navigation takes most of the fun out of it. 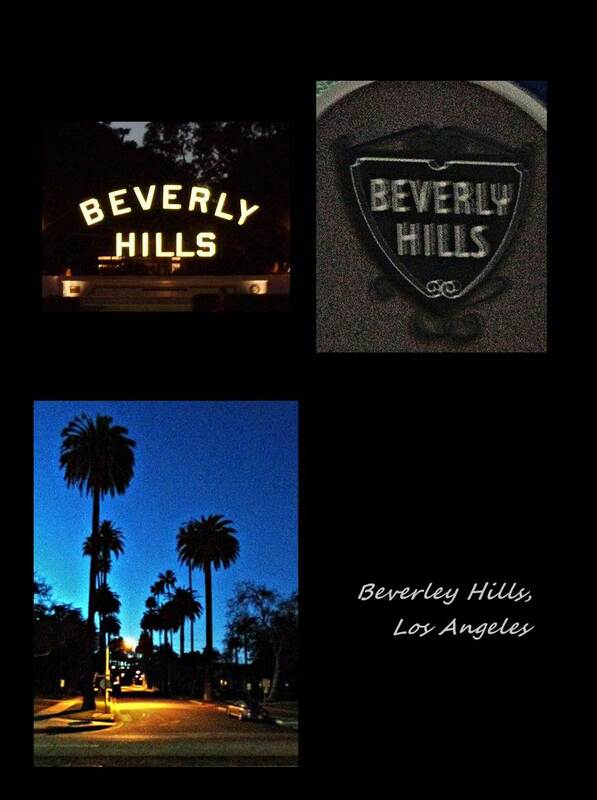 We ended up driving through Beverley Hill in the middle of the night after spending hours in peak traffic. As campsites start at $35 we drove out of the city up the infamous Hollywood hills to find a forest campground. Here, you don’t get mountain passes like SA’s Outeniqua or Van Reenen passes, which are properly marked and has two large lanes allowing for slower vehicles to get out of the way. No, here there are soo many hills that most roads are mountain passes and most are single lanes with very ineffective gravel turnouts and hurried Californians driving 50miles/80km per hour. Needless to say, the Cruiser with its large top-heavy canopy had no problem whatsoever keeping up with proverbial Jones’s! 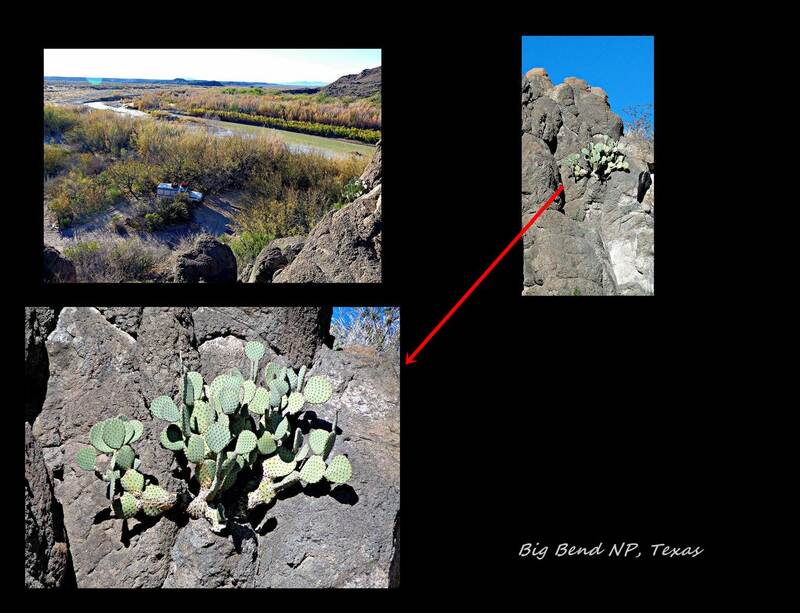 The seed from which these giants grow is no more than the size of a pinhead and one cactus can produce tens of thousands of seeds in a year and up to 40 million in a lifetime! 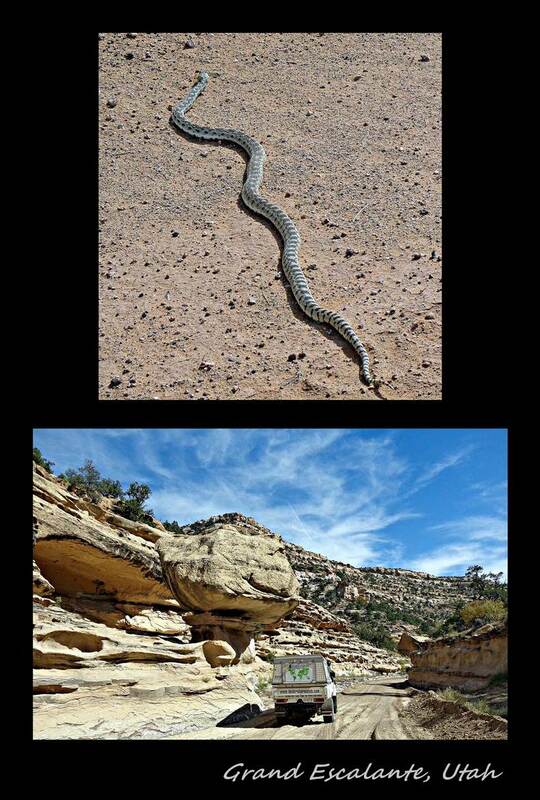 Considering that they can become up to 200 years old, their vast numbers within the Sonoran desert is not surprising. 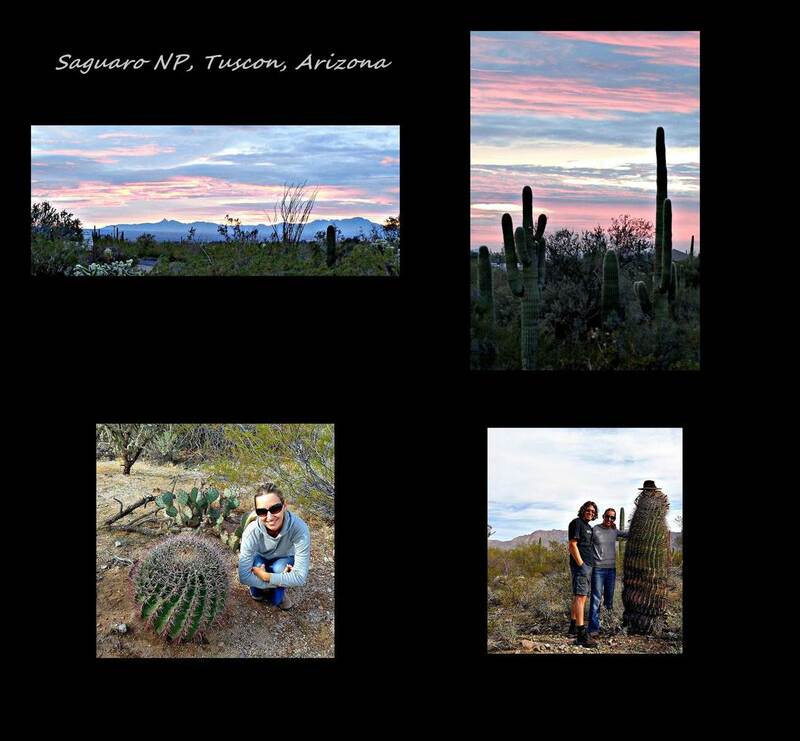 Saguaros grow in very short spurts during the summer rainy season. In a year, a seedling may only measure ¼ inch or 6 mm and by 15 years it may barely reach 12 inches/31 cm. At the ripe age of 30 years they begin to flower and produce fruit and only at 75 years it may sprout its first branches or arms. 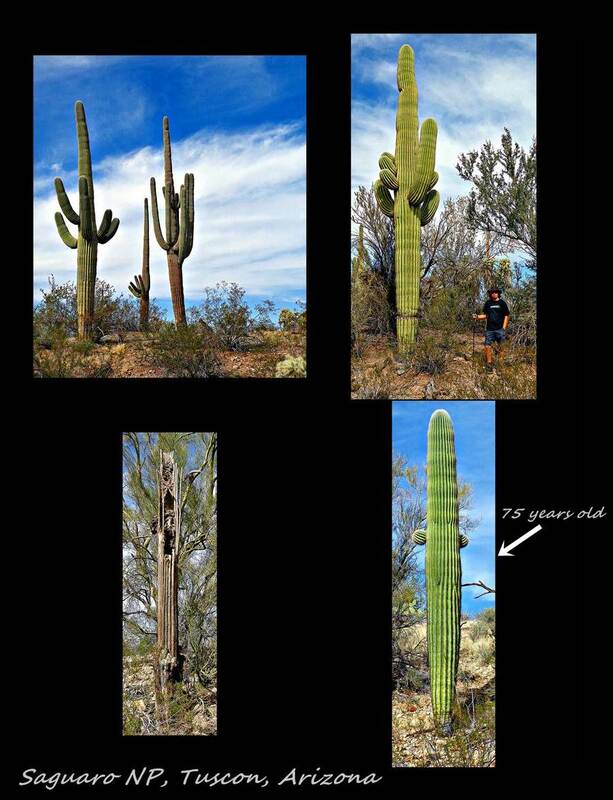 By 100 years old, the saguaro may reach 25 feet/ 7.6 meter and for those grandfathers that make it past 150 years sizes can reach 50 feet/ 15 meters and they can weigh as much 16 000 pounds/ over 7 tons! This huge bulk is supported by a strong yet flexible cylinder-shaped framework of long woody ribs which is all that is left once they die. Saguaros collect their water with a network of roots that lies about 3 inches /7.5 cm below the desert surface which can stretch as far as the saguaros are tall. During a single rainfall, these small roots may soak up as much as 200 gallons/over 750 liters which is enough for the plant for a year! They store this precious moisture with the help of accordion-like pleats which expand following collection of water through the roots. Photosynthesis is carried out by the trunk and branches as there are no leaves and the spines covering the plant provide shade and shield the plant from drying winds and animals. As we drive through Mexico, it is easier to now reflect back on our time spent in the US. As it is the only first world country I have ever visited my comparison of how well things work there is likely very similar to any other first world country. However, coming from South Africa, I definitely underestimated how well a country can function. They call themselves the home of the brave and the free and spending almost 8 months in their country, I can easily vouch for the latter. This may at first not be apparent when you encounter the endless signposts telling you what you can and cannot do, but when you spend some time there you start seeing the big picture. Yes, if you wondered if can drive off the main road, there will be a sign in the vicinity, and if you want to pull off the road for some coffee you needn’t wonder where to go, there will be a rest stop with tables and chairs meeting all your possible needs. On the other side of this coin of rules however, are designated areas where you can drive in any which direction on the beach with your all terrain vehicle of your choice or if you feel like it you can drive off the side of a mountain with your bicycle, you can vote on the amount of sales tax you think should be charged and on what you think should happen to criminals. What becomes clear is that the American peoples have perfected democracy. Within their endless amount of rules and regulations they have left enough room to do anything you could possibly think of, making you feel free. This freedom in turn syphers through to their way of living and being. They have everything they need right there, they have nothing to prove to anyone and therefore have no problem saying anything they think. No fear of not being good enough, they have the freedom of just being, freedom of pride and prejudice. This is not to say that we are oblivious to the problems in the country and by no means think this is some kind of utopia, but here a country that makes their Christian beliefs a part of their everyday lives, who stands up for what they believe in (even when the rest of the world frowns on their involvement), who says what they think without worrying what others may think. They can almost never be found without a large big gulp or coffee flask in the hand, a smile on their face and a stray rescue dog and cat on a leash. But more than anything they are will give you the shirts off their backs if you needed it! Thanks US for restoring a whole lot of faith in the human race and for showing us the bright side of life! Just saw your rig in Las Vegas NV! 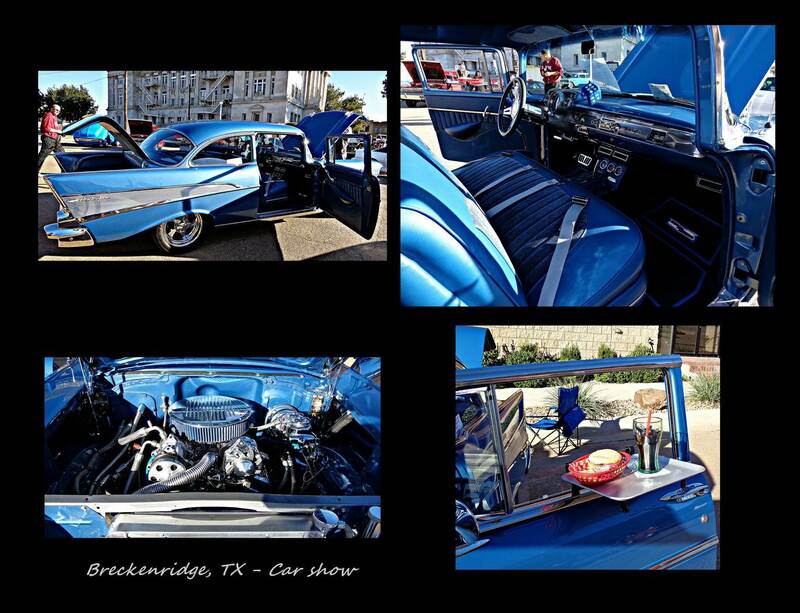 Great looking ride, you folks were about 1k east of the famous Las Vegas Boulevard, heading north on Maryland Parkway. I was the police officer driving next to you for about 1/2 click. Figured if you noticed my patrol vehicle you might think I was going to pull you over, but I was just admiring your rig. Hi Julle 2, Ag dis weer lekker om julle “reisverslag” te lees! Dat julle nie aan die siekte “verveling” lei nie is so duidelik soos daglig. Elke dag en uur iets anders, wonder net of julle ooit weer sal kan stilsit in ‘n fliek of konsert?? Julle sien darem geweldig interessante plekke en het heerlike belewenisse saam met die vriende wat julle langs die pad opdoen en julle ook rondwys en “sag” laat slaap! Hier by my gaan dinge ou stryk en wag ons met opgewonde harte op julle terugkoms iewers in November. Hope you guys made it to the campsite at Cathedral Point after we spoke with you at Newspaper Rock.. all our kids were way inspired !! (not to mention I myself ) . What an amazing journey you are on ! Hallo Debbie, Dis 30 Oktober 2012 en dis jou verjaarsdag vandag! Baie geluk en mag dit ‘n wonderlike jaar wees wat voorlê. Hoop jy het al ‘n lekker daggie gehad sover. Die Heer se seën jou toegebid vir die toekoms. Ook aan jou Marius hou lekker verjaarsdag saam!! Sien uit na die middel November hier by ons! 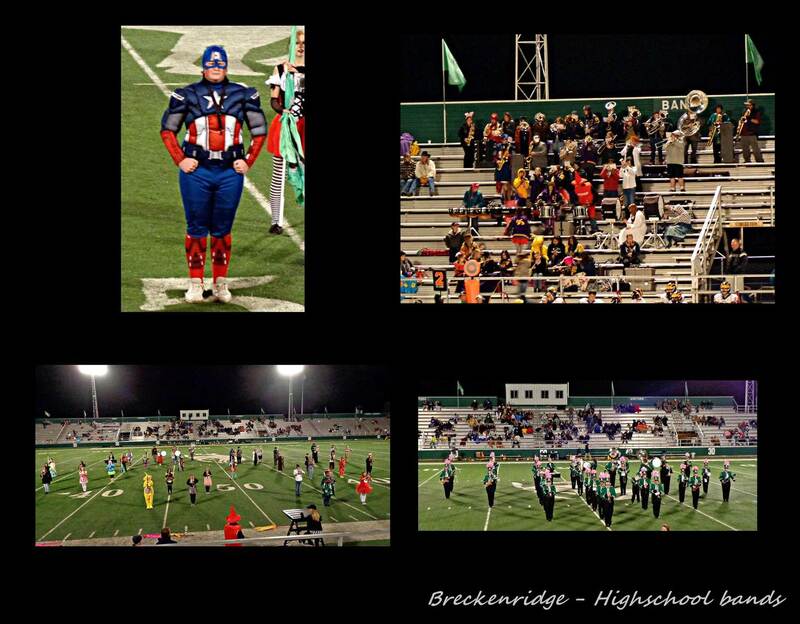 Loved having you guys visit here in Breckenridge, TX. It reminded us so much of South Africa. 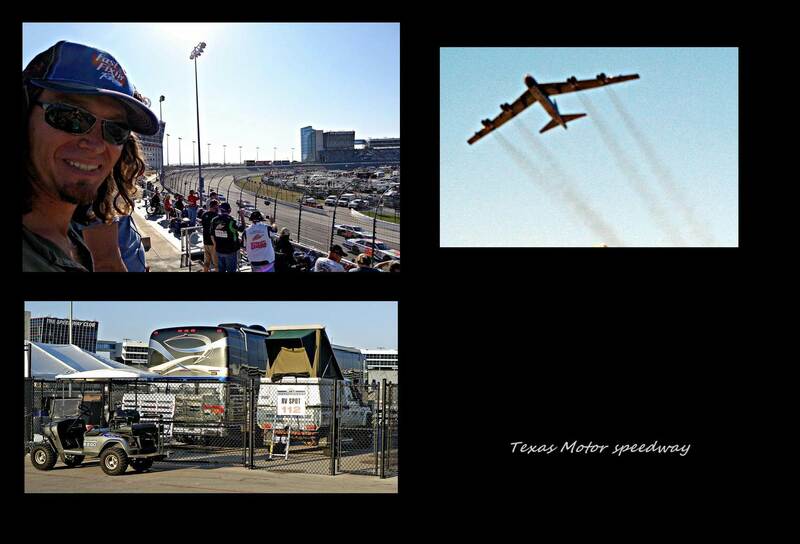 Trust you have a great time at the NASCAR and a wonderful time with family back in SA. 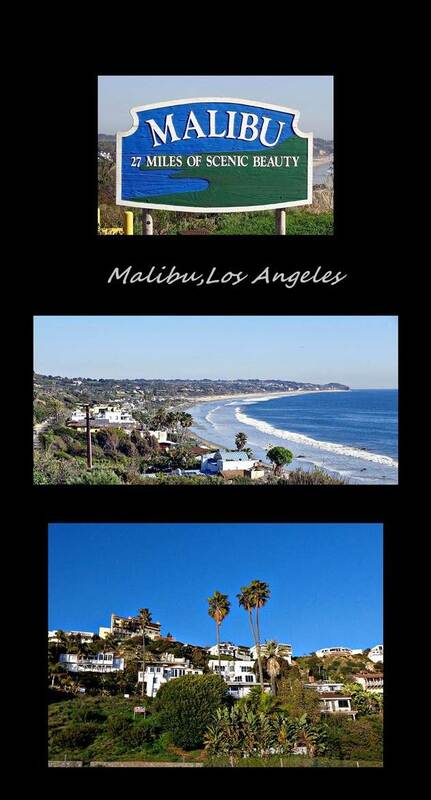 Come visit us anytime!!! Hey Debs, hoop jy”t ‘n heerlike verjaardag gehad en dat jy ‘n warm stort en sagte bed gehad het. Ons tel die slapies na julle terugkeer!! Lief vir julle tweetjies. 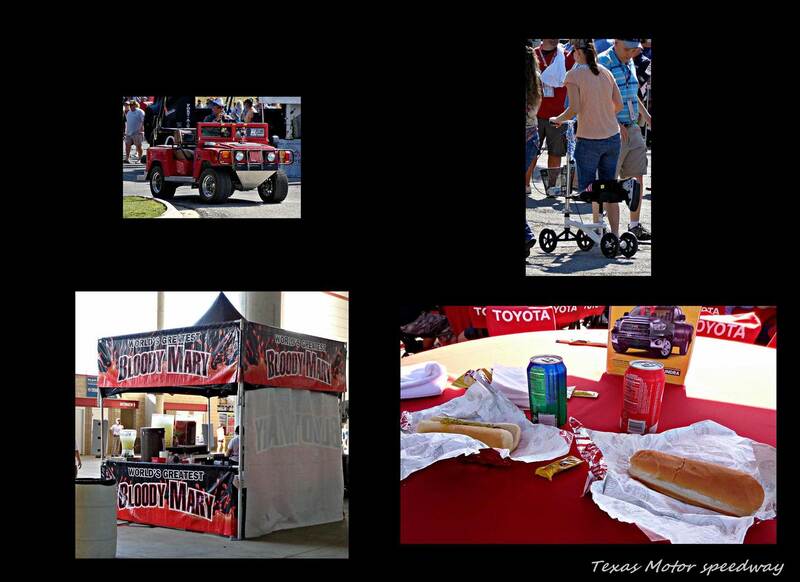 We enjoyed meeting you at the Center, Texas City Park. We are excited about reading about your adventures. It goes right along with our geography studies. We’re going to send you a flat Ethan in case you feel inclined to snap a shot or two along the way. 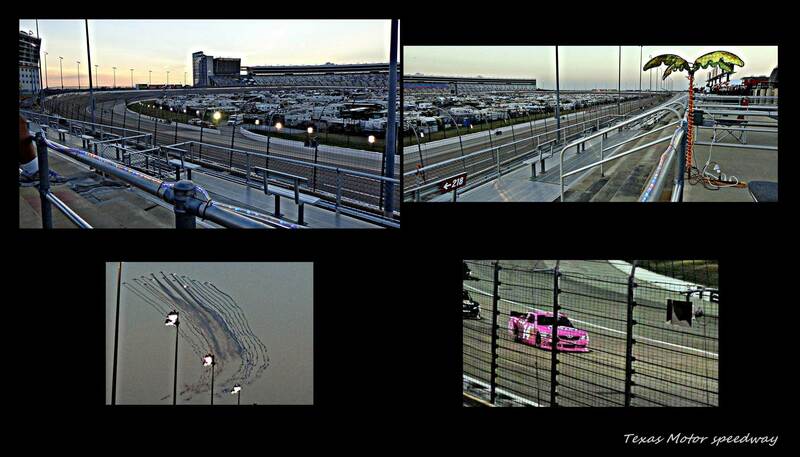 Can’t wait to see the NASCAR photos…might help me remember. Great to meet you guys, and hope you have a safe trip. I have just completed my second reading of the Oprah book you have left us! Already I am missing you guys! ahhhh ek mis jou Debs! I sure enjoyed talking with you at Jalama over a campfire. Being outside with a truck ,travelling and meeting interesting, intellegent, humans is the best! Sleater-Kinney is the greatest band ever, over. 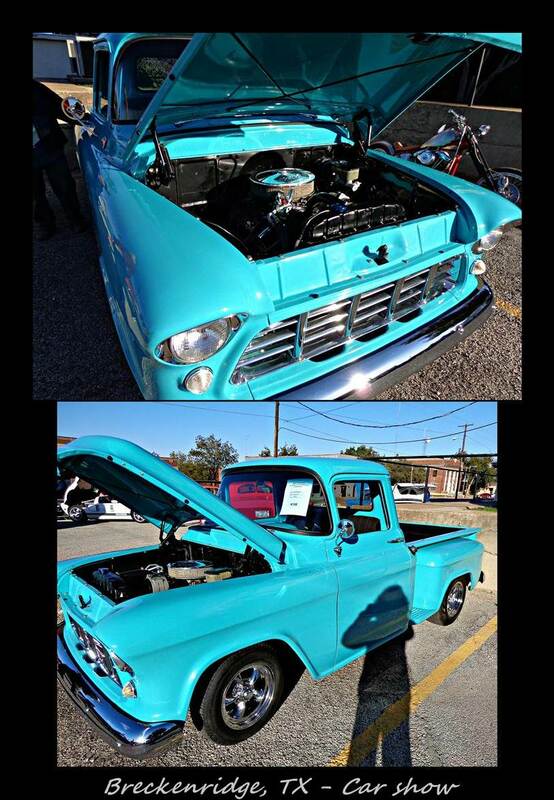 Love, Jeff (lifted grey Ford, no chrome, 6 spd.) Best wishes for your adventure! 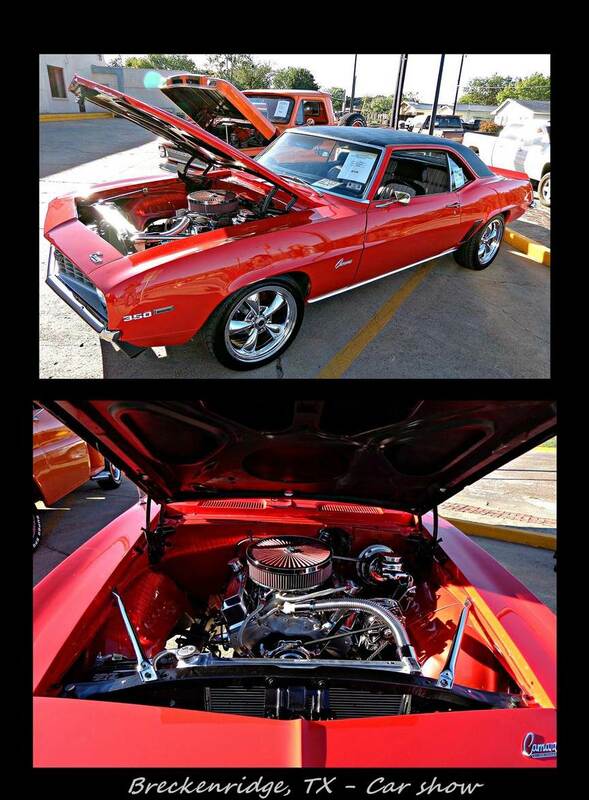 From Mike and Paula in Montell, Tx. 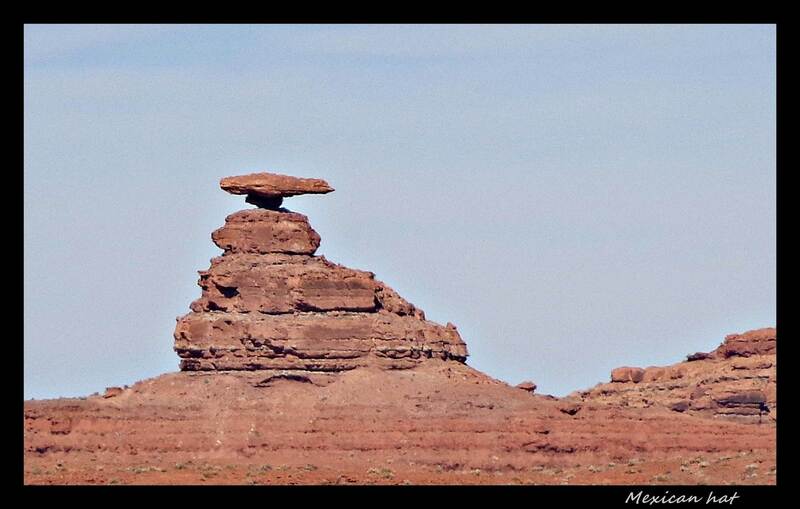 We met at newspaper rock in Utah. 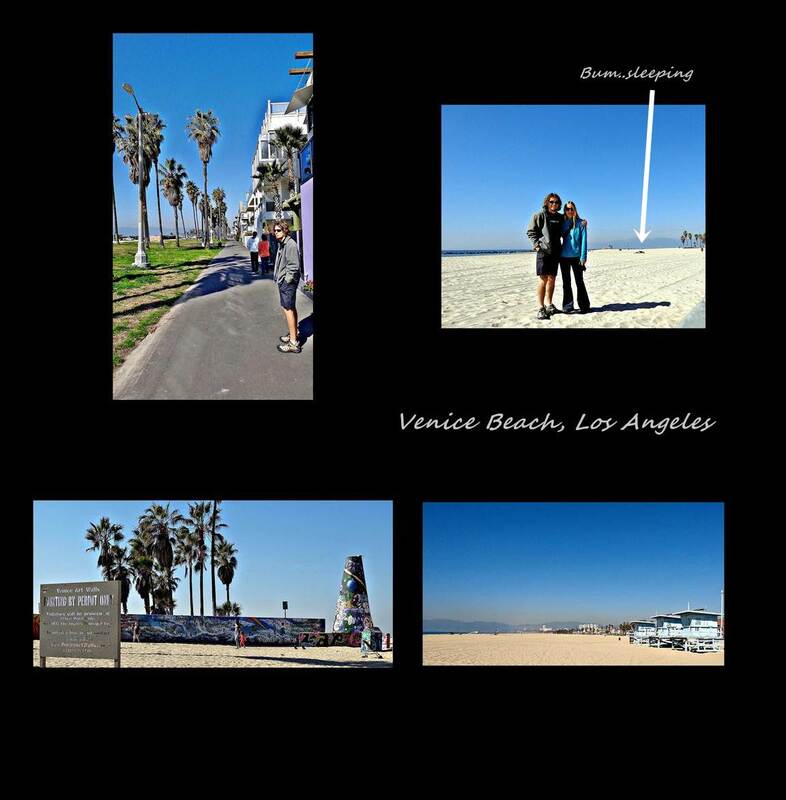 We really enjoyed meeting you and hearing your adventures. 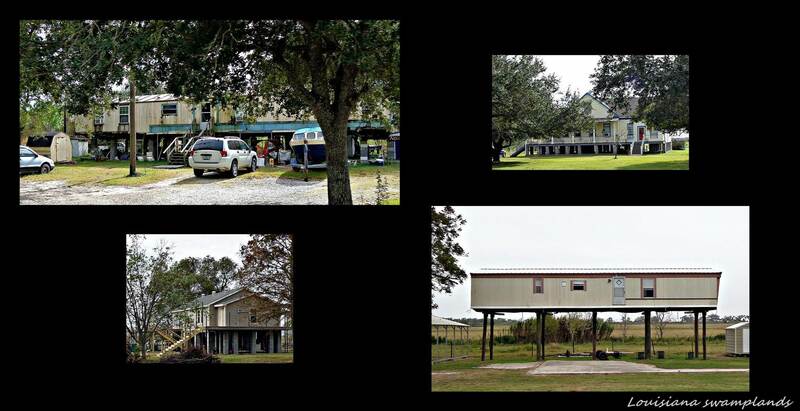 Since then we have a new grandson “Weston” and we are working on the beginning stages of our new log home. You have a great website. 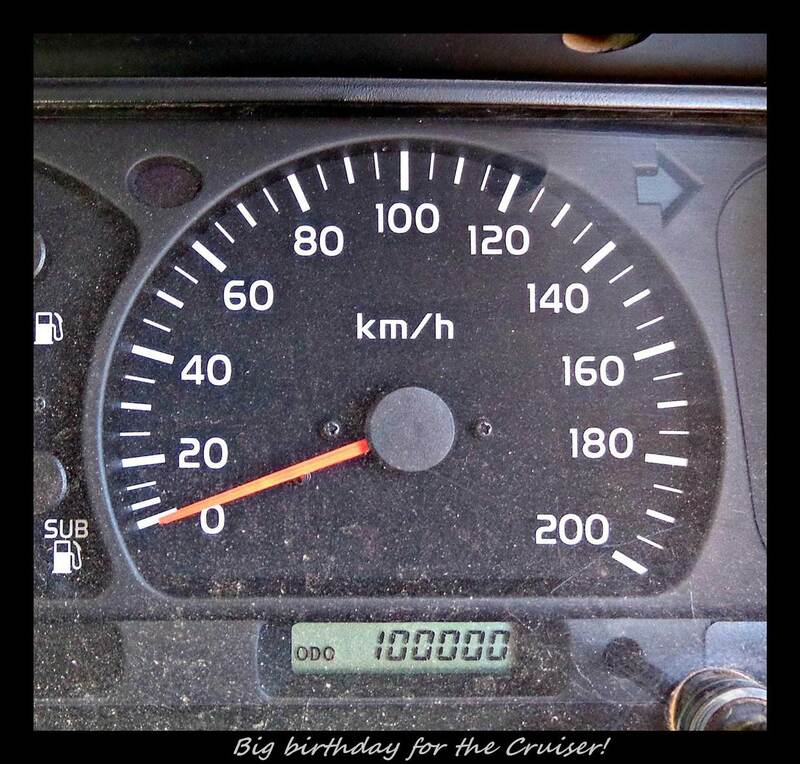 How’s the cruiser holding up? What a great adventure. If you come through TIJUANA, Baja California, Mx. PLEASE let me show you my city. 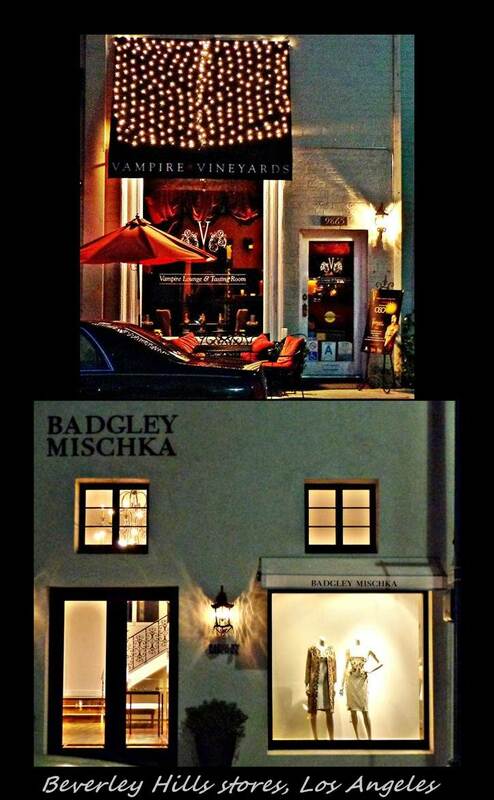 Will gladly host you in my great Town. From the ORIGINAL Ceasars Salad invented here to some of the best Sea Food in Mexico. Will give you major tips on what tosee on your way down the Baja Peninsula. If you have not yet gone passed here. We are a must. bajajulio@gmail.com Un official Adventure Ambassador. Hi guys. We met Nick and Lillian in Bishop, CA. we had just come off a 9 day adventure in the back country of the Sierras. We met them in a Kmart parking lot and convinced them to join us at a nice camp spot at Pine Creek, just North West of Bishop. What a great night, listening to the stories they told us about you, about their own travels and all the cool things they have yet to do. I wish you luck in your travels, and I will be following both clans to see what adventures you get into.